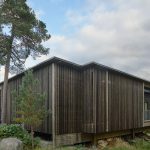 This project is a joint venture between us and Erik Hedenstedt at Ekologiska Byggvaruhuset, (The Ecological Warehouse) who act as both landowner and builder of the first prototype. 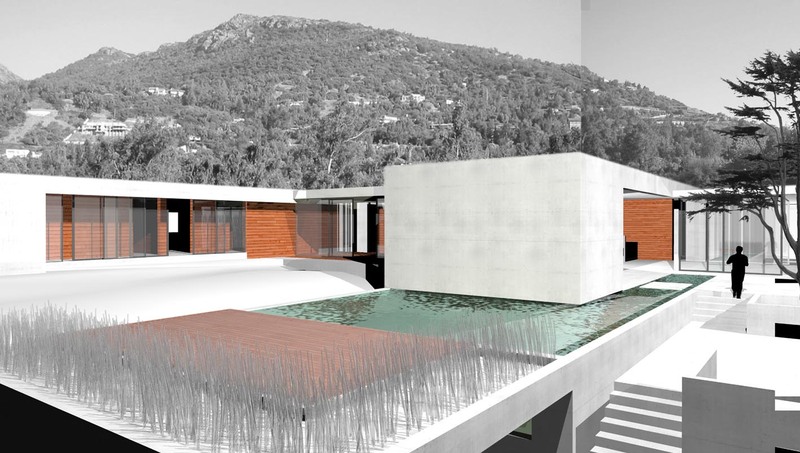 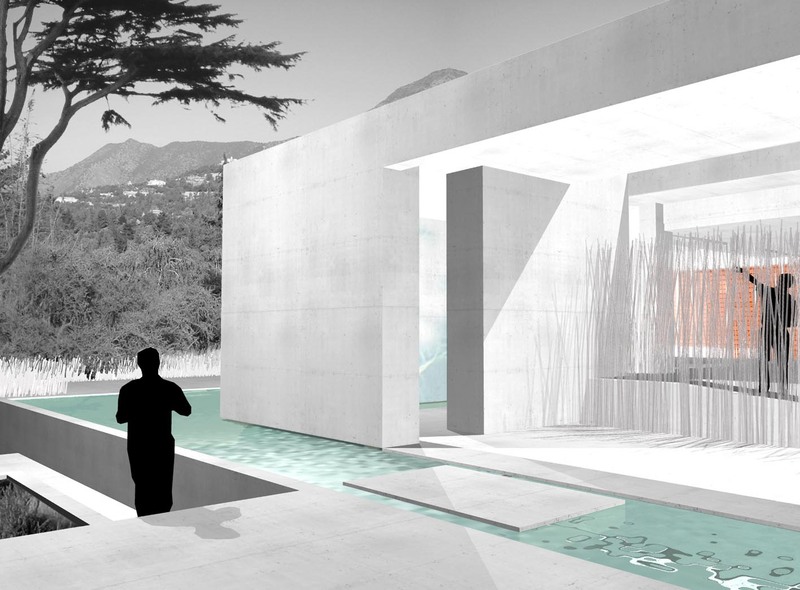 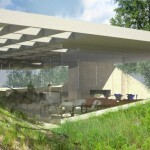 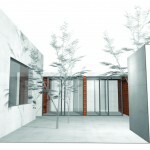 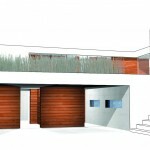 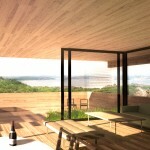 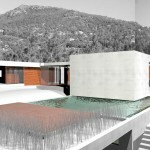 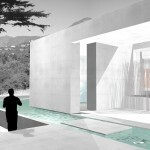 The ambition is to design and build a cutting edge villa using the latest in ecological thinking. 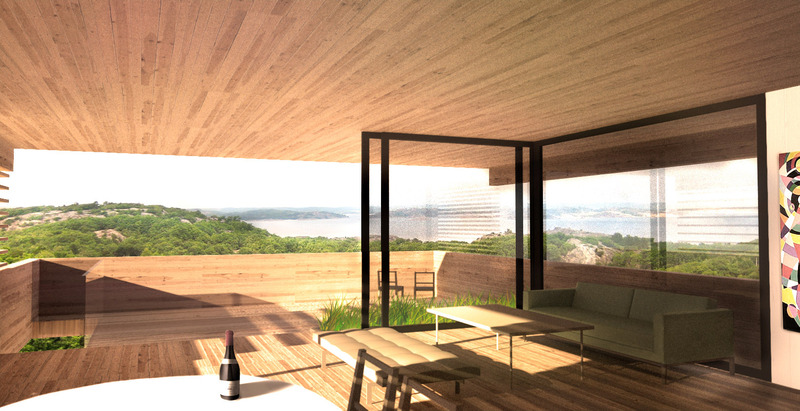 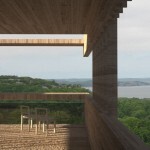 The site is a sloping wooden landscape facing south with a view towards the water inlet to the city of Trosa in a distance. 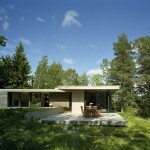 The area contains nature with high qualities and a key issue has been to build without destroying these nature qualities. 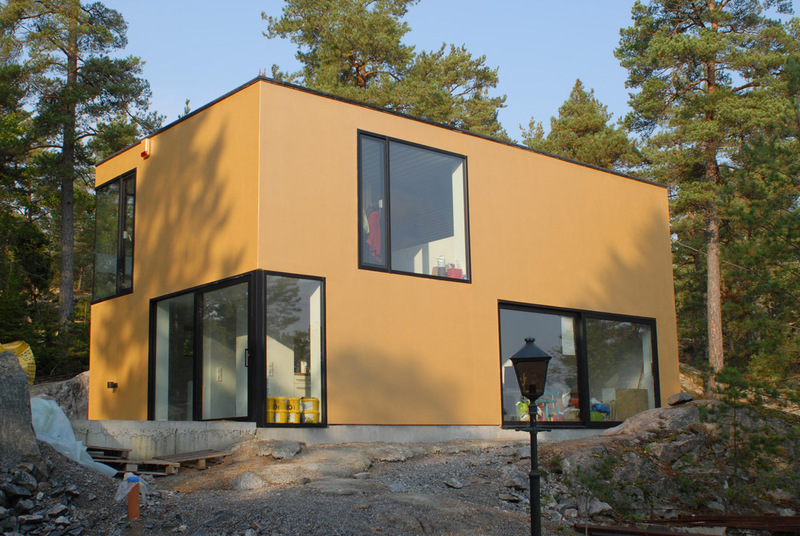 We aim to do this by reducing foundation and ground work for the houses to an absolute minimum. 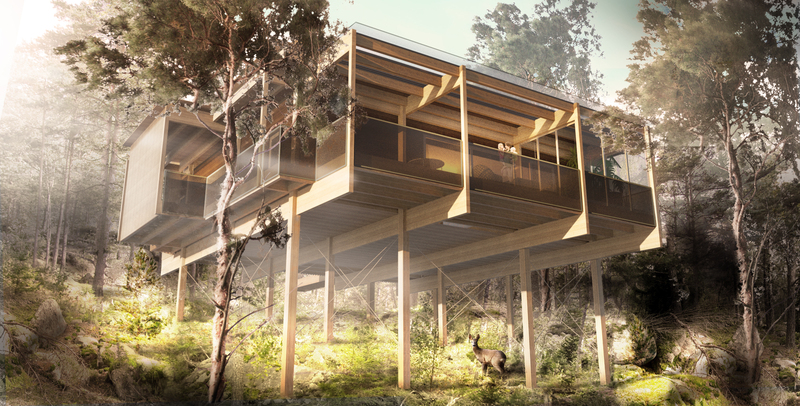 Each house will be placed on 12 wooden pillars gently inserted into the ground. 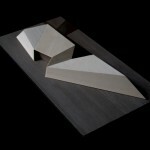 The buildings will hover in the air up to 10 meters above ground level on the steepest sites. 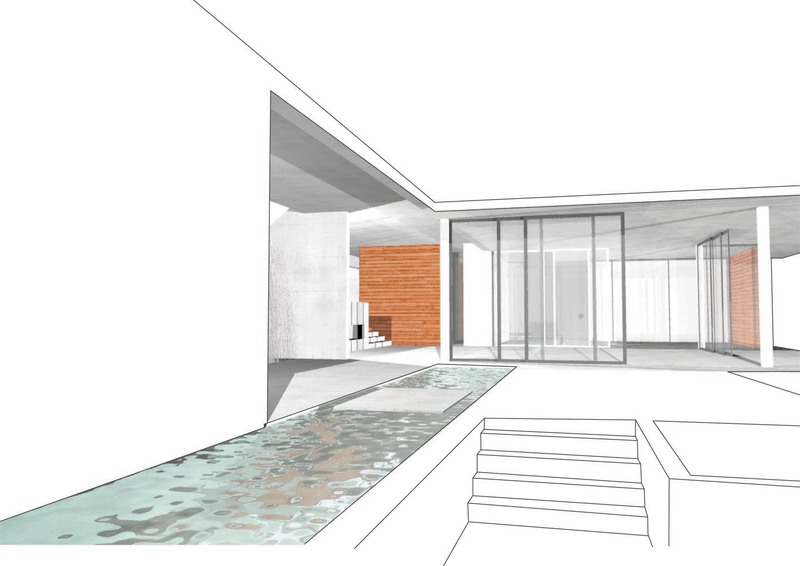 Entrance will be possible only by ramps and once onboard generous terraces including a roof terrace with summer penthouse will offer generous options for gardening and outdoor life. 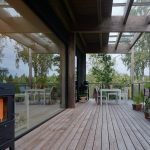 With a complete life among the treetops we hope no need will arise to establish complementary functions for outdoor living on ground level which will leave nature untouched and accessable for everybody. 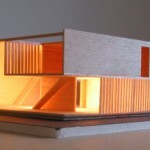 The buildings will be made up of a compact and well insulated core with a layer of uninsulated complimentary functions around it. 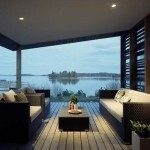 These complements will offer everything from open balconies to glassed verandas and covered storage space. 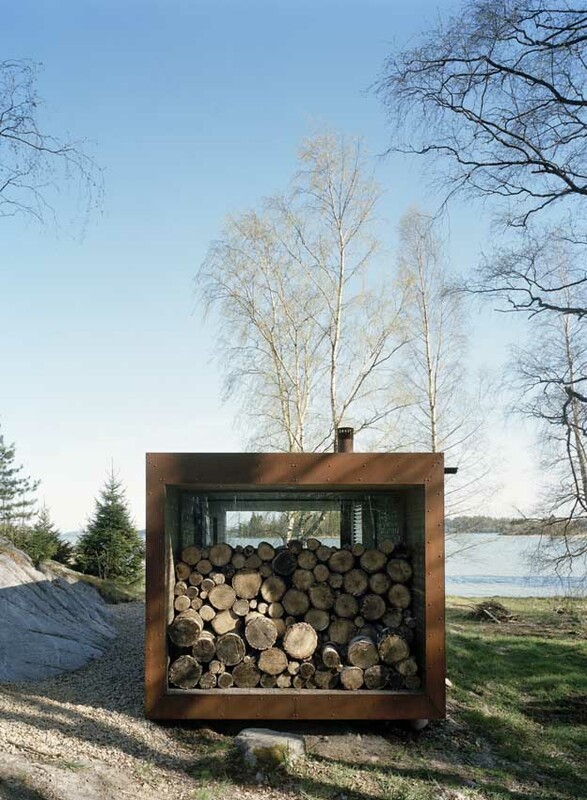 By putting a large portion of functions in uninsolated rooms we hope to greatly reduce the volume to be heated in the wintertime. 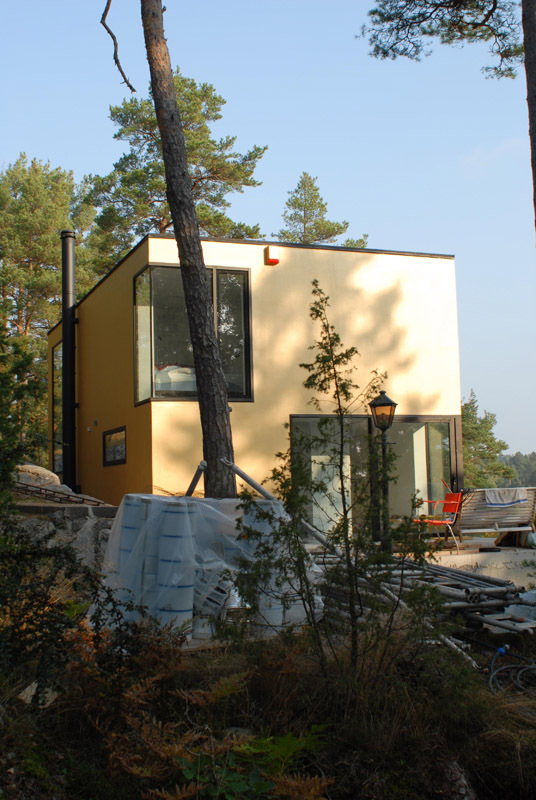 A local system for heating will be built up using a solar panel field and a pellet burner. 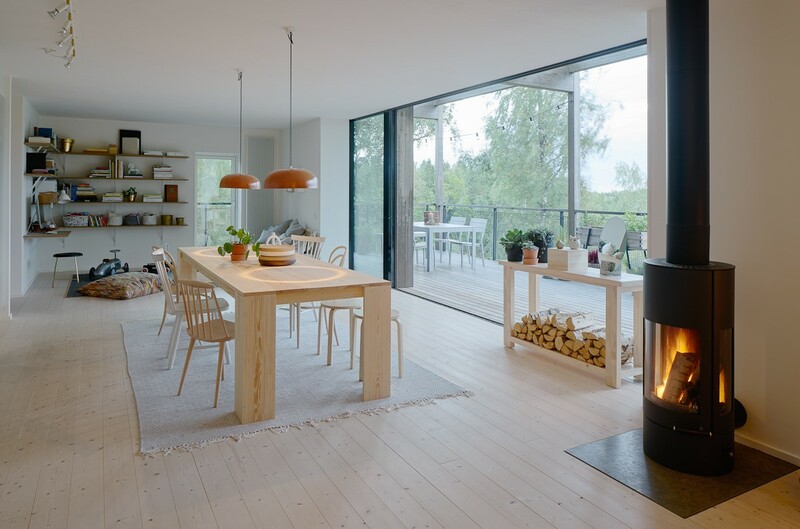 Every house will be equipped with a heat converter for ventilation air as well as soar water and ground chilling/heating for outdoor food storage among others. 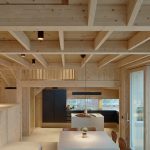 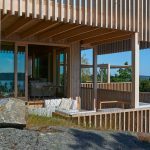 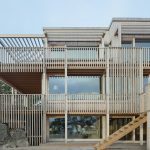 The first building is now completed and it was nominated for the Swedish Wood award in 2016. Additional design team : Erik Hedenstedt. 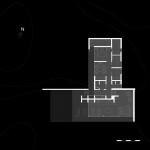 The general area to which the island belongs is very delicate and falls under a number of laws and regulations for extra consideration. 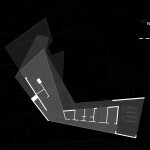 Therefore, a main aim for us has been to maximise integration of the building volume with nature and the topography of the site. 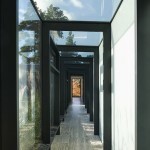 A large part of the building is situated under ground, serving as a link between the main house and guesthouse, and offering practical functions as well as an indoor pool and gym. 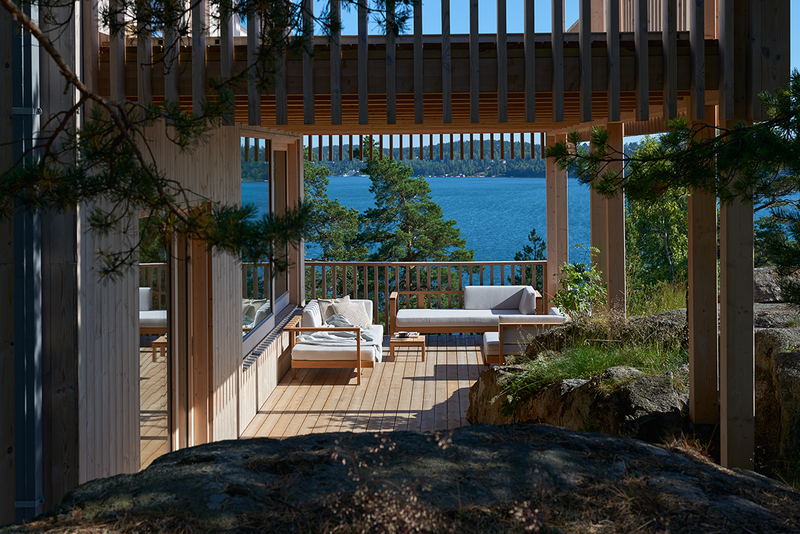 The main building is oriented towards the more spectacular southwest shore and contains primary functions such as living and dining room, kitchen, and master bedroom, while the guesthouse, gym and boathouse are gathered around a protected quay facing northwest. 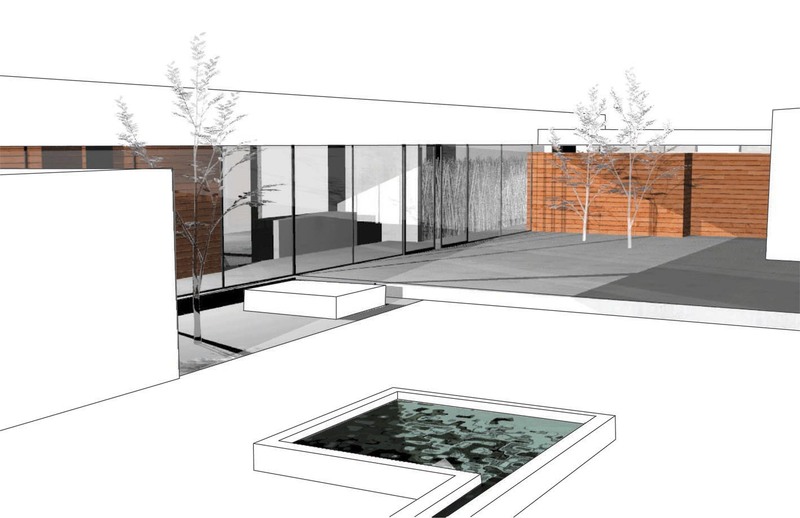 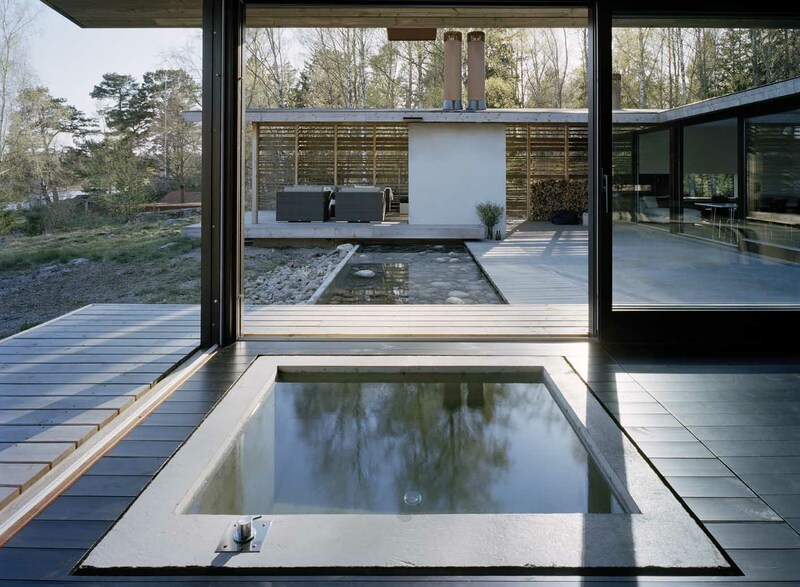 On the ground level, the gap between the main house and the guesthouse is left open and holds a sculpture garden and a shallow rainwater pool. 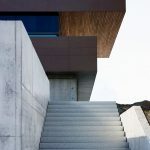 The separate volumes and the use of materials that are strongly related to the site – such as granite, untreated wood and vegetative roofs – help to reduce the visual impact of the buildings and make this modern newcomer a positive and self-explanatory addition to the area. 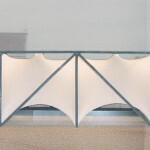 Additional design team: Detlev Henkel, Daniel Johansson, Ola Keijer, Leif Gulliksson. 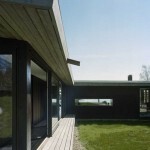 Villa Moelven is cooperation between a private client and the wood company “Moelven” and several other companies. 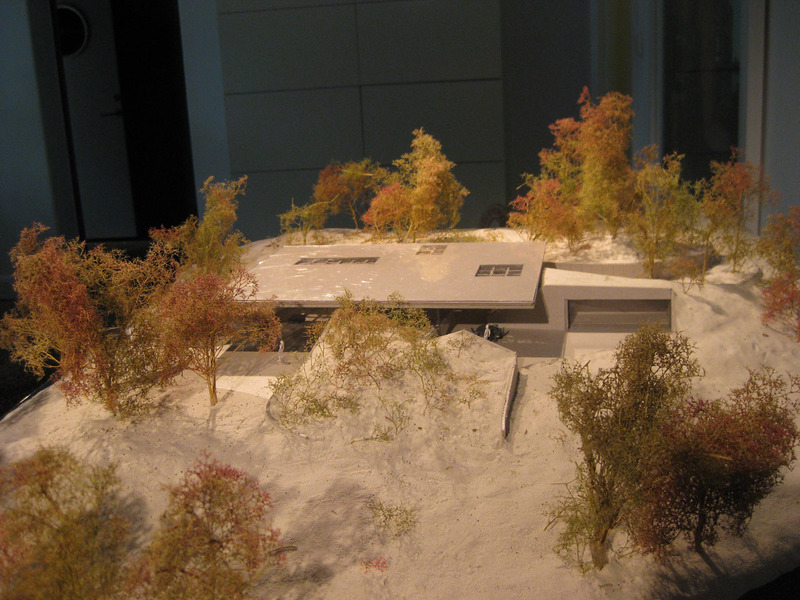 The building is a mix between private villa, showroom and representation space for sponsors involved. 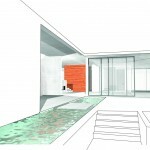 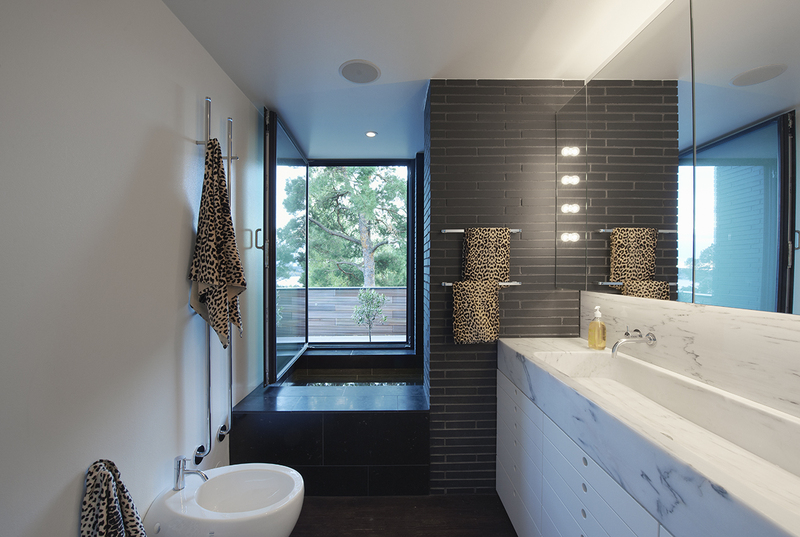 The client’s brief included a fresh mix of words as labyrinthic, narrow, surprisingly, tropical and modern. 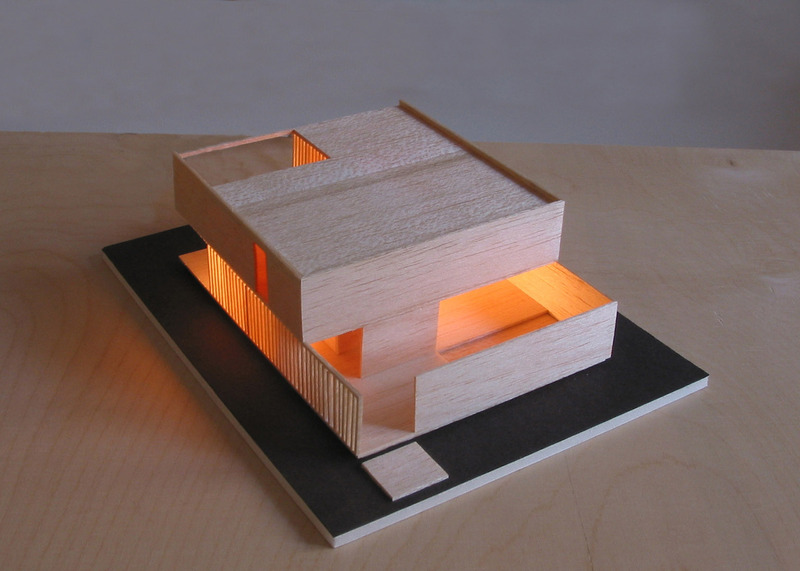 Our response is an irrational building where the term entity (storhet) is reflected upon as measured in experience rather than square meters or other performance. 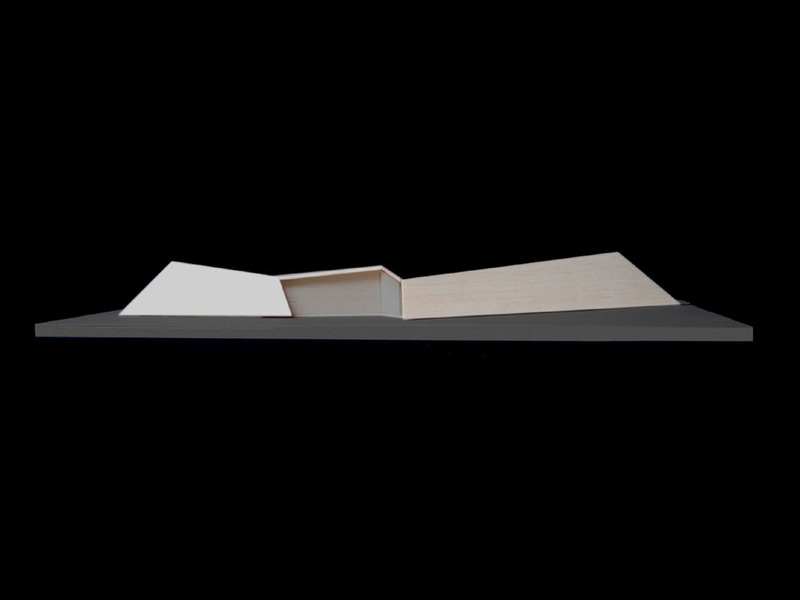 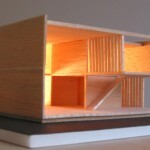 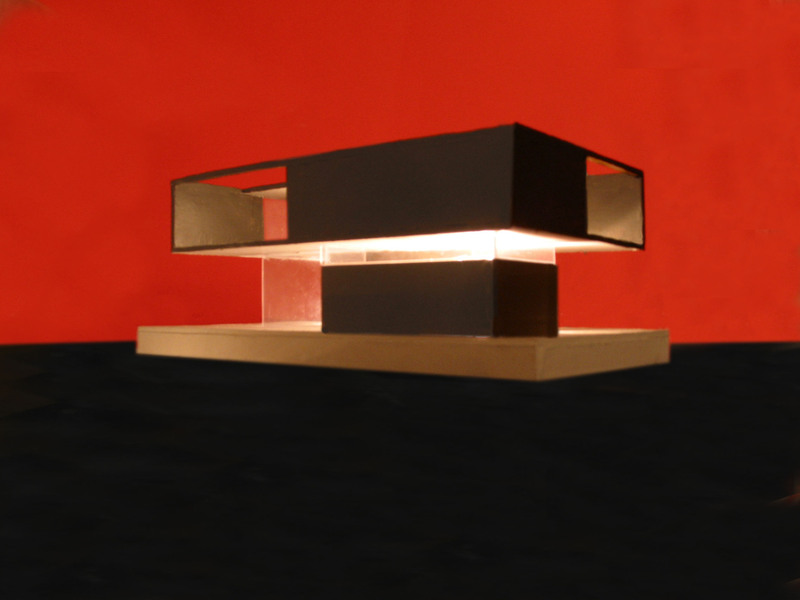 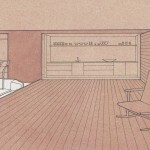 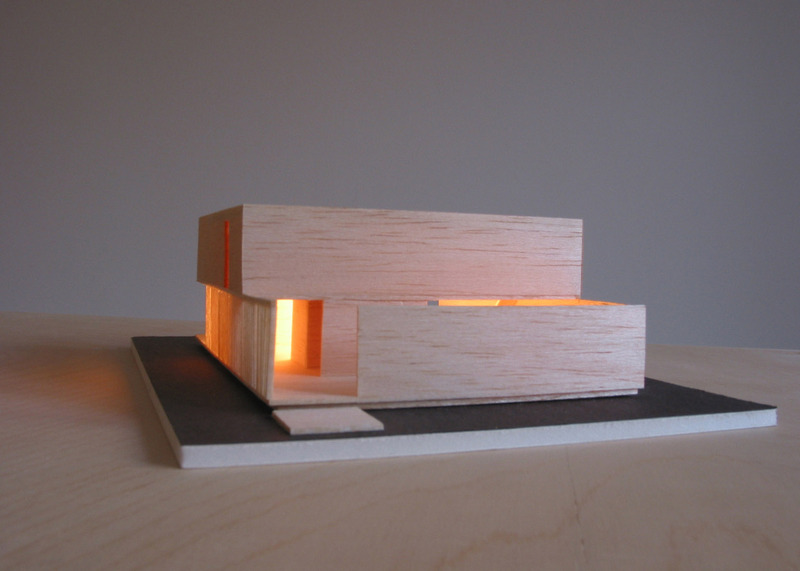 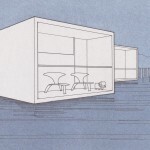 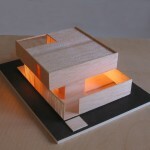 The building floats in scale and no distinct boarders are drawn between building, room and furniture. 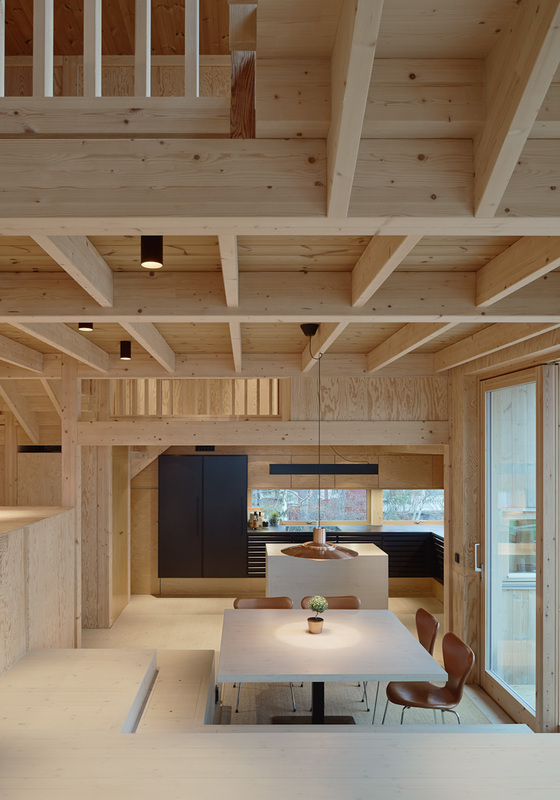 A number of levels, spaces and voids are generated through a three dimensional puzzle of wooden beams. 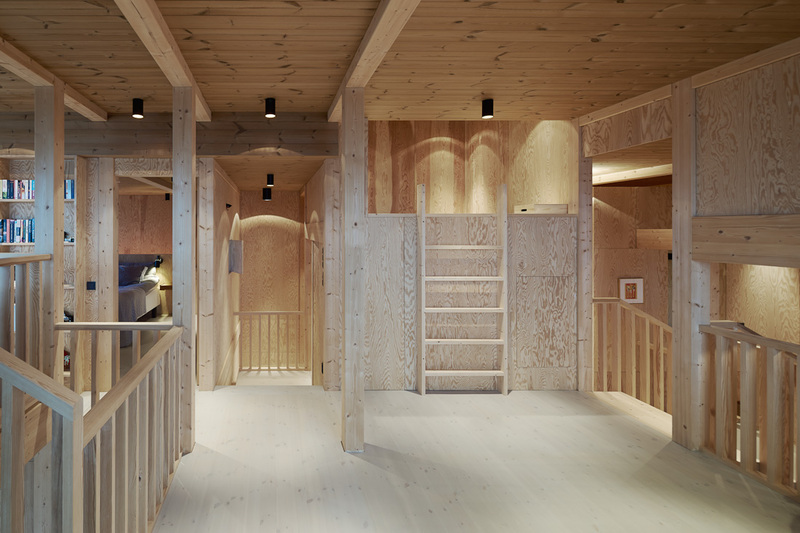 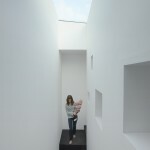 In this puzzle walls, floors and ceilings are put in to generate privacy where needed. 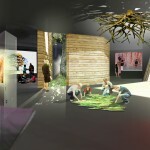 Additional design team members: Ola Keijer, Martina Eriksson. 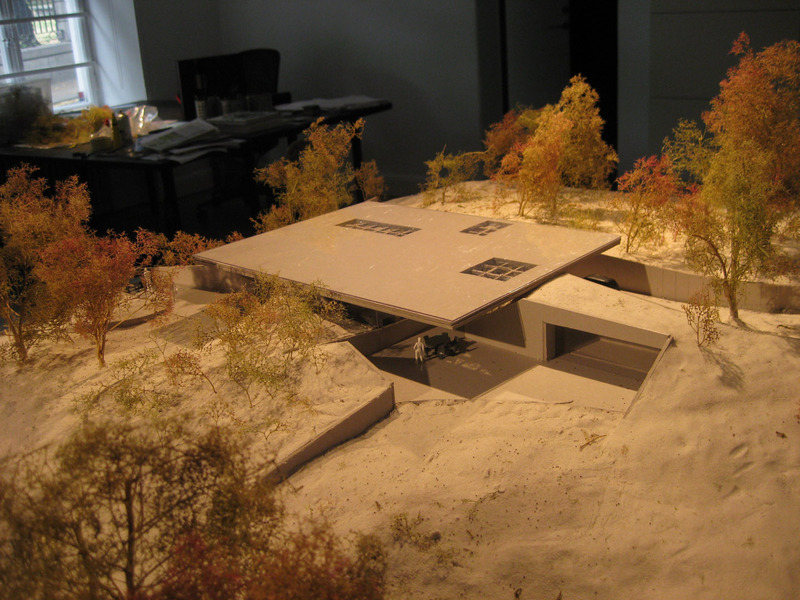 This project was developed during our ’Arkitektstudio WRB’ time period. 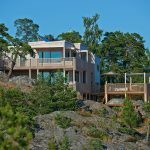 This is our first built project on the west coast of Sweden, an ocean front with variations of rough rocks and sandy beaches. 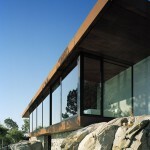 The clients in this case are devoted surfers who have spent many vacations abroad on surf sites. 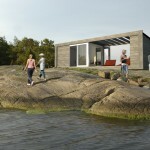 For their own house they now wanted to catch some of the sensation of easy surf life but placed in a Swedish context. 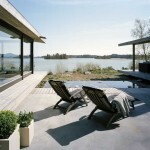 Much focus was spent on discussing the essence of summer living as well as the logistics of surfing. 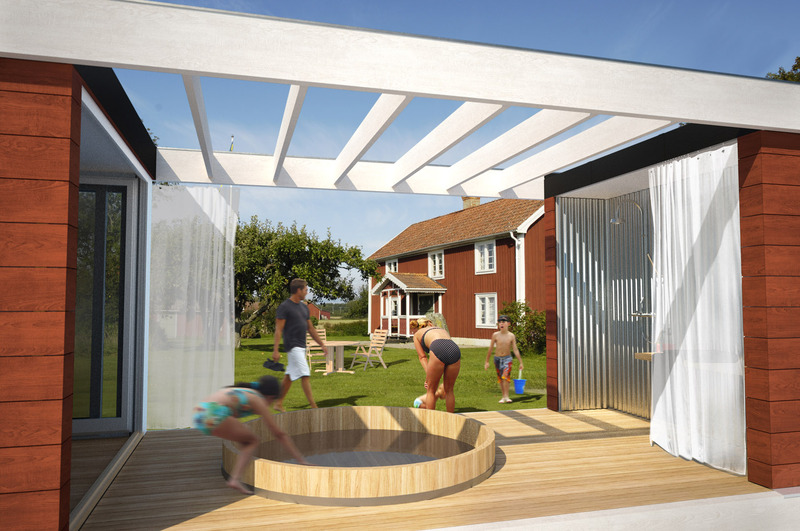 A large roof protected outdoor section holds storage for sails and boards as well as outdoor shower and racks for wet suits. 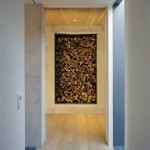 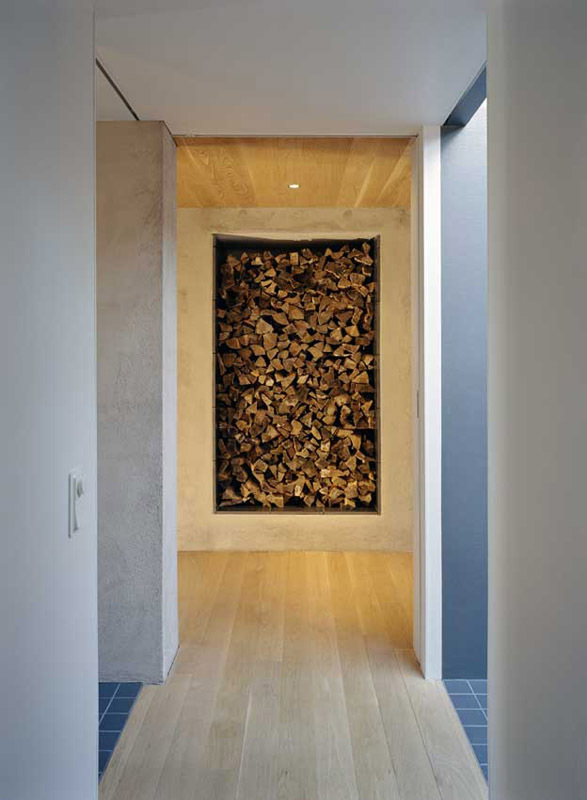 Further board storage by the entrance adds atmosphere to the interior always visually present. 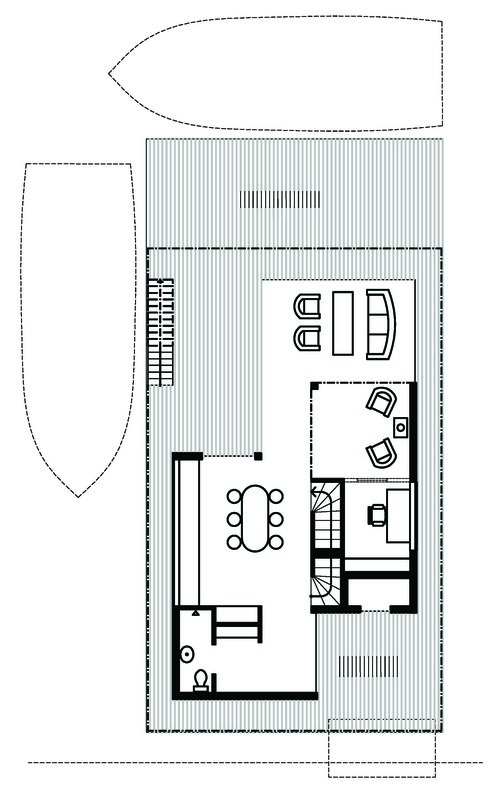 The social areas face the open ocean and are tightly connected to an even larger roof protected outdoor area which summertime serves as the main living room. 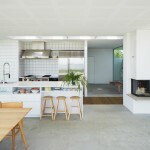 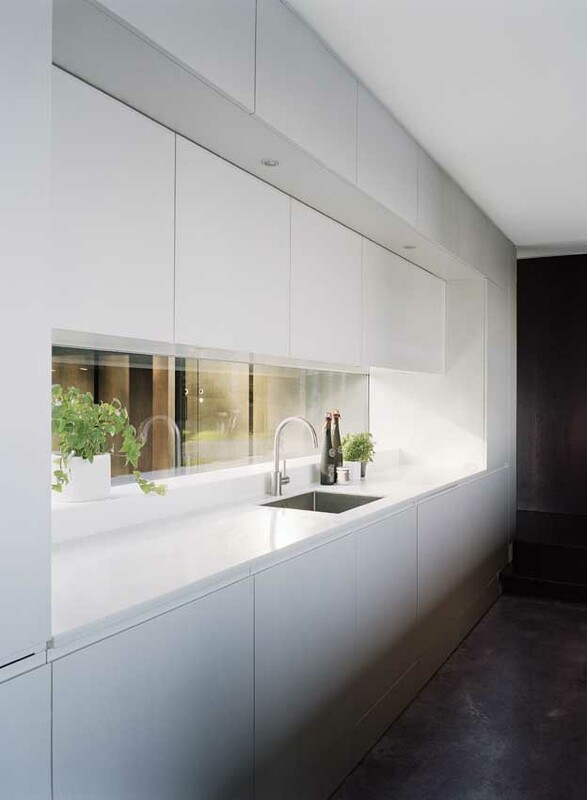 The white color scheme with white wooden panel and a bright concrete floor together with the roof lights help express the presence of the sun even in not so sunny summers, which are a bit too common. Additional design team members: Daniel Johansson. 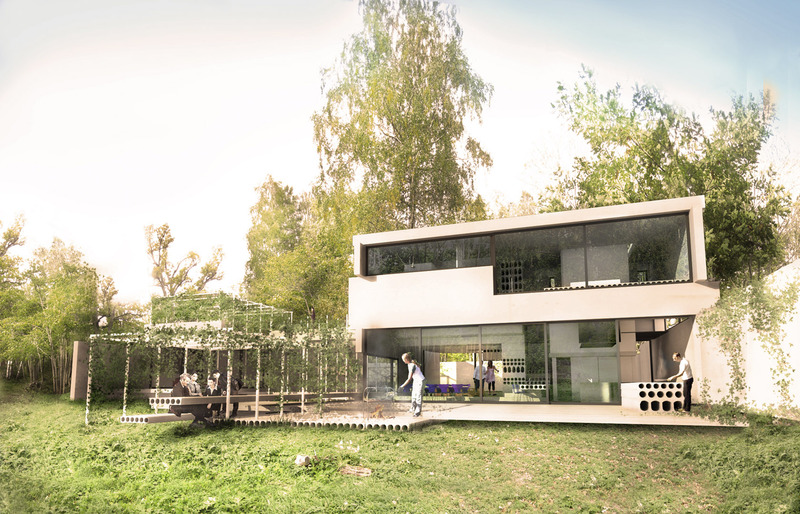 This project was developed during our ’Arkitektstudio WRB’ constellation. 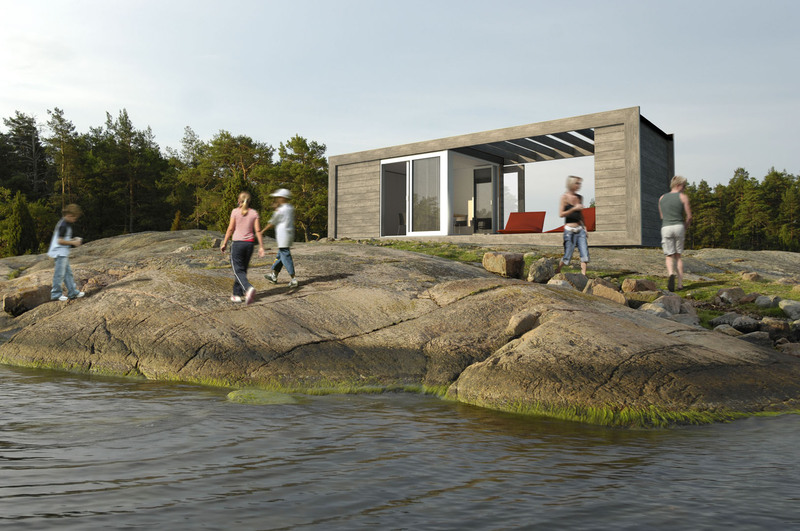 A German couple owning two back to back properties north of Stockholm decided after spending several summer holidays in a traditional red cabin on one of the properties to leave that house for children and guests and build a new house for themselves on the second plot. 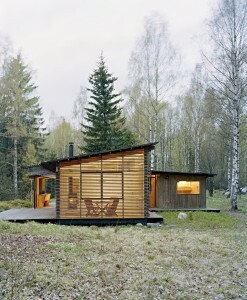 The wish was for a house that fitted in and that preferably could have roots in Swedish traditional buildings. 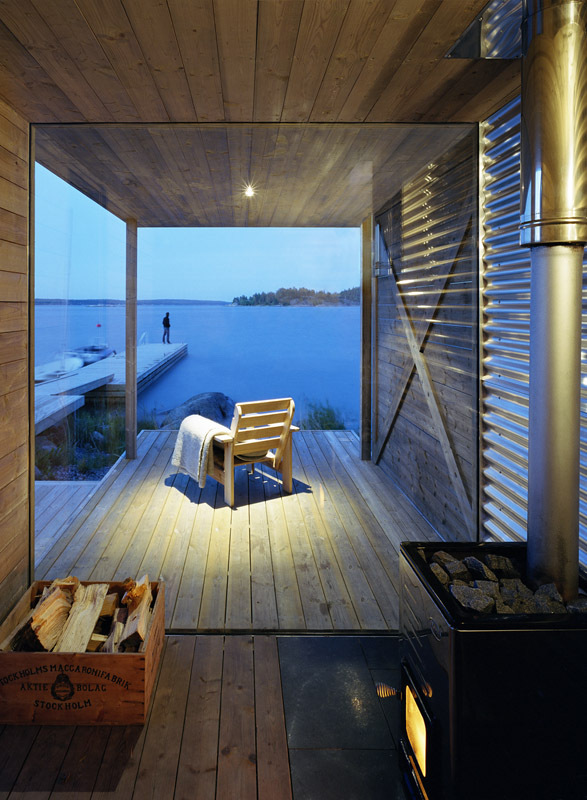 We decided to seek inspiration from the traditional Swedish barn frequently present in the surrounding landscape. 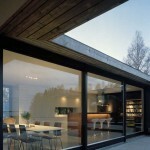 Through a series of transformation we have given it completely new qualities within the existing framework. 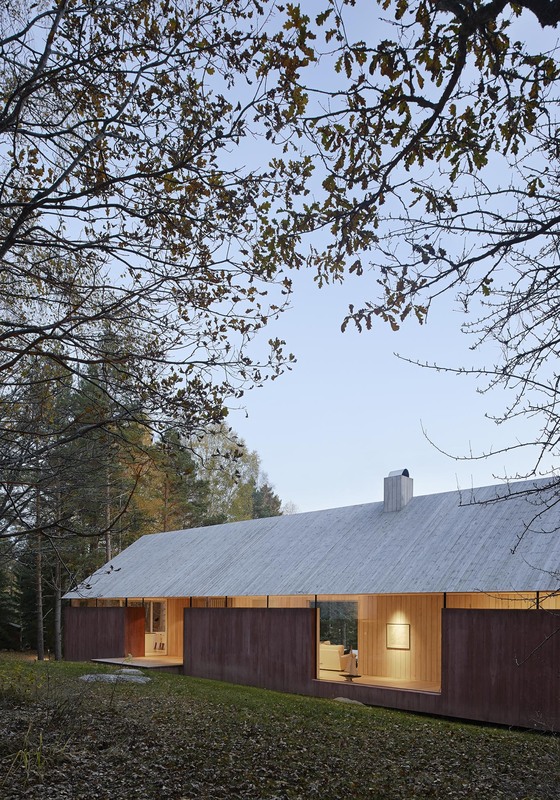 The color is still traditional “falu red” but the wood replaced with concrete and the ceramic tile roof replaced with a wooden boards. 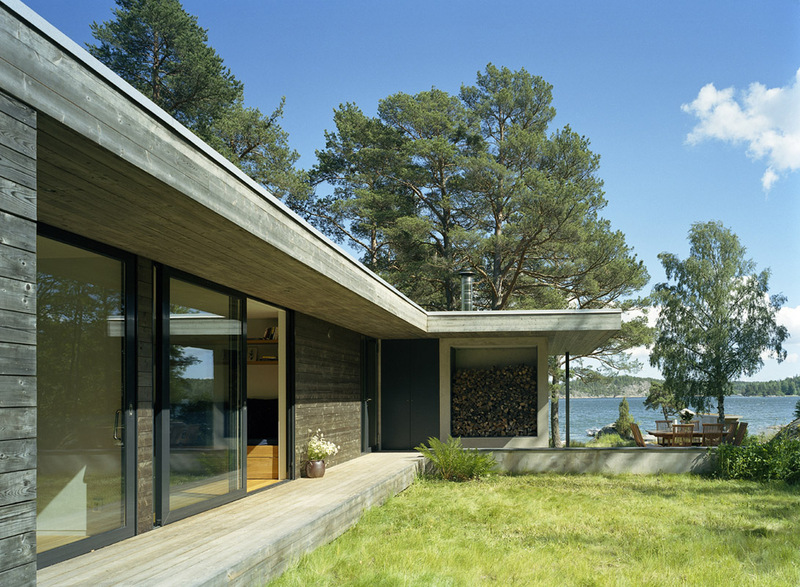 The traditional Swedish barn was usually very consciously placed in the landscape, but seldom let the landscape affect its form. 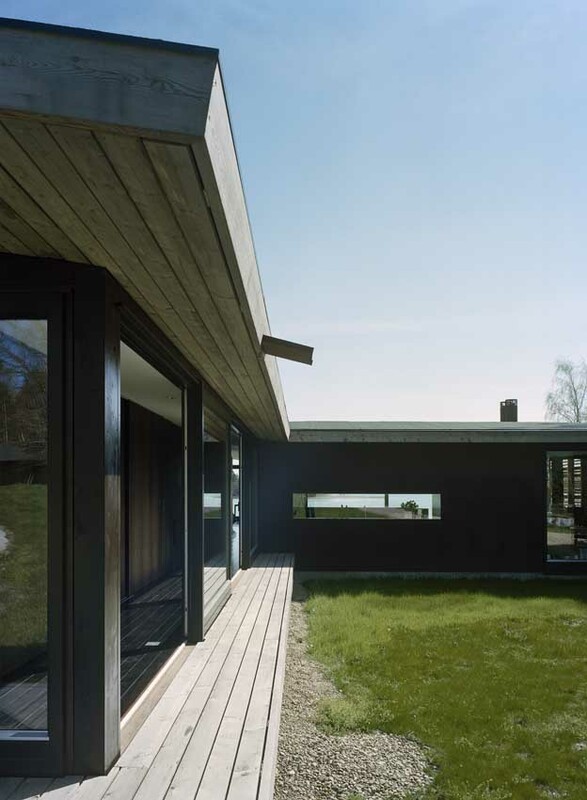 To emphasis this integrity of the building we let our barn float above the ground and terraces become part of the building rather than the landscape. 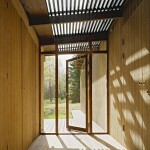 Inside the building is held up by two closed cores containing closed functions. 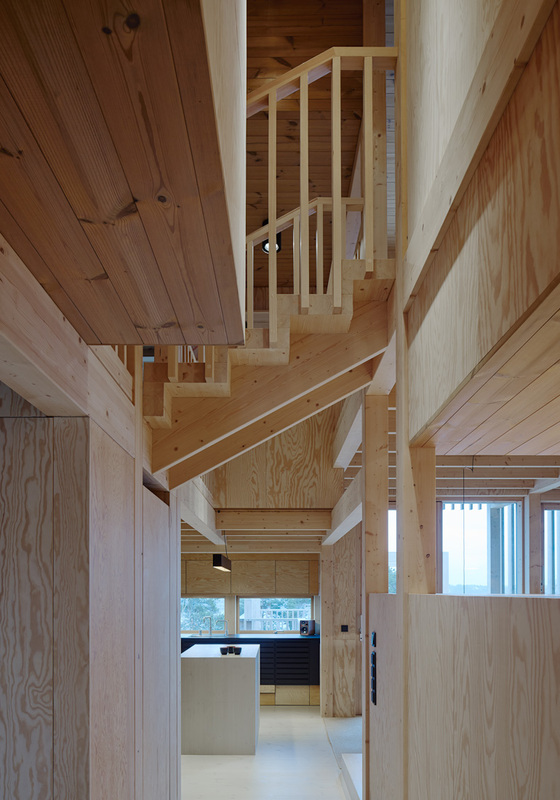 Through large wooden beams the load of the roof fully lands on these cores making support in the glassed strip separating the concrete walls from the wooden roof unnecessary. 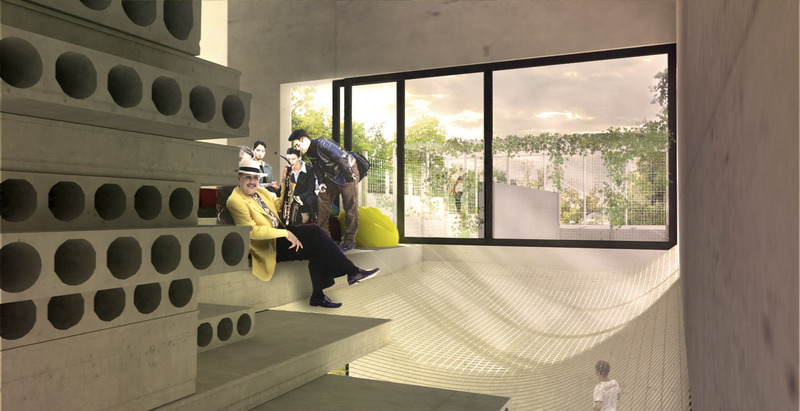 The interior rooms can be fully opened to let inner and outer spaces fully interact in the summertime. 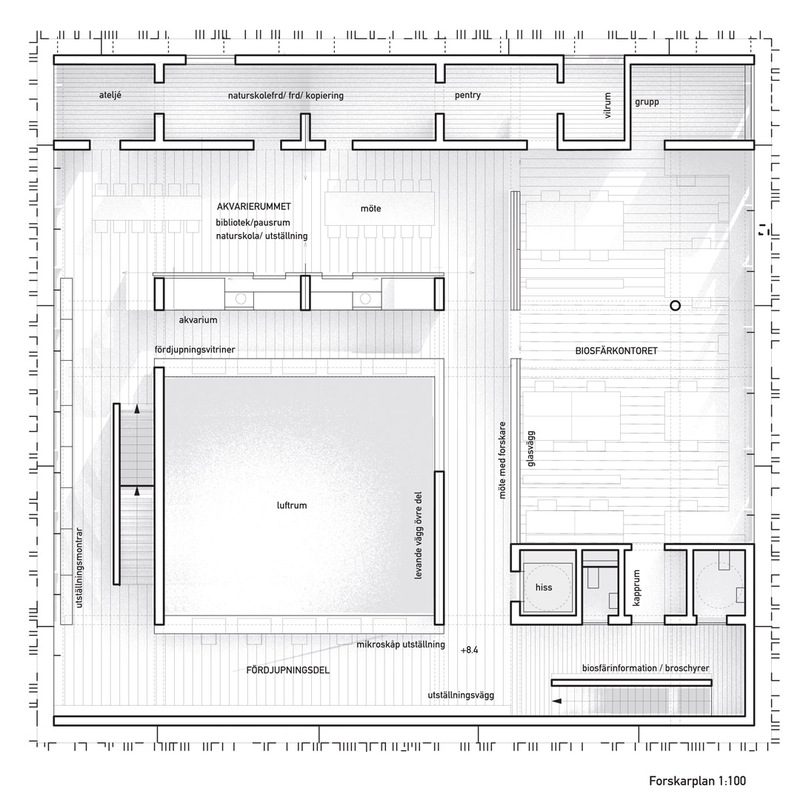 Widjedal Racki Bergerhoff’ time period. 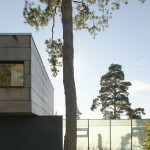 Villa Alba is a situated on a lush southern slope in a high end suburb of western Stockholm. 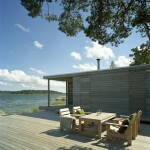 The area is an old summer house area now being upgraded for permanent living. 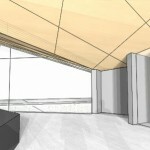 The site had not previously been built on and we had the opportunity to start from scratch. 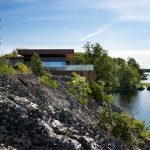 Our aim was to keep as much as possible of the lush character and especially a dramatic section of barren rock in the middle became a focal point for the project. 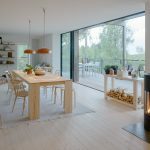 The clients, a young Swedish couple just returning from work in London got very involved in the process and the wife played an important role in the project management as well as the interior decoration. 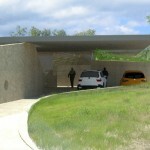 The building is actually several bodies held together by a black brick wall closing the property towards the road in the north, to create privacy as well as a protected microclimate on the south side. 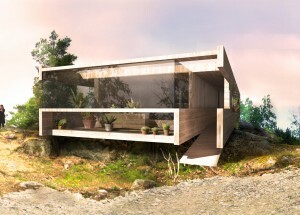 This concept gave us a variety of outdoor and indoor spaces with different character and mood on a site that otherwise could have become enkelsidigt focused on the sea view in the south. 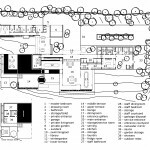 The main volume of the building contains a bottom floor with social areas and an upper floor with private bedrooms and bath for the family. 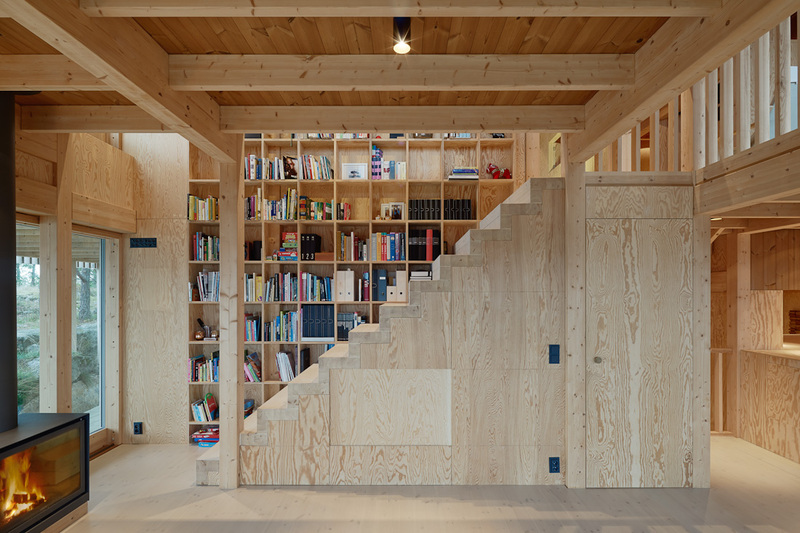 The second largest volume contains privacy for work and guests, which was an important part of the program. 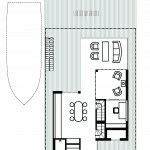 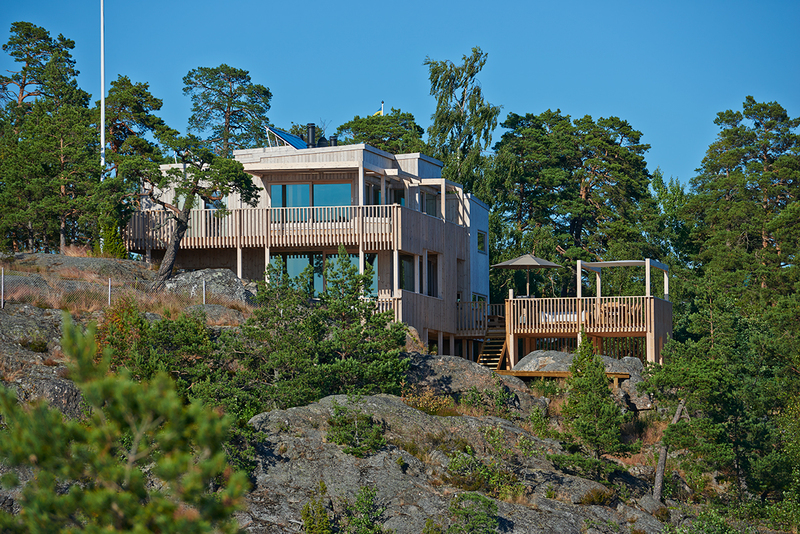 Besides these functions this section also has a bottom floor with sauna and utilities. 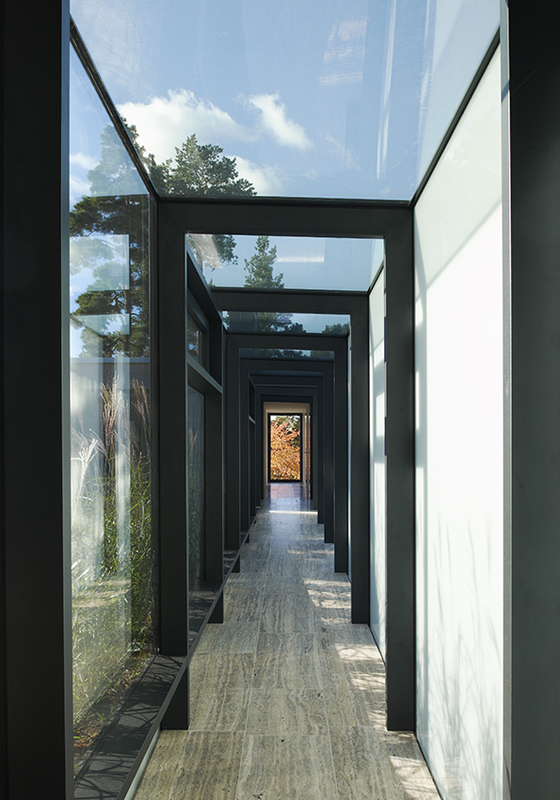 A glassed passage connects these two parts. 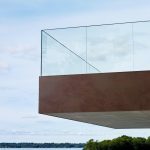 The passage´s northern glassed wall has white glassed offering a hint to the neighbors of the life taking place on the other side as a Javanese puppet show. 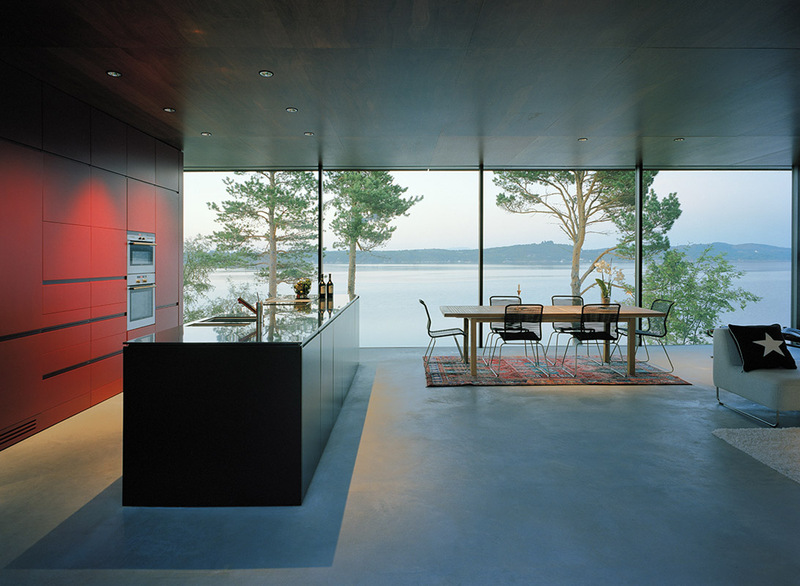 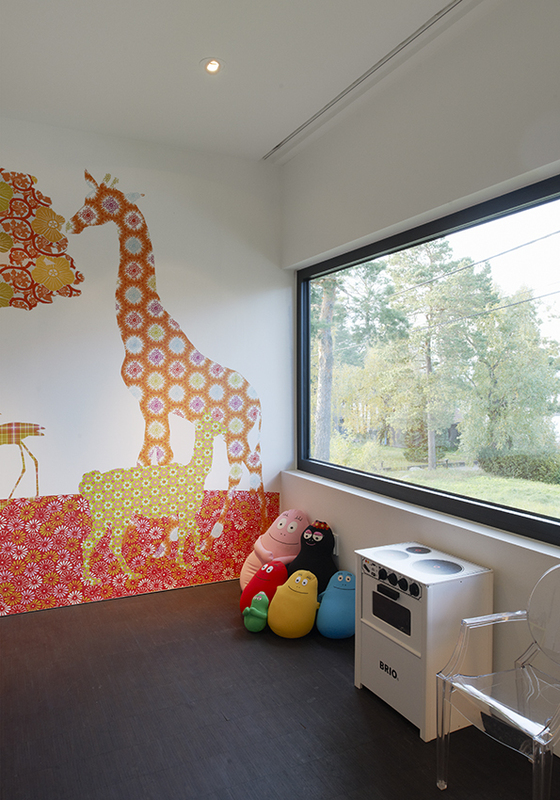 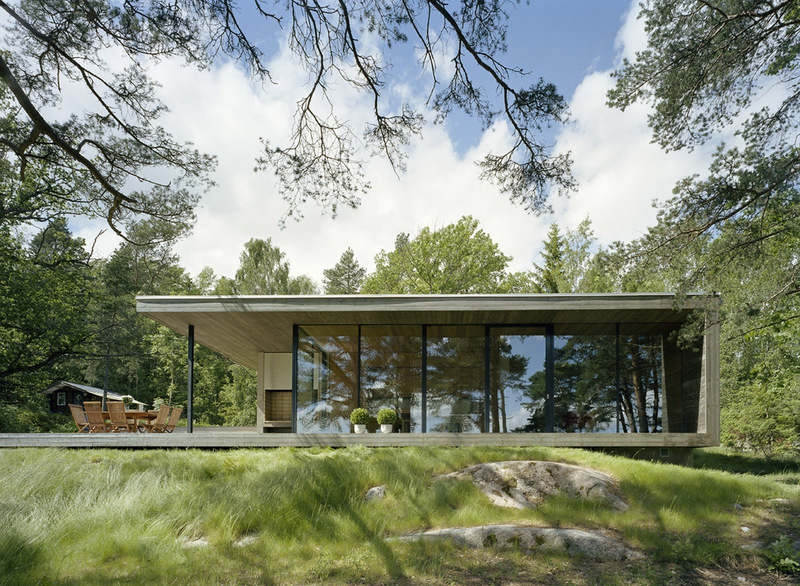 The house was portrayed in the Swedish TV show “Hustoppen” 2011 and made Wallpaper Magazine rank us as the number 14 in ”reason to visit Sweden in 2011”. 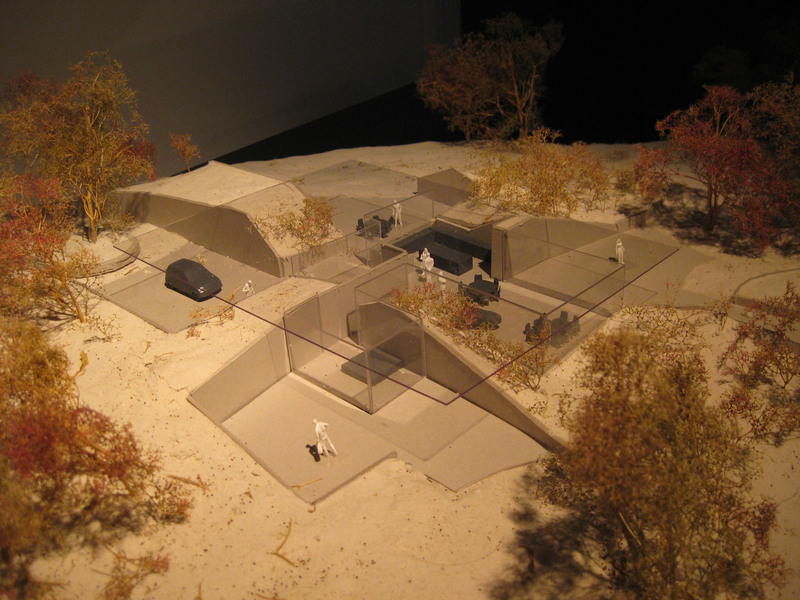 Additional design team members: Ola Keijer, Detlev Henkel. 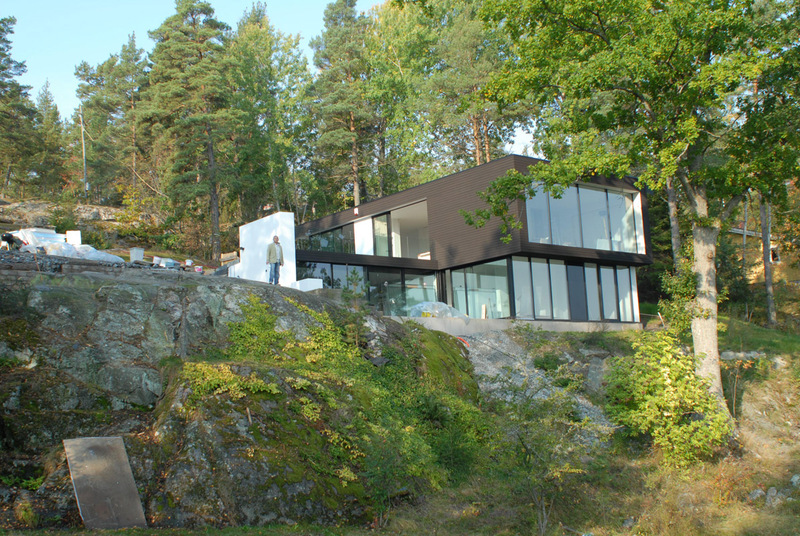 This project was developed during our ’Arkitektstudio WRB’ time period. Additional design team members: Daniel Johansson. 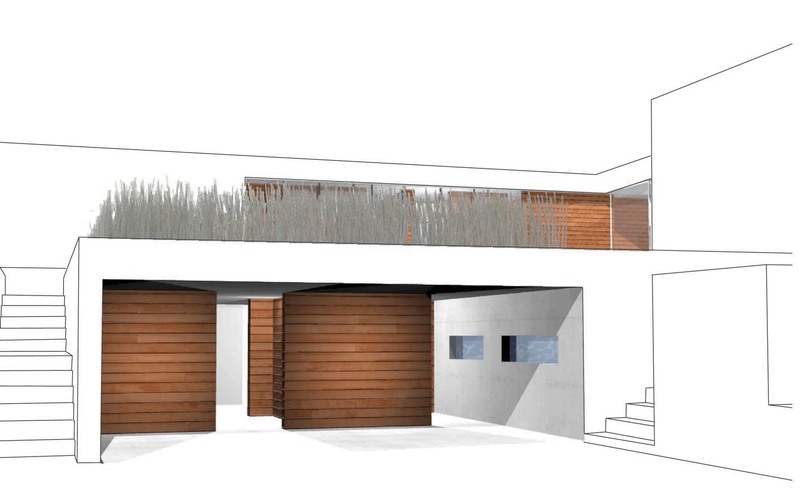 This project was developed during our ’Arkitektstudio WRB’ time period. 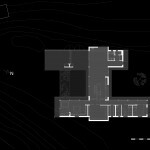 On a lush site situated in the western outskirts of Moscow we were asked by a Russian businessman to design a private villa. 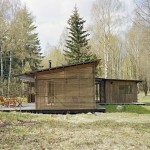 In the area previous dachas were replaced with ambitious new villas with great variation in style and success. 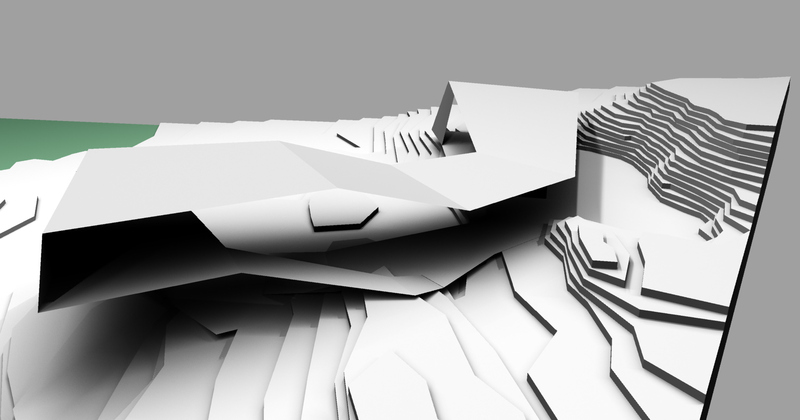 Our site was unexploited and made up of a slope facing north. 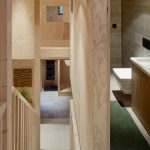 The large program contained a 20 meter indoor pool linked to a spa area as well as a generous private section for multiple family members. 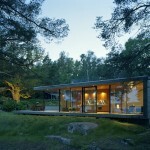 A home office with reception and general staff quarters were also included. 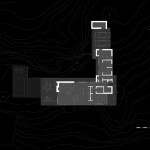 We devoted a lot of thought on how to place the building without turning most of the property into a northern plot shaded by the house. 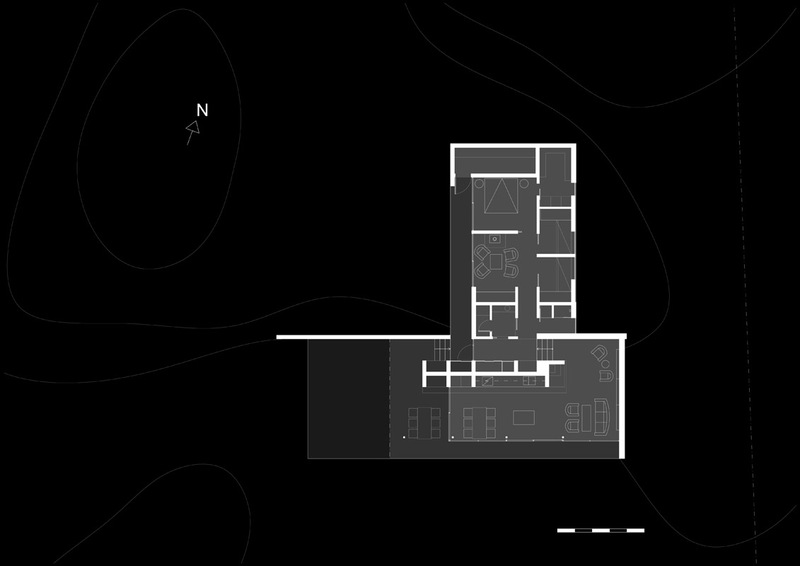 We ended up with a house that leaves a large part of the southern side in direct access to the social area. 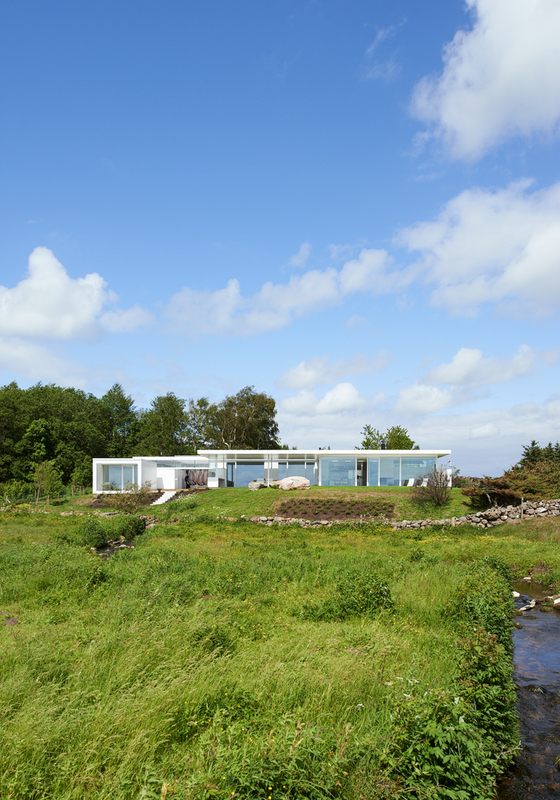 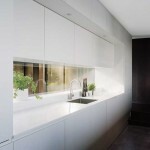 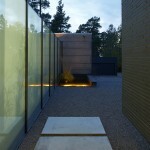 Transparency through the building gives views towards the northern part of the plot. 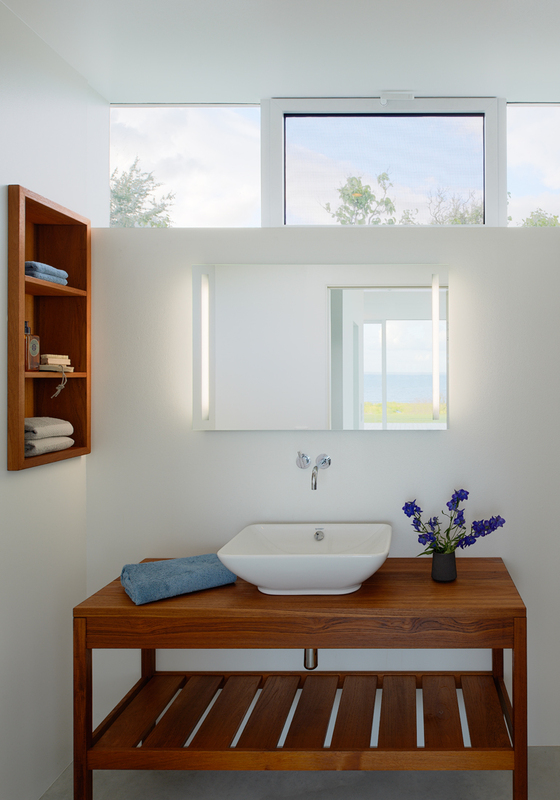 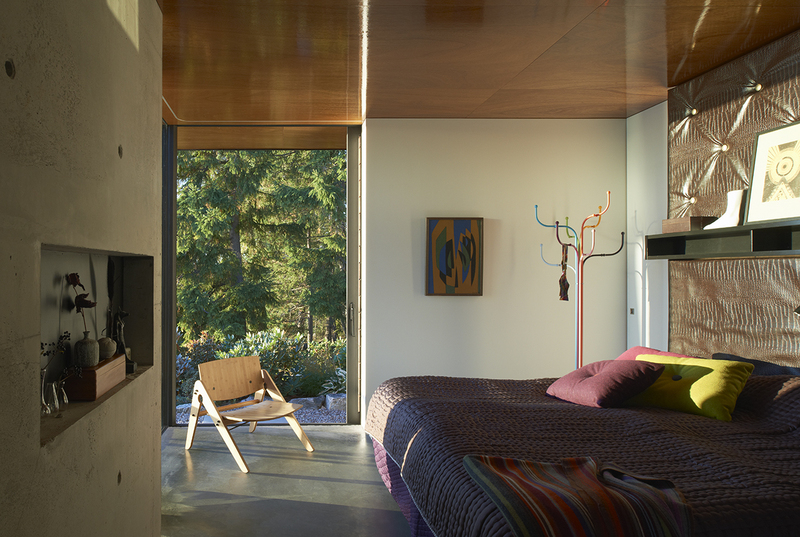 A private bedroom section was elevated as a secluded box for privacy. 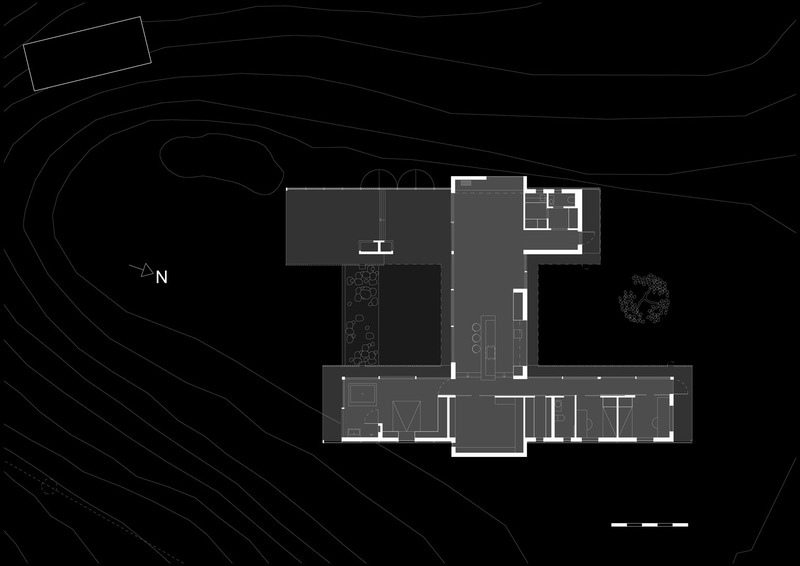 The interior living areas linked with open stair and indoor terracing down to spa and basement function. 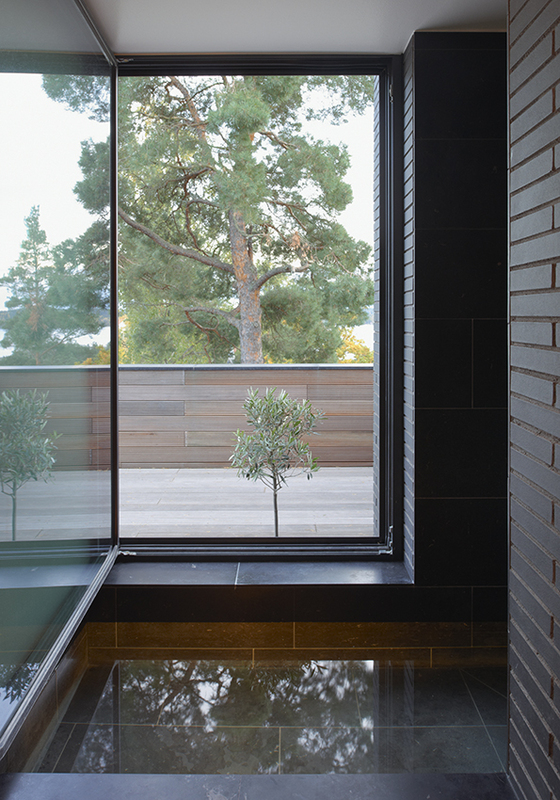 The lower spa area, with a large glass wall towards the daylight lit swimming pool on the entrance floor as main feature, enjoyed the view toward north. 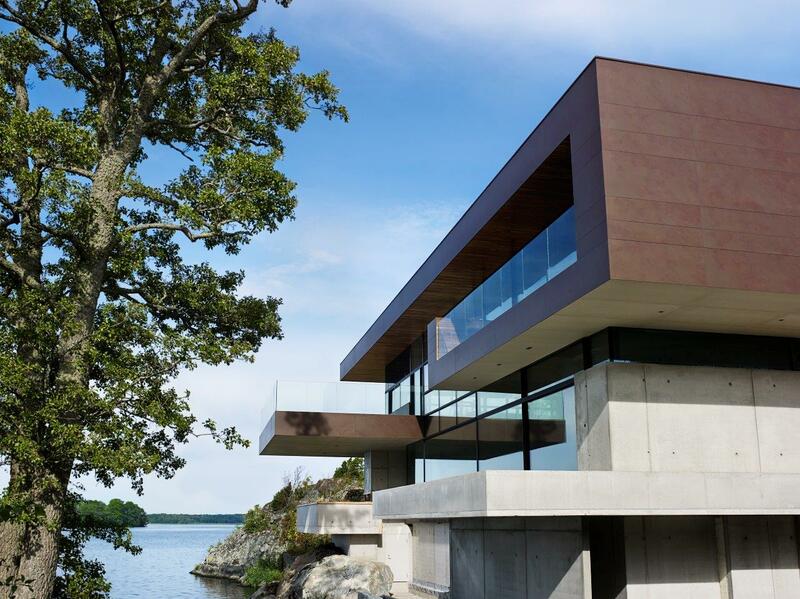 The very lowest northern part of the property we gave new improved quality by turning it into an infinity lake using the neighbor’s property boarder concrete walls. 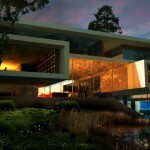 This Ukrainian businessman contacted us to design a house for his mother on his very large estate along the Dnipr River. 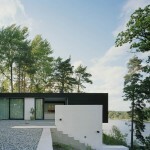 The plot for his mother sits on a point in the river made up from fine white sand. 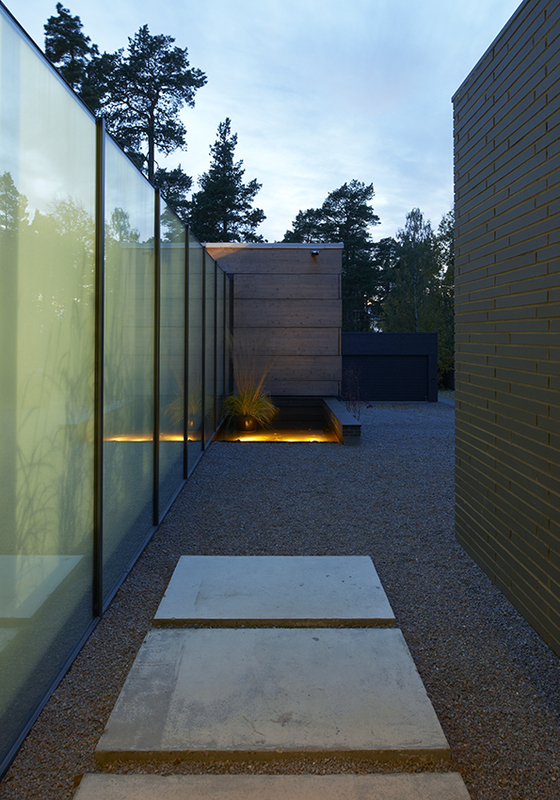 The possibility to freely move around and rearrange in this temporary landscape led us in to an urge to work with supporting walls as the main structural elements. 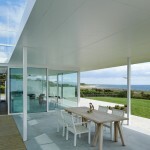 A large roof slap is placed over a concentration of walls creating both indoor and protected outdoor spaces. 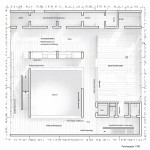 Additional spaces have been fully integrated in the ground. 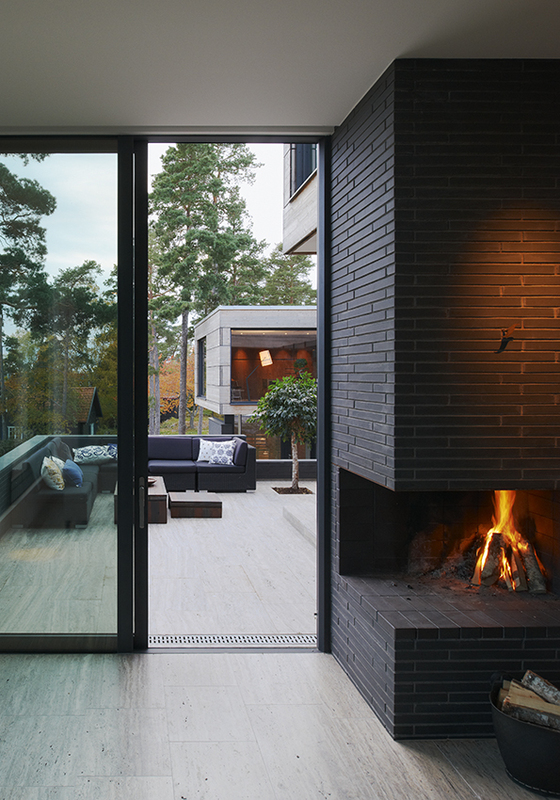 Important in the clients brief was to have outdoor spaces in all directions as the wind is an issue and vary from all directions. 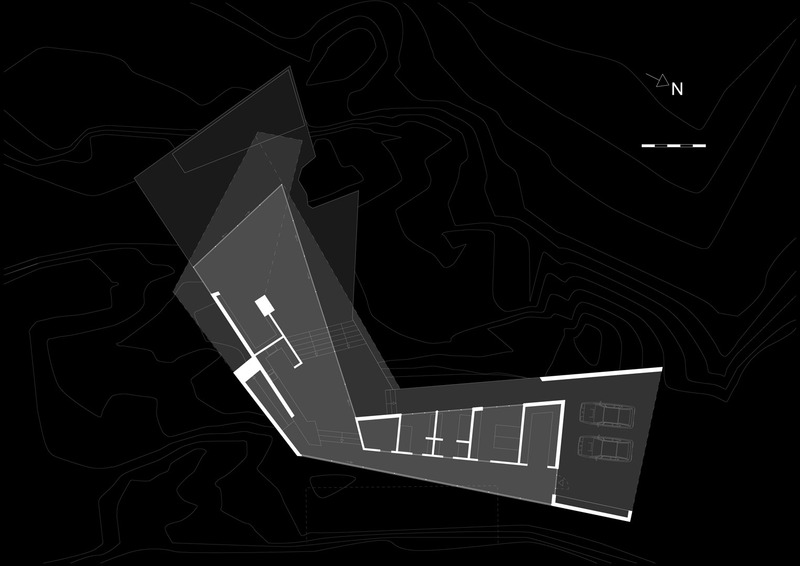 We studied wind charts and found our layout around a + node to be a fruitful solution. 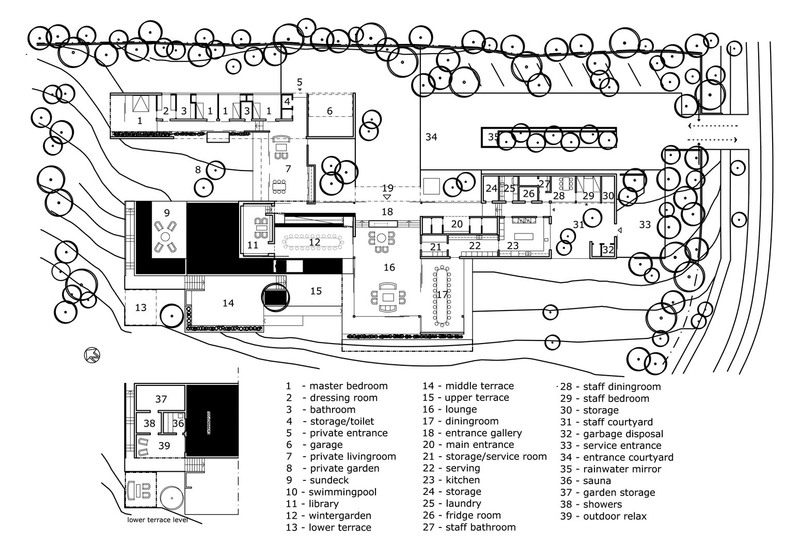 Besides his mother’s secluded quarters the program also contained spaces for guests and an outdoor pool. 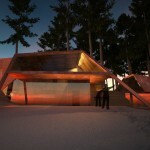 Additional design team members: Ola Keijer, Daniel Johansson. 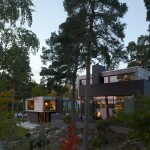 This project was developed during our ’Arkitektstudio WRB’ time period. 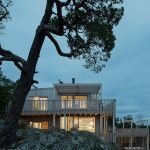 A young couple had seen an article about one of our house and gotten convinced they finally should sell their flat downtown Stockholm and move out to their country house site an hour away. 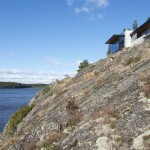 The site sits dramatically on a shelf on a barren cliff wall. 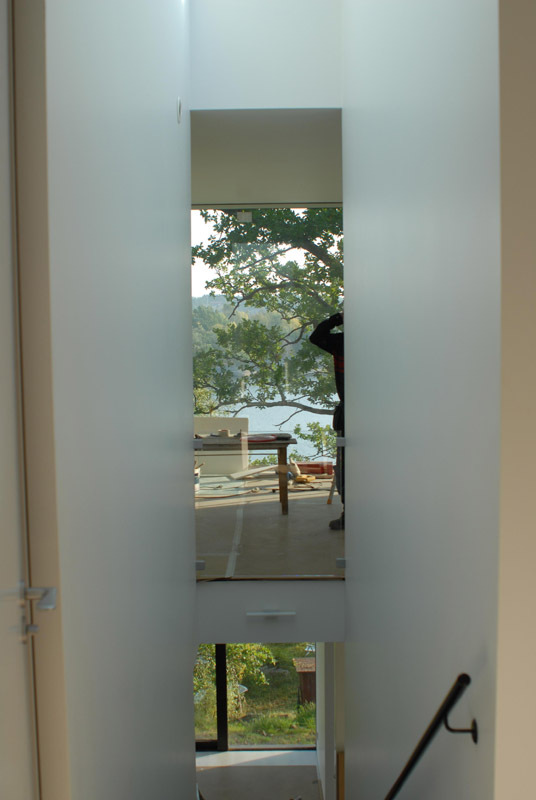 The existing summer house on the property was situated on the middle of this shelf leaving an exposed narrow strip between the house and the drop off as well as a protected strip between the house and the rock. 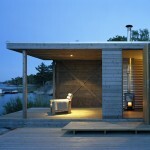 The latter was the most frequently used outdoor area due to the exposed and windy situation. 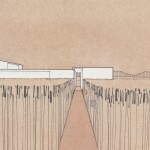 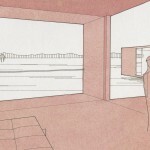 This strip was however fully cut off from the lake view and the qualities of the site. 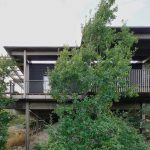 Our challenge was to build a much larger building and at the same time free more outdoor space preferably protected and with a view. 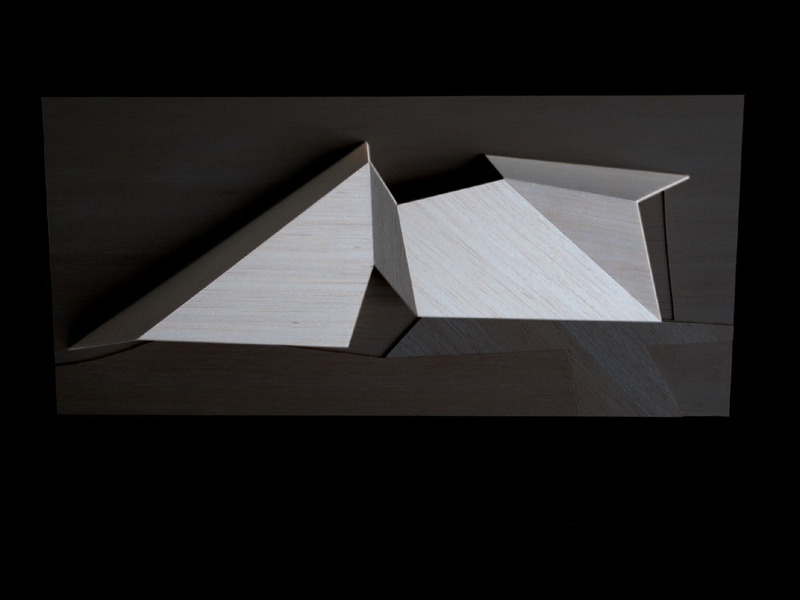 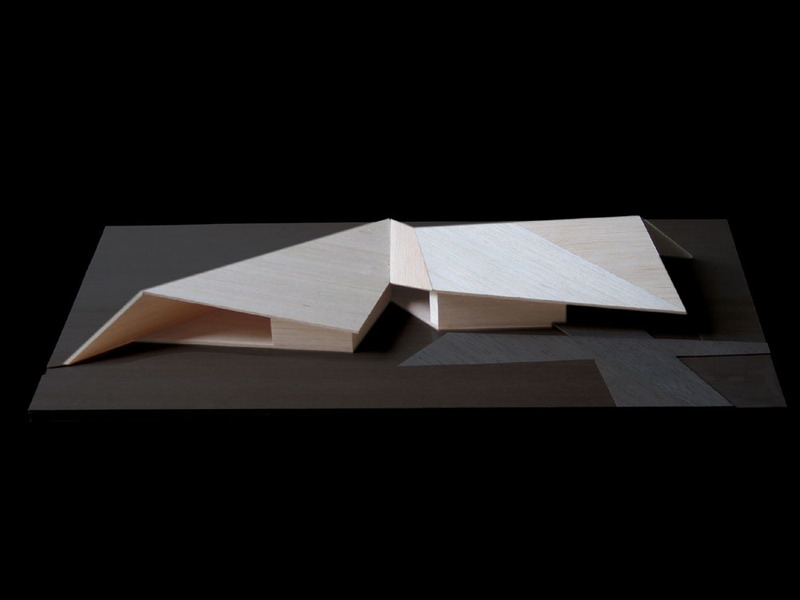 Our suggestion was a house that follows the outer rim of the shelf and at places cantilevers over the drop-off. 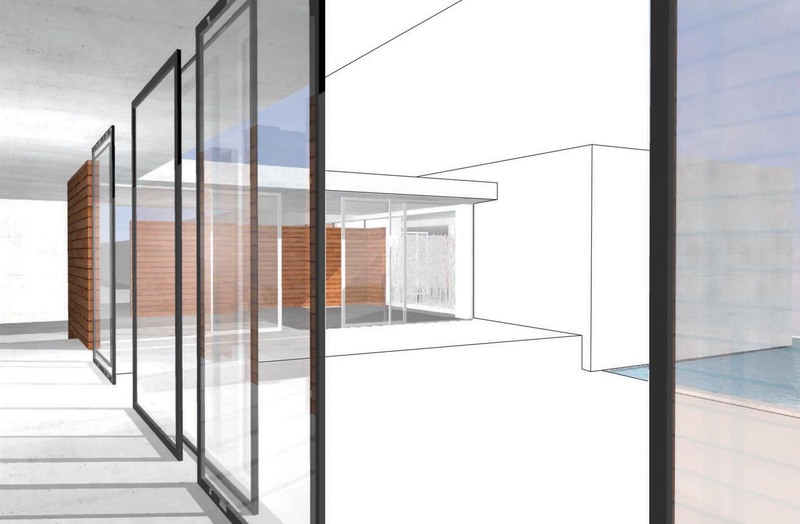 A large protected courtyard was generated and transparency with large glassed sliding doors guaranteed connection between the two sides. 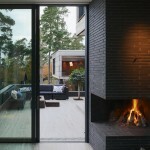 On the windy side by the drop off a recessed outdoor balcony with fireplace provides a protected outdoor space. 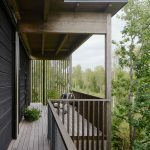 The balcony is connected to the kitchen with a greenhouse, creating an in-between zone for fall and spring. 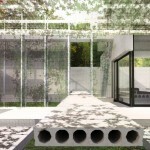 Summertime the glassed walls of the greenhouse can be fully removed or partly closed to block the wind. 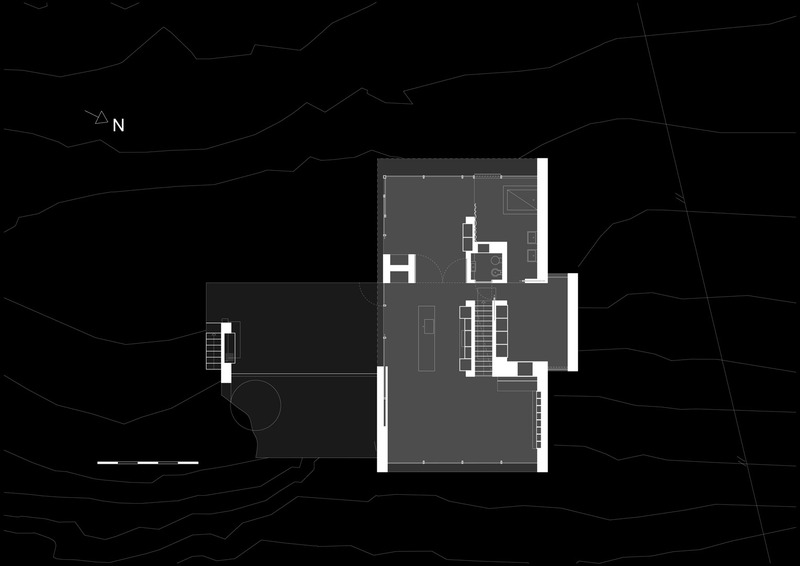 The building sits firmly on the rock as a labyrinth concrete fortress. 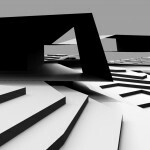 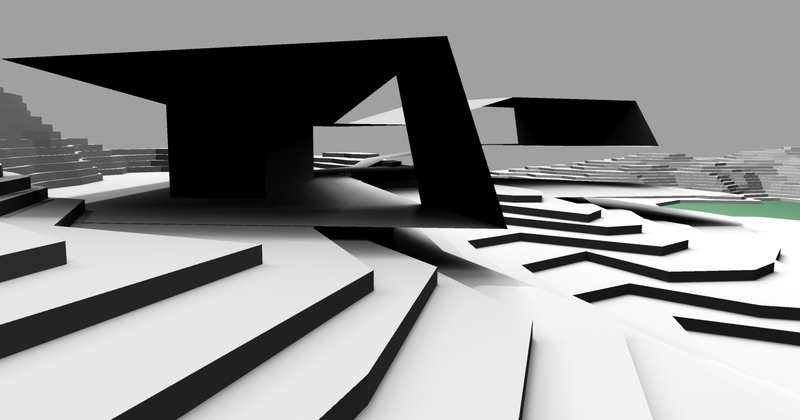 The labyrinthic feeling generated by the complex form guarantees a variation in spactial experience. 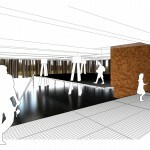 Besides concrete the glossy wooden ceiling is a main character which helps reflect the glittering water below to add on the almost magical sensation of the site. 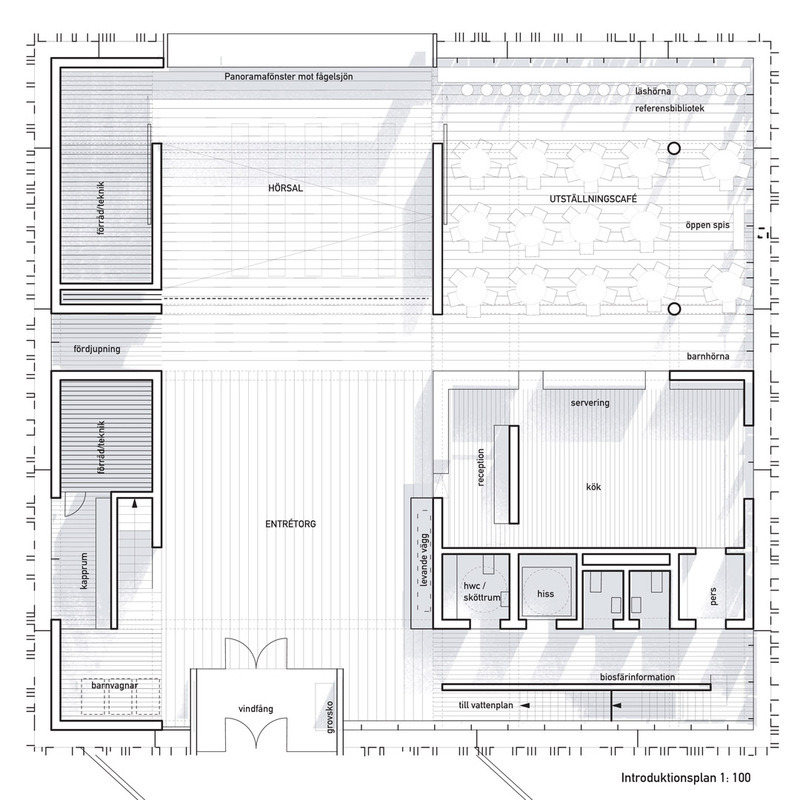 Design team : This project was developed during our ’Arkitektstudio WRB’ time period. 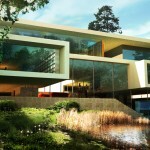 Description: The location for this project is a generous estate on a sandy and spectacular point along the Dnipro River just outsideKiev. 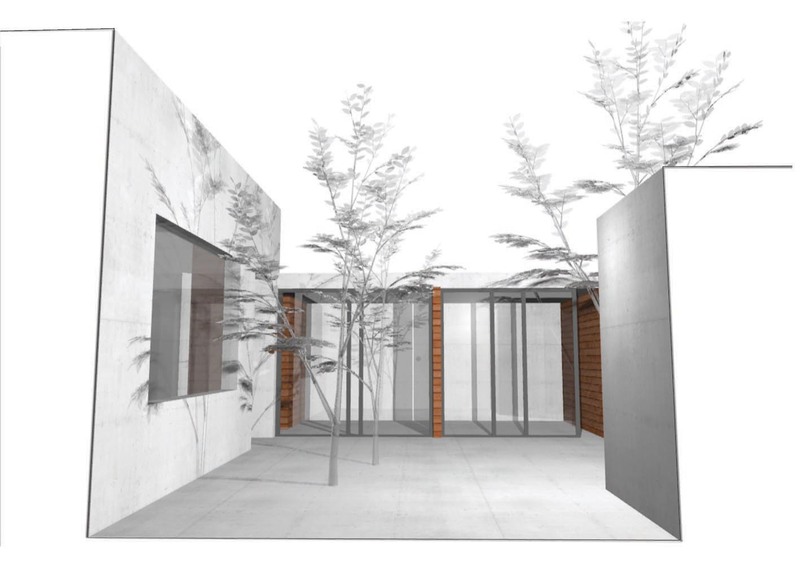 The building will be a home for the client’s mother and serve as a complement to his own house on another part of the site. 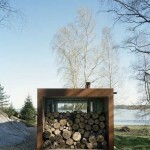 Persistent winds from various directions called for a house that would offer shelter in many different directions. 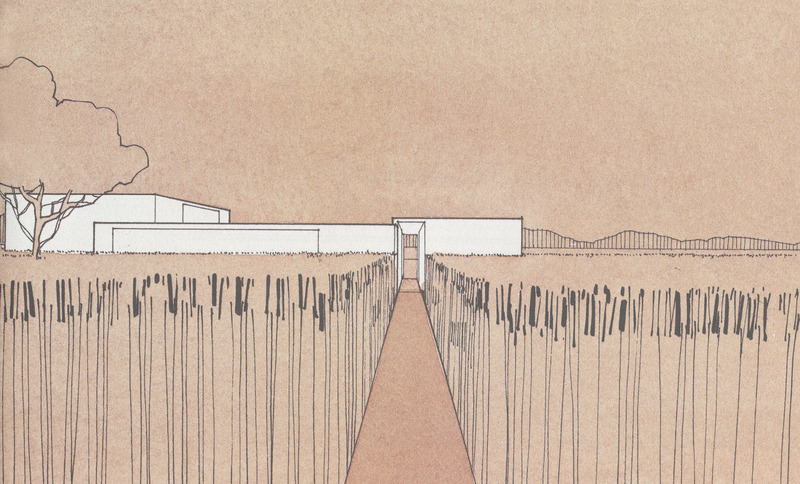 The site, built up entirely of sand, evoked the urge to shape the landscape, letting building and landscape meld together as one. 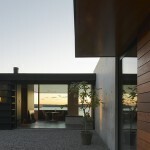 Long walls serve as support for the sand, forming interior and exterior rooms. 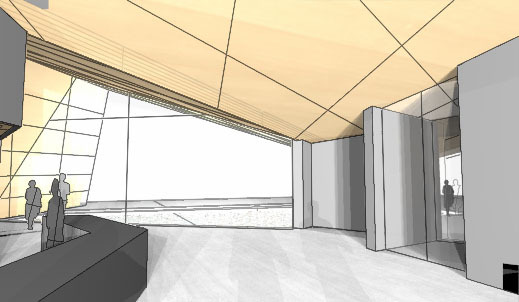 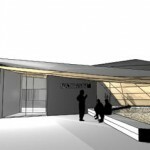 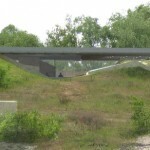 A large roof covers part of the structure, while the glass skin separates inside from outside. 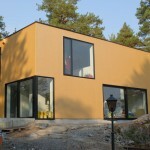 In the year 2008, the guidelines in Sweden for the size of complementary buildings allowed to be built without a permit were changed from 10m2 to 15m2. 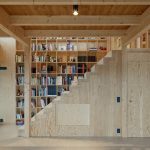 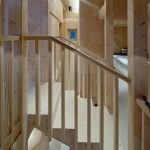 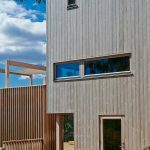 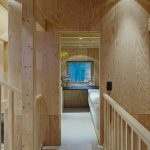 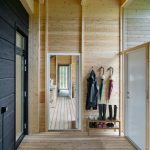 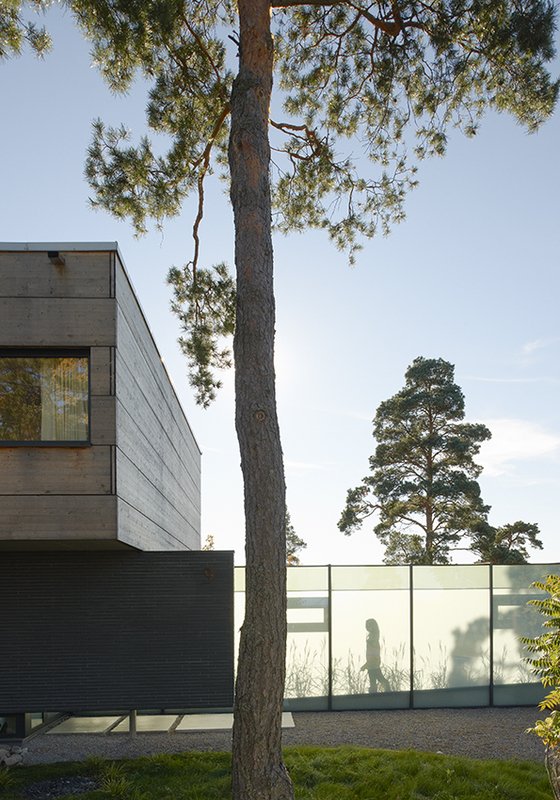 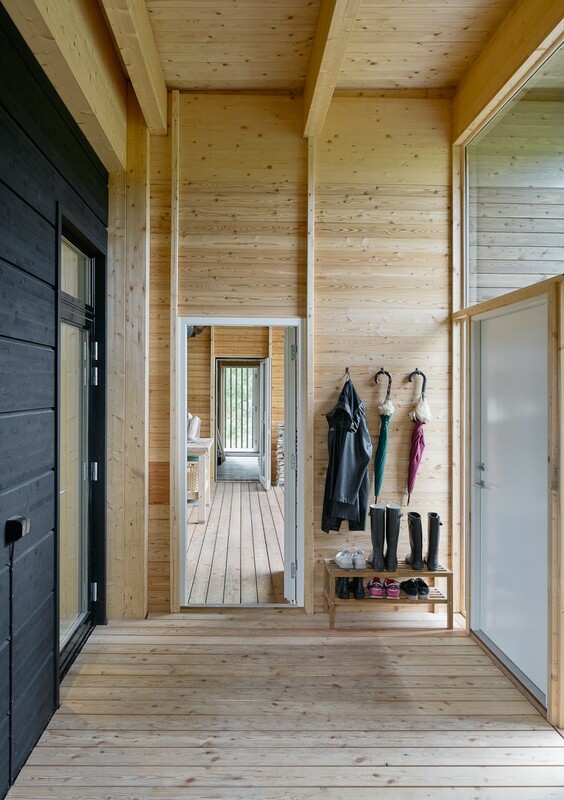 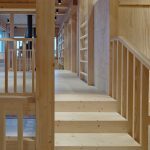 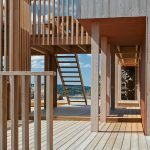 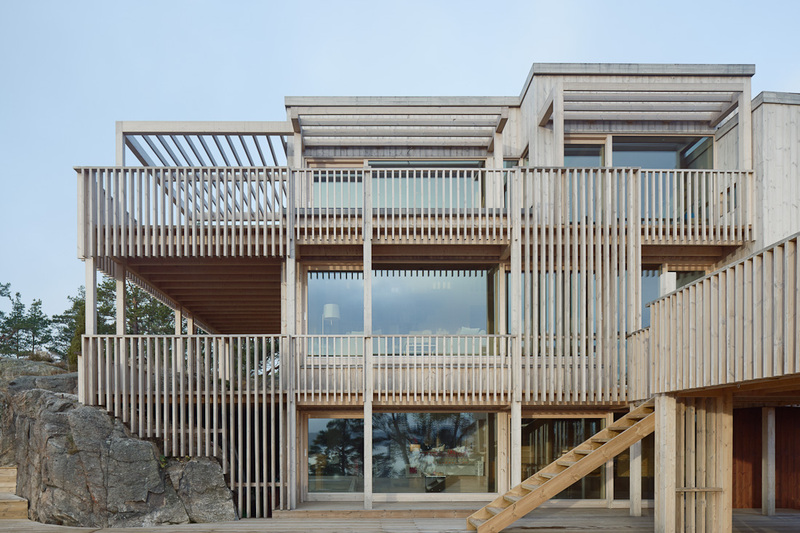 To promote the use of wood in private building projects, the Swedish Forest Industries Federation asked three architectural offices to develop building types that make use of these 15m2. 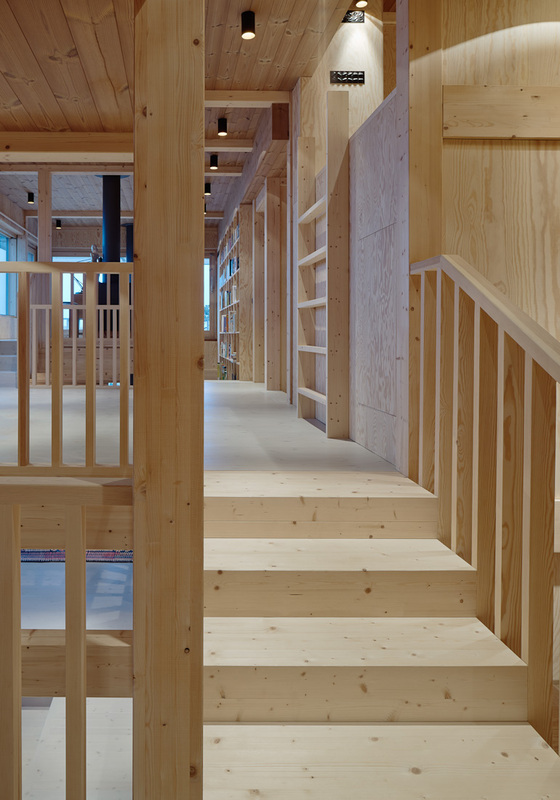 These buildings are meant to be erected by private people, guided by construction drawings and shopping lists. 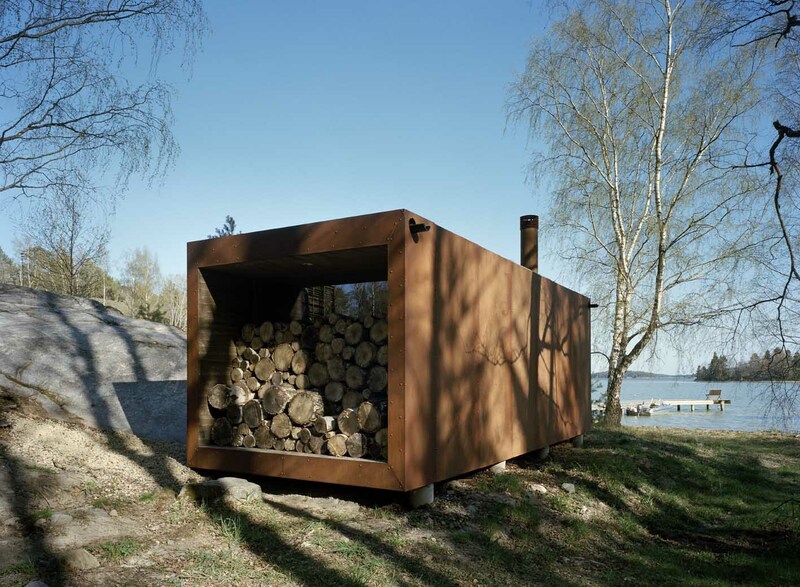 Our task was to design a shelter for relaxation, which we concluded could involve quite different activities for different people and places. 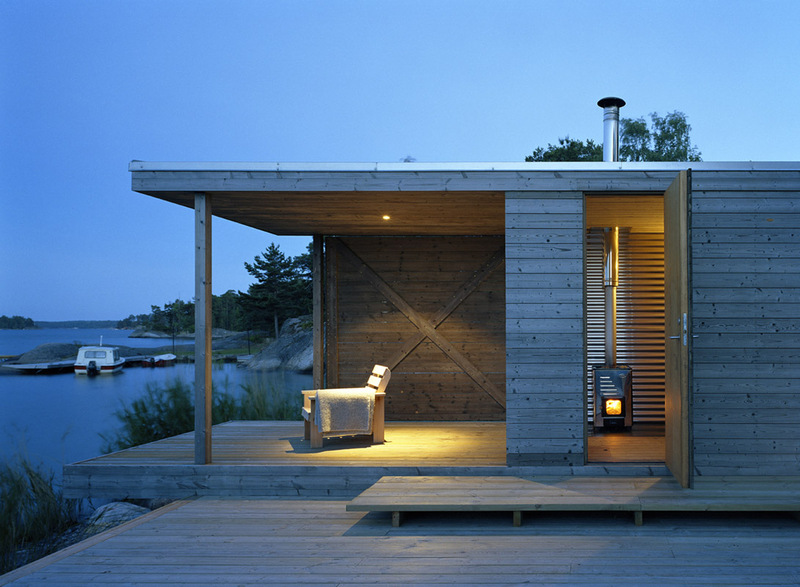 For some this could be a sauna with ice-water tank, whereas for others it might be a place to paint or do carpentry. 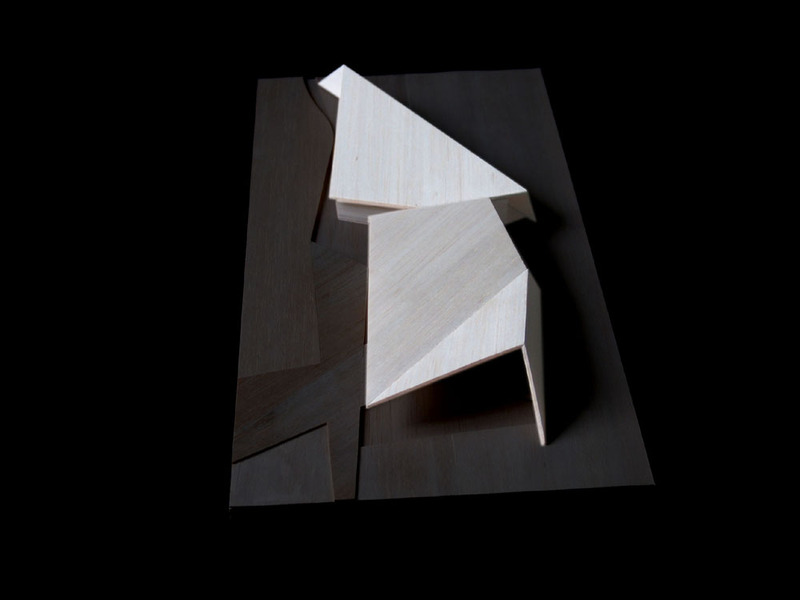 Therefore, we developed a flexible framework, making room for different interpretations of the theme. 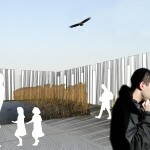 Additional design team: Ida Nordesjö. This project was developed during our ’Arkitektstudio WRB’ time period. 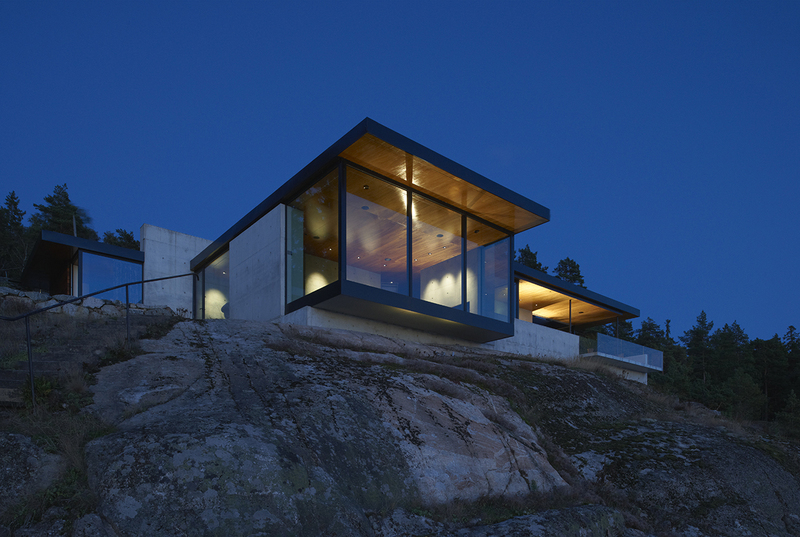 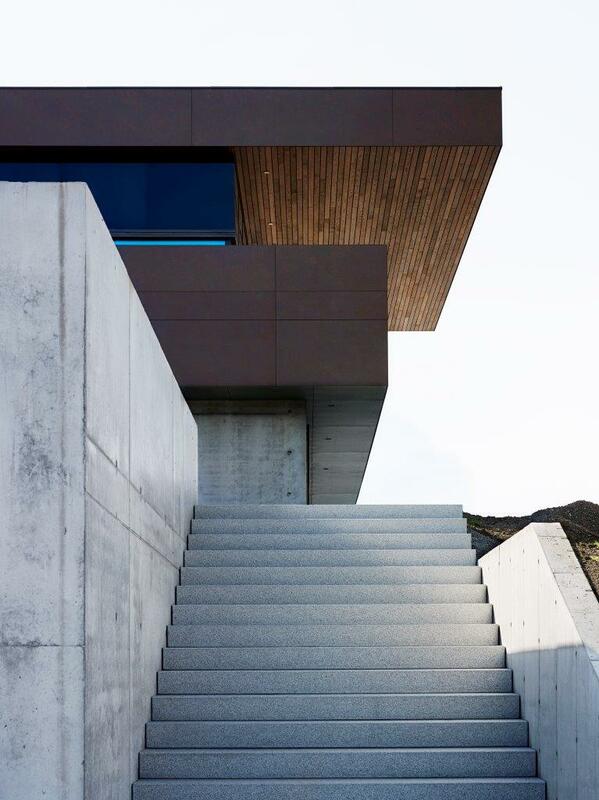 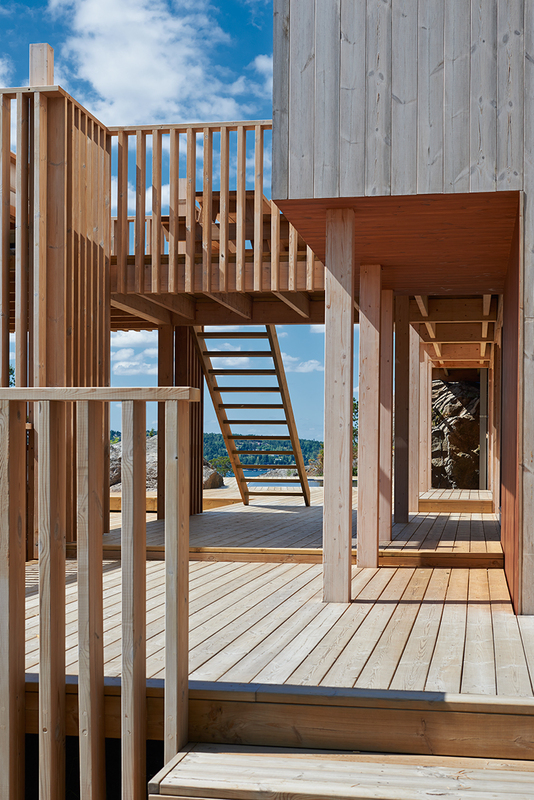 A stunning fjord site on Scandinavia’s most western point is the background for this project. 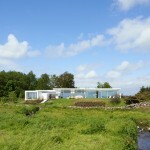 When we first visited the site, a fairly new house occupied the southern part. 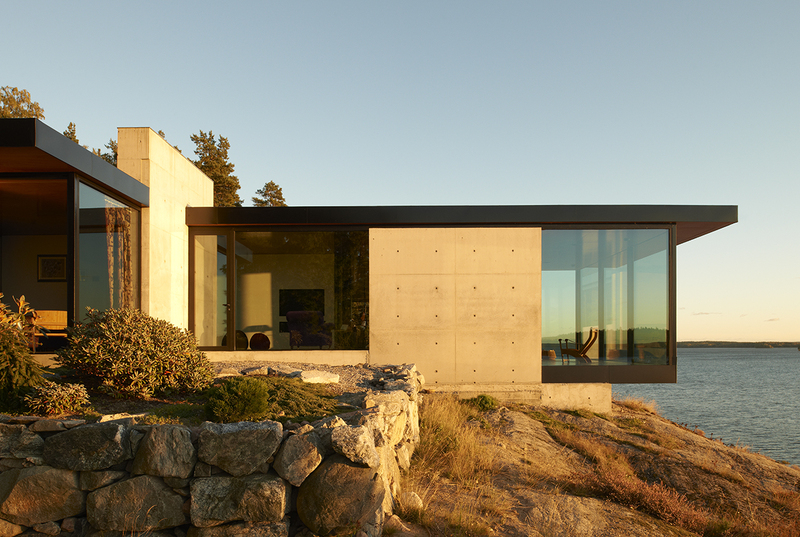 As a result, the remaining part of the plot ended up in shadow, while the sunny patio on the south side of the house was crammed against the rocks and cut off from the sea view. 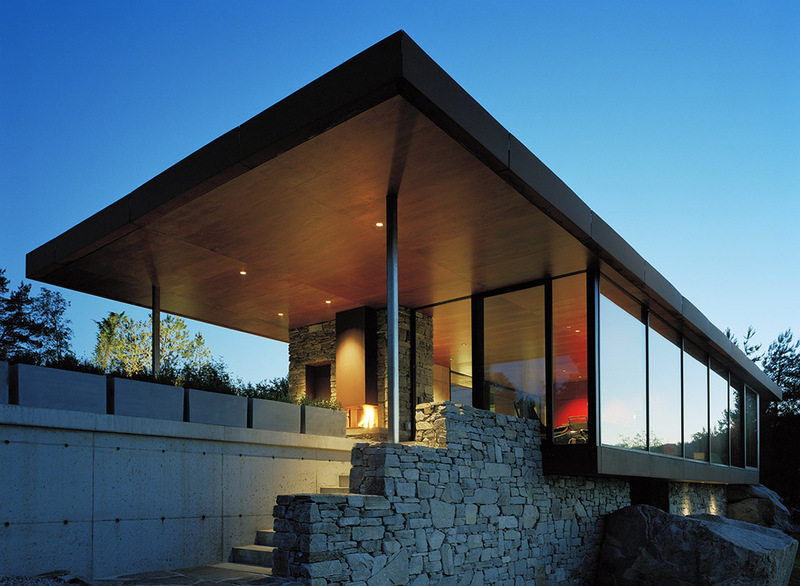 Our clients saw the site’s potential and never had any doubts about tearing the house down. 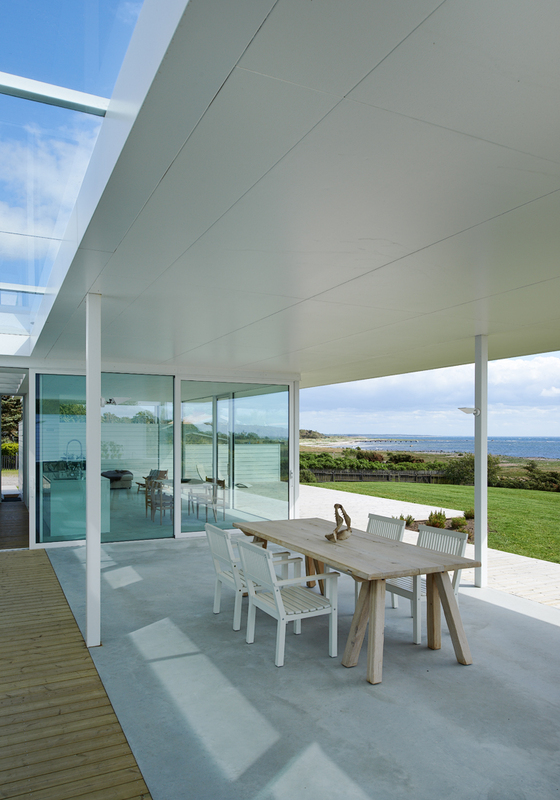 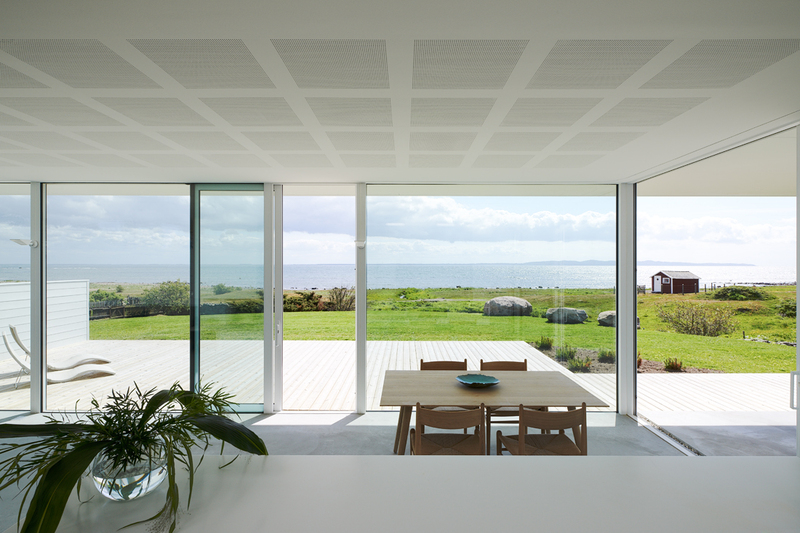 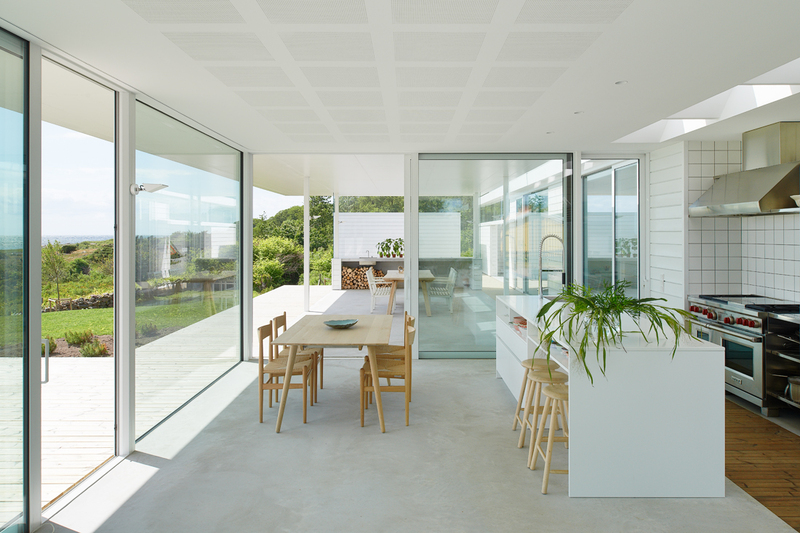 Our design leaves the southern side of the plot open by forming a transparent glassed shelter towards the sea, providing protection from occasional strong winds from the north. 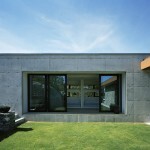 By placing a concrete box with more closed functions towards the entrance road in the west, the courtyard was made even more secluded. 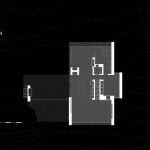 Now the heart of the setup, comprising the roof-covered patio with open fireplace and heated pool, is placed right where the old house once sat. 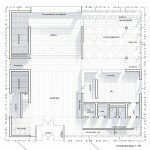 Additional design team members: This project was developed during our ’Arkitektstudio WRB’ time period. 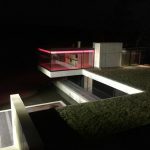 Description: The project started out as a search for a geometrical principle which could shape the indoor and outdoor spaces in accord with the site’s special qualities as well as the client’s ambitions. 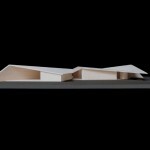 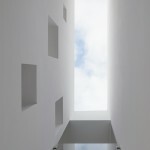 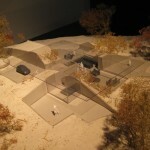 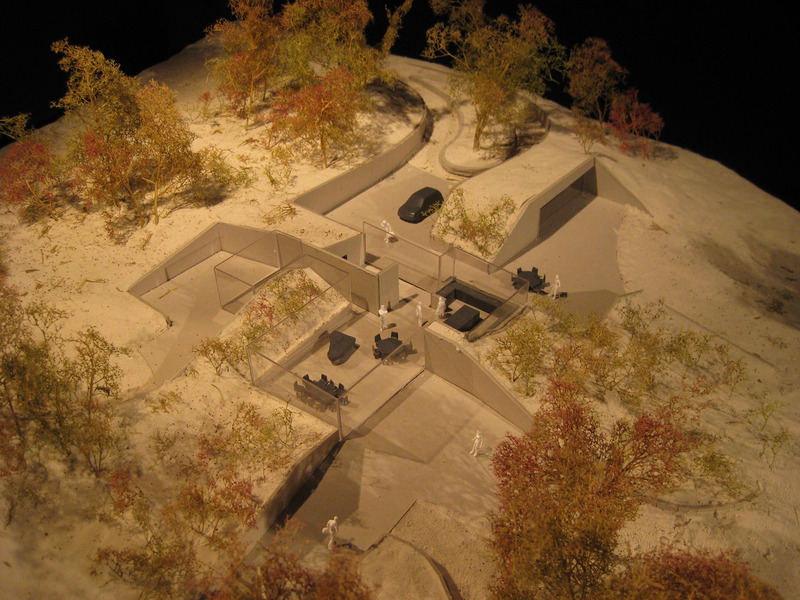 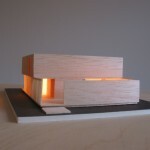 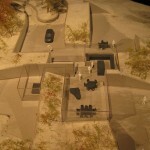 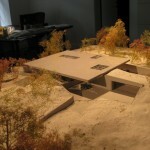 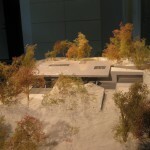 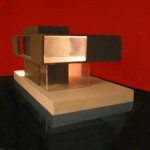 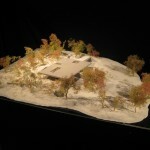 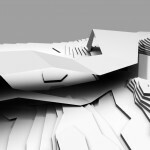 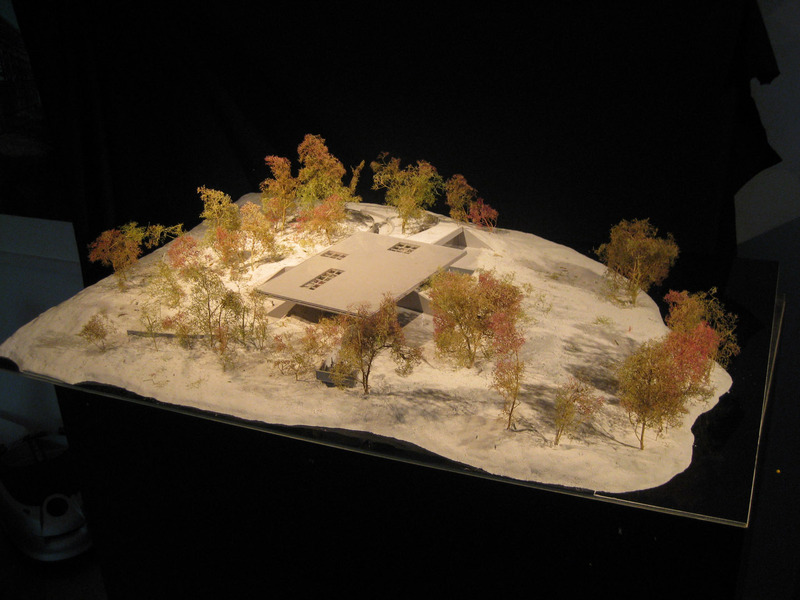 The light, the view and the wind on the plot were the main parameters in the model studies that followed. 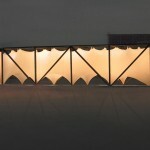 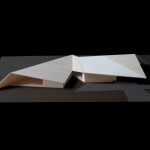 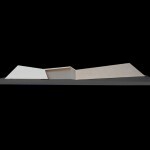 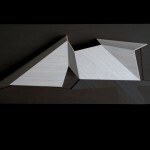 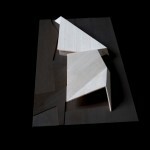 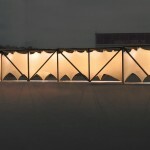 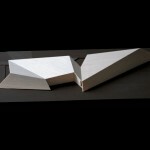 The result was a structure that folds and unfolds in three dimensions. 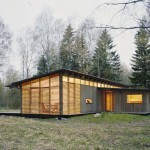 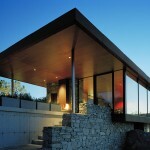 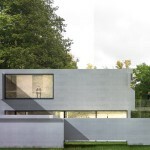 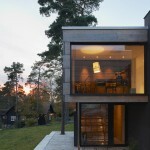 It unfolds the house towards the sun and view, while folding back in other parts, enclosing internal functions. 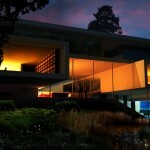 The house sits back on the site, unfolded but still private. 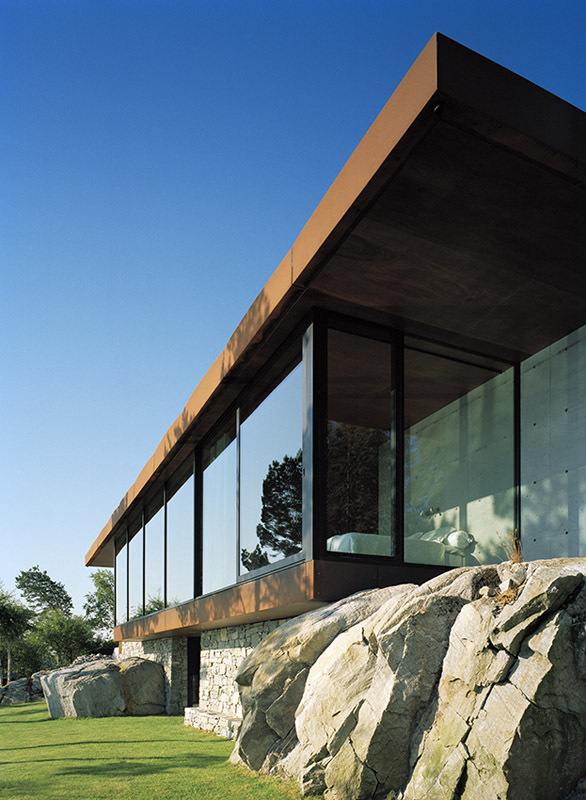 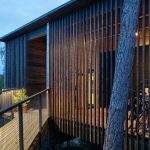 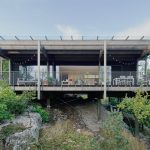 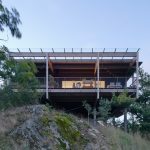 The back of the house lies close to the adjacent steep slope, creating an intimate outdoor space composed of rocks, water and wood. 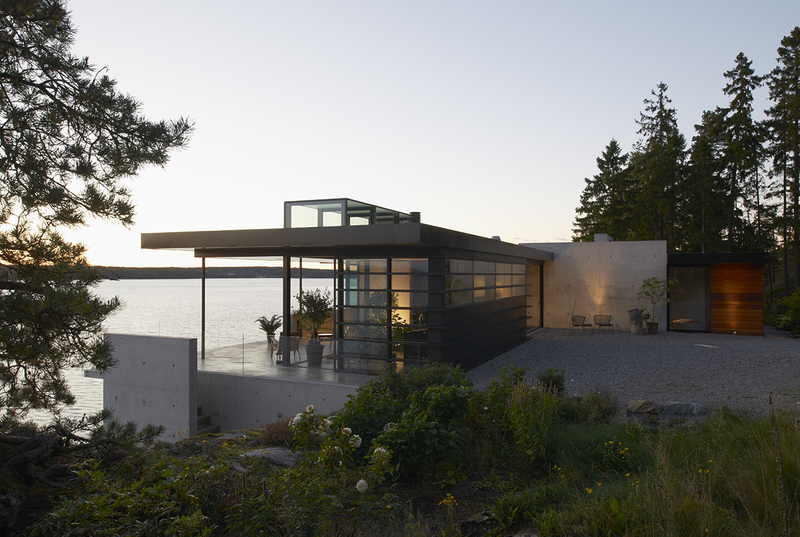 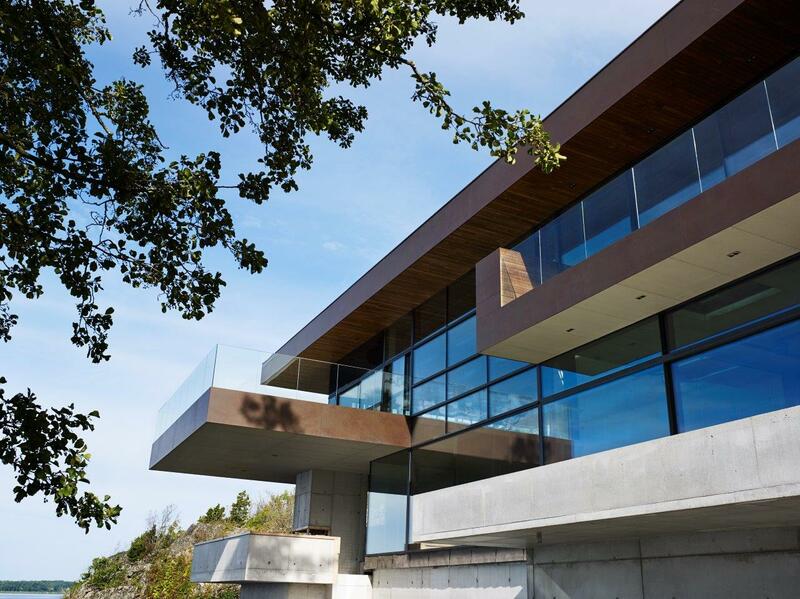 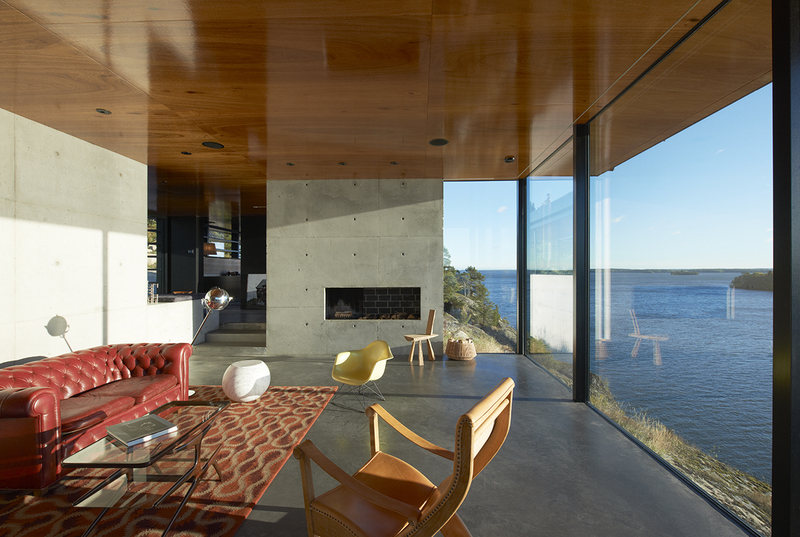 On the opposite side, the house embraces the outdoor patio, which includes an infinite pool, and overlooks the seaside cabin and the rocky waterfront below. 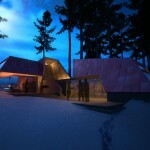 Additional design team members: Daniel Johansson, Ola Keijer. 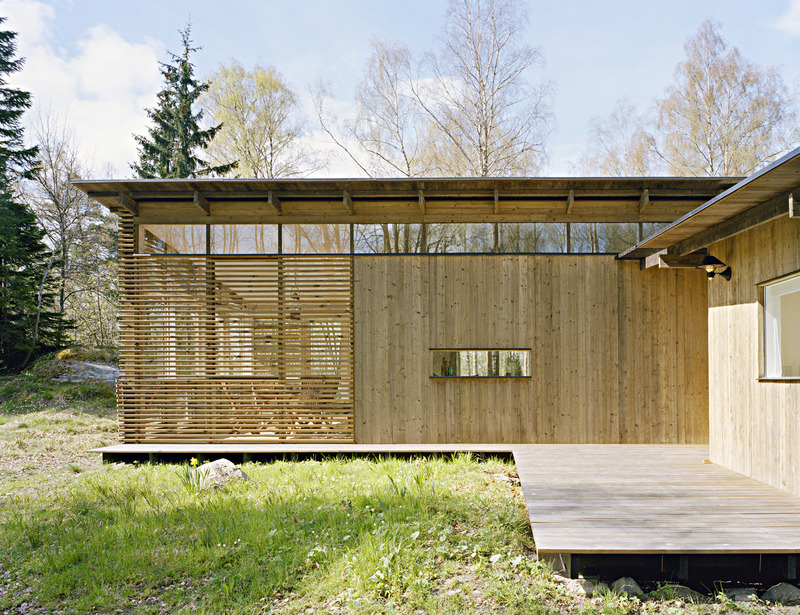 This project was developed during the ’Arkitektstudio WRB’ era. 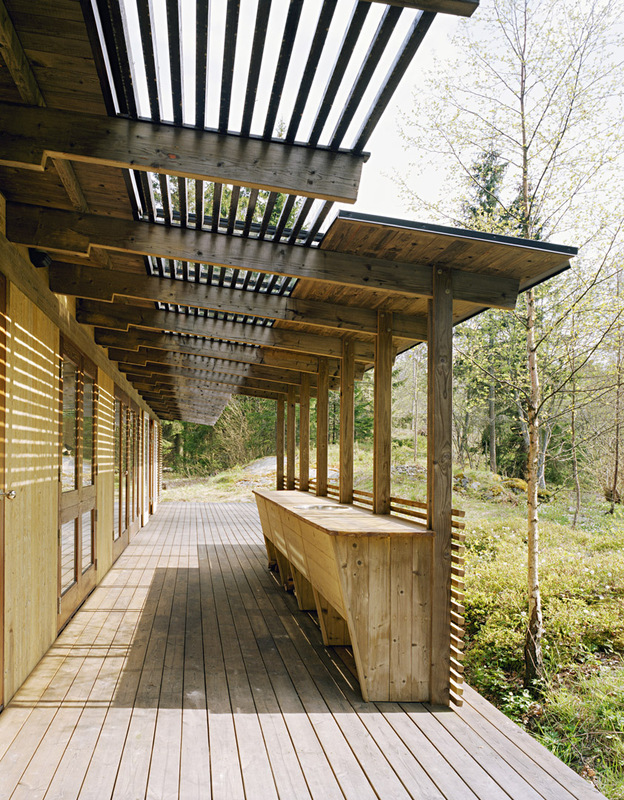 Type of building: This kind of visitors center is in Sweden called “Naturum”and is a patented name used by the Swedish Environmental Protection Agency. 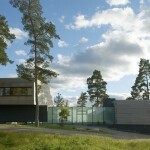 A Naturum can be described as a cross between a visitors centre and nature museum. 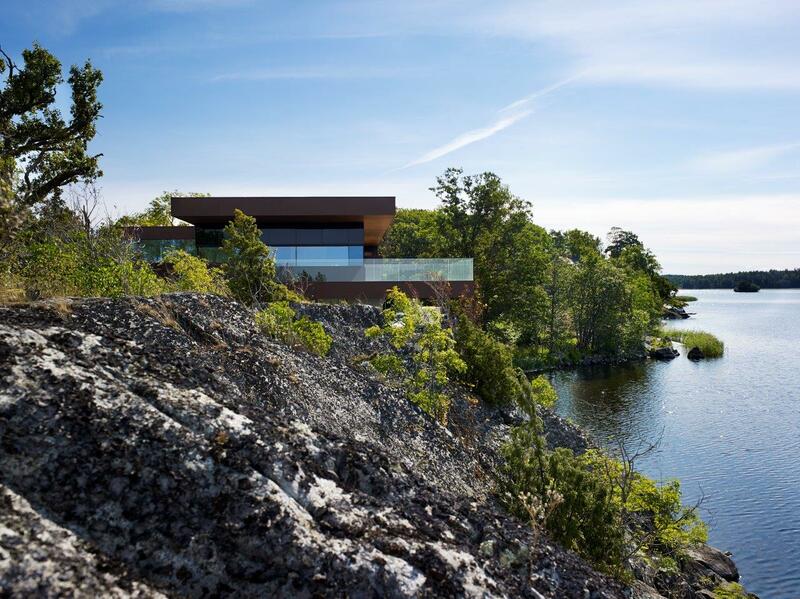 Tinnerö Eklandskap is a vast and unique nature reserve of 50,000 hectares, including some of northern Europe’s most valuable oak biotopes. 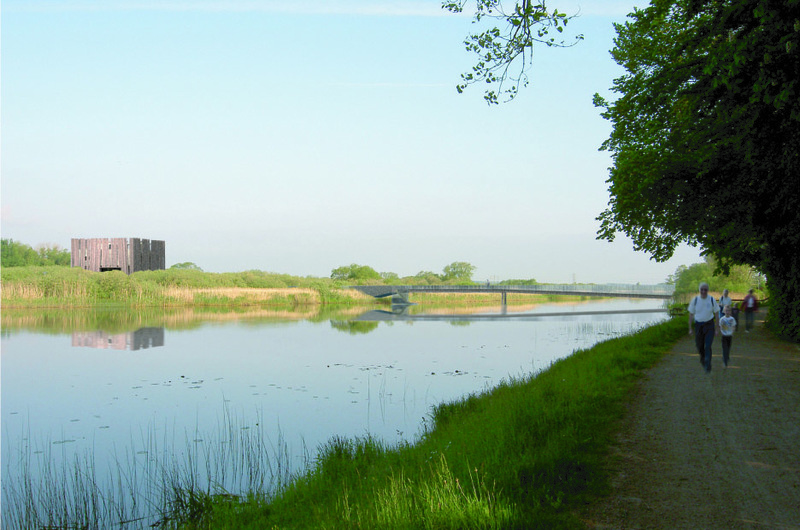 Throughout its history as royal hunting ground, and later military practice area, it has remained sealed off and unexploited. 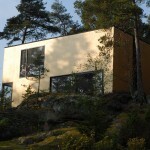 Unique for this Naturum building is that the location is right on the border between nature and city. 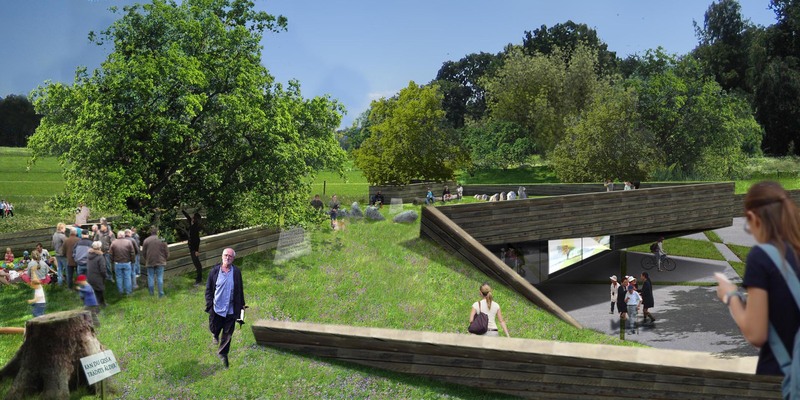 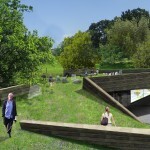 We saw our challenge in giving the transmission between the two an expression, designing a building to help connect nature to the city, and vice versa, thus avoiding having it become a barrier, as could easily be the case. 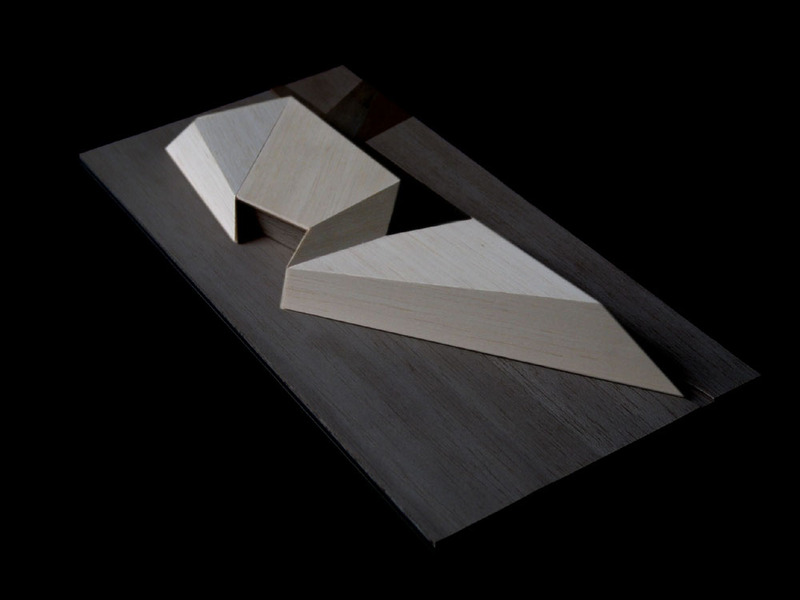 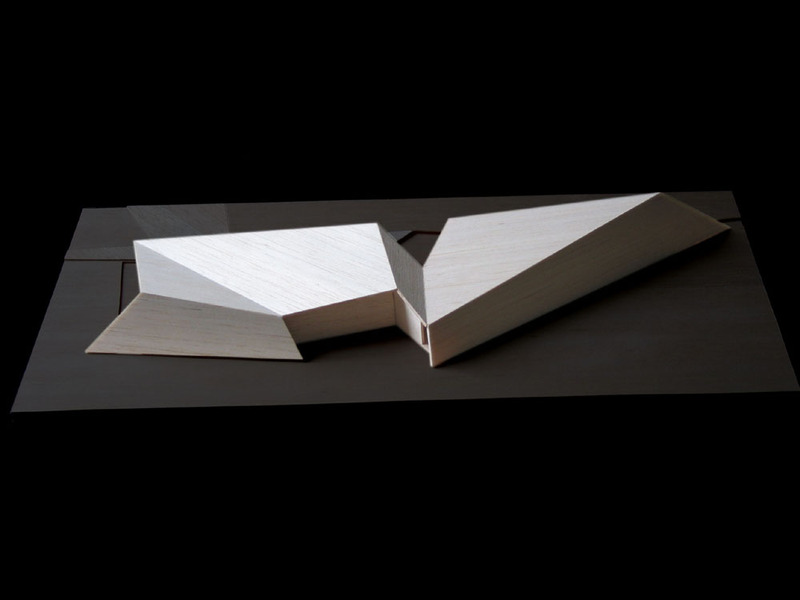 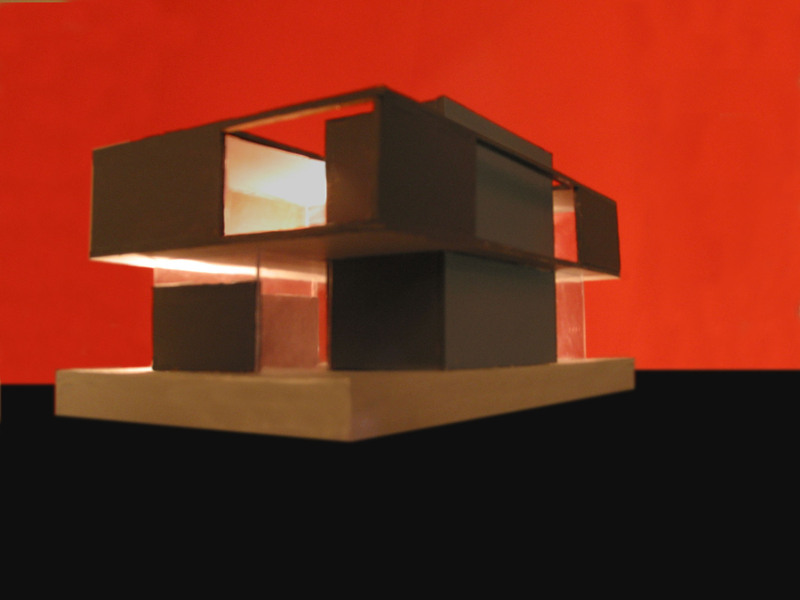 A series of concept models sewing the two together horizontally and vertically led us to our proposal, in which nature sweeps over the building to form an entrance way from the city, while the city runs through the building to end in an outdoor cafeteria in the park. 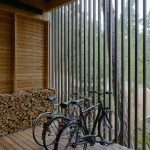 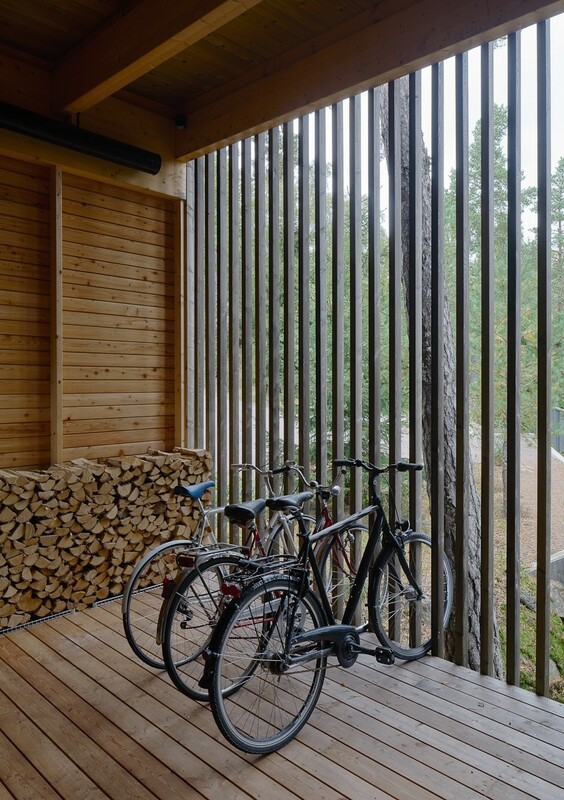 The majority of the building is composed of supporting walls clad in oak and material from nearby building sites, the latter partly to help minimise transport in the area as part of an ambitious eco profile. 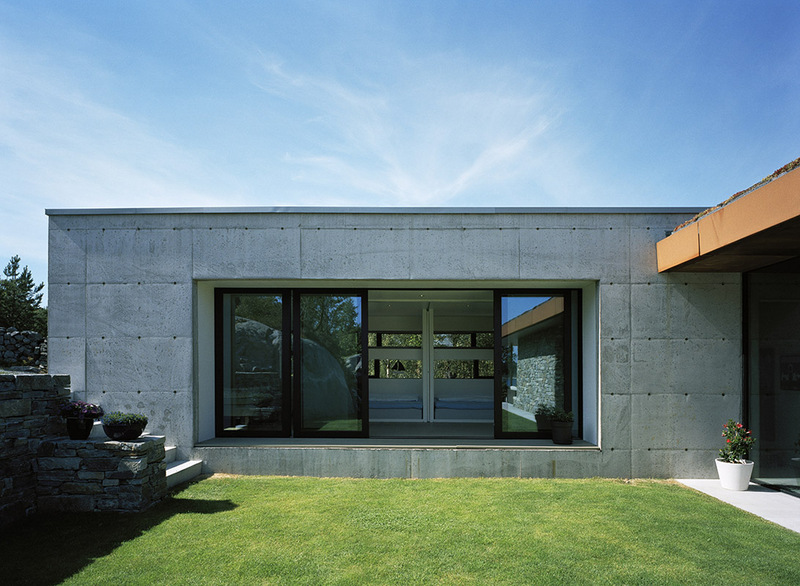 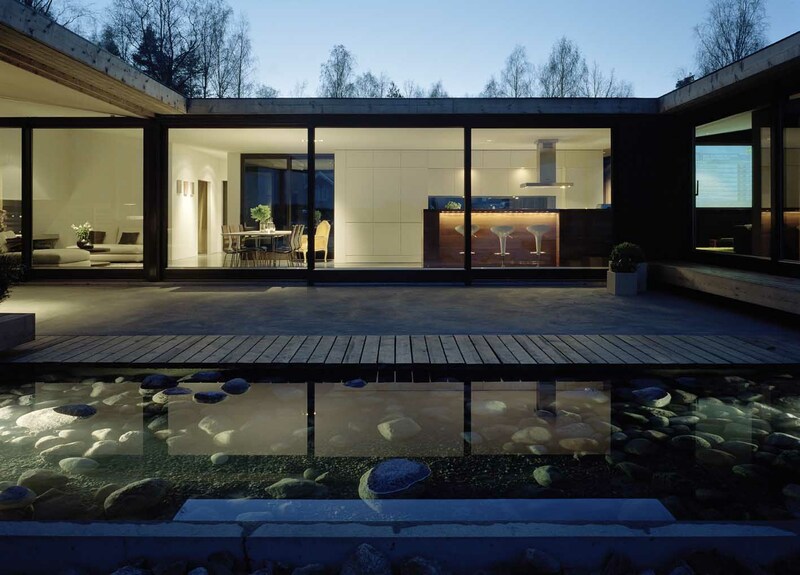 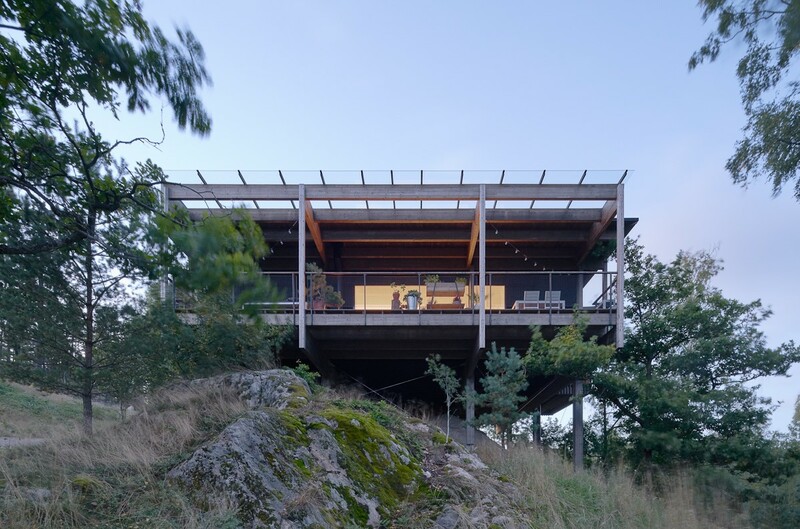 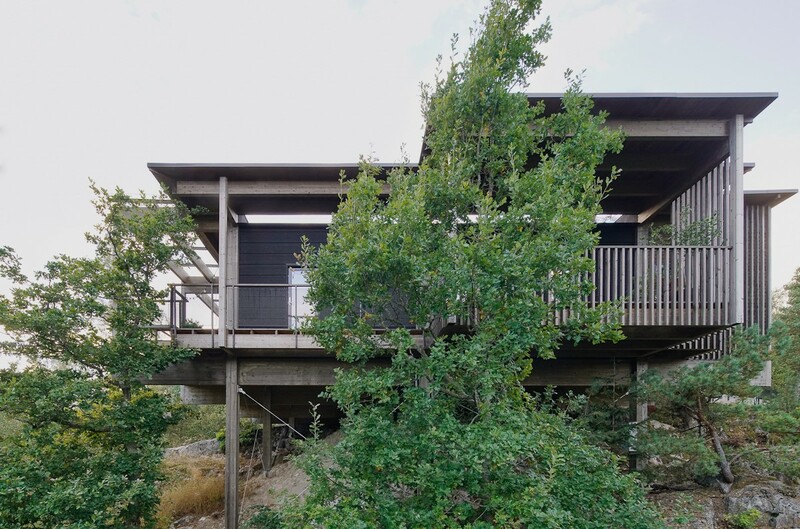 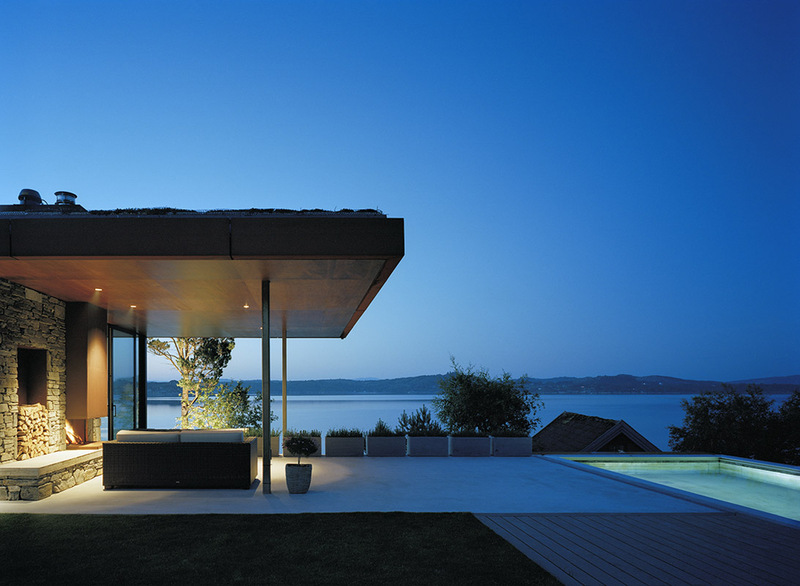 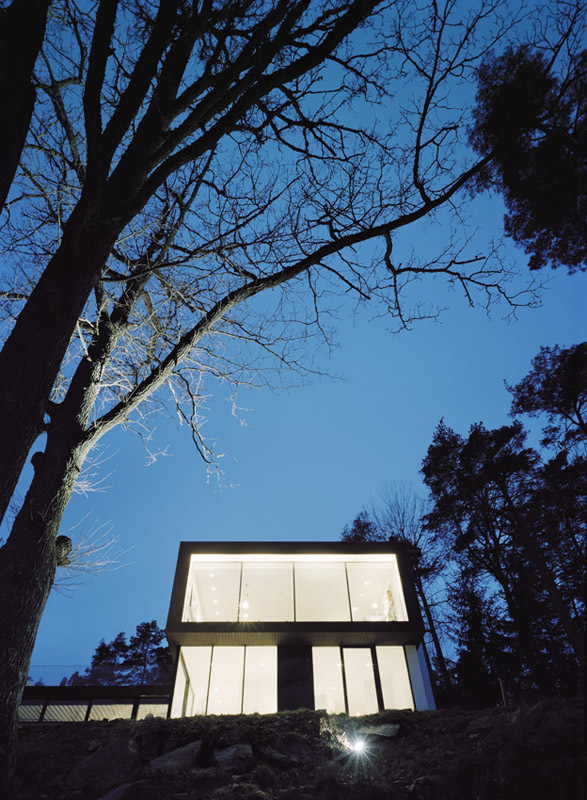 An existing summer house on a steep continuous slope was the starting point for this project. 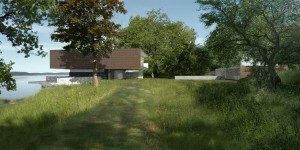 The old house sat in the middle of the property leaving only unusable, narrow and steeply sloping ground around it. 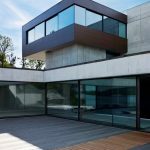 A main objective, therefore, was to regain the property and to create flat areas with good sun conditions for outdoor activities. 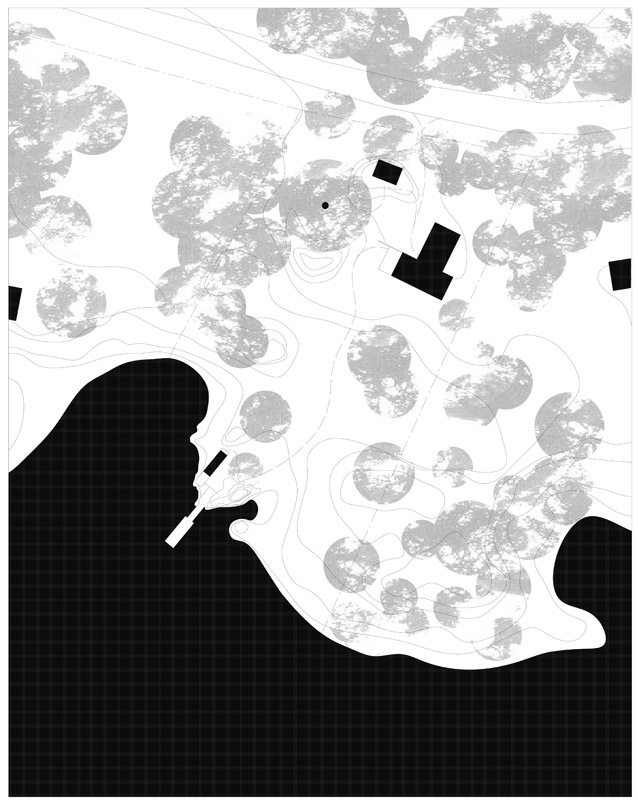 We placed the building on the northern property border, leaving most of the unexploited property facing south. 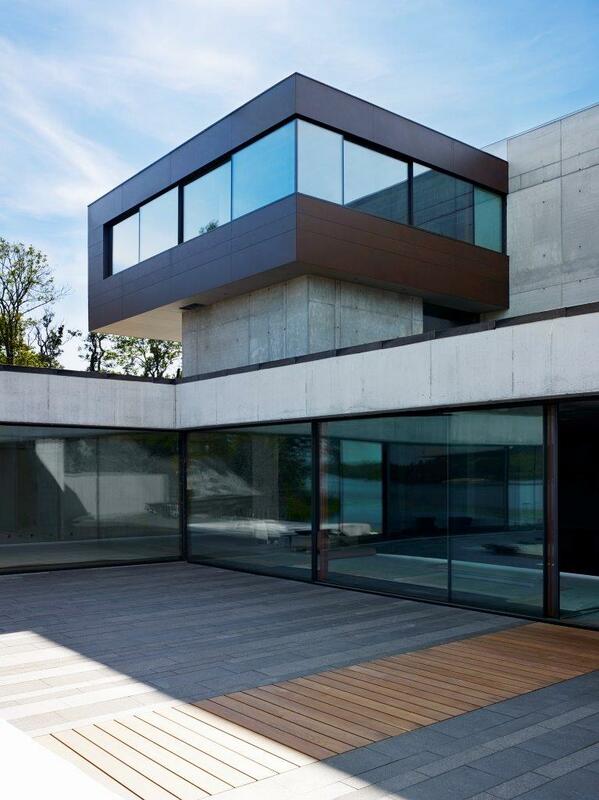 The biggest part of the building was dug into the slope, creating a large horizontal platform on ground level. 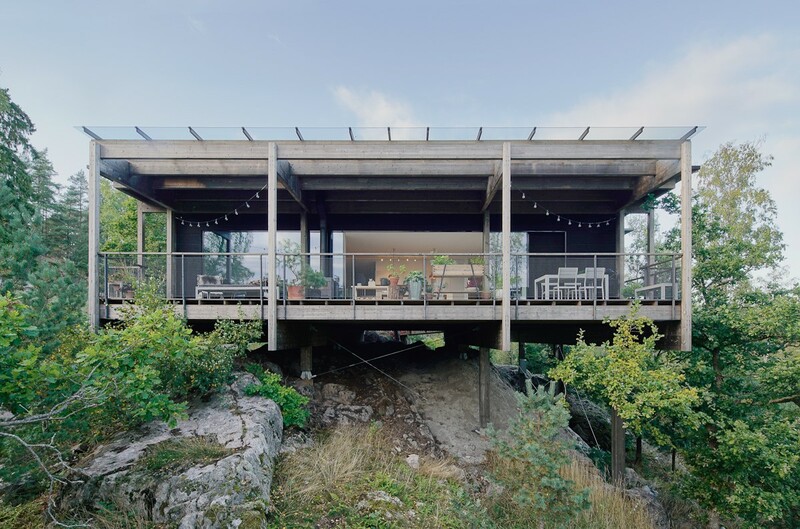 Half of this platform is taken up by the upper floor of the building; the other half remains an open outdoor terrace adjacent to the kitchen inside. 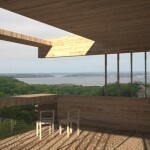 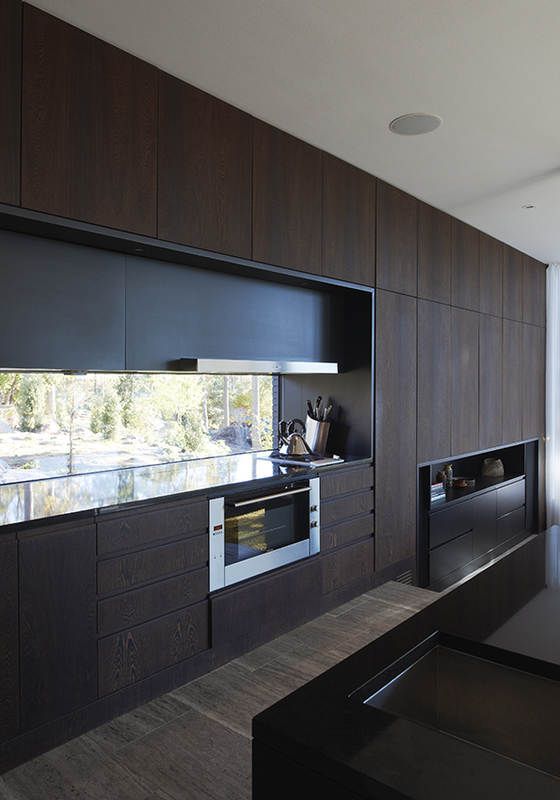 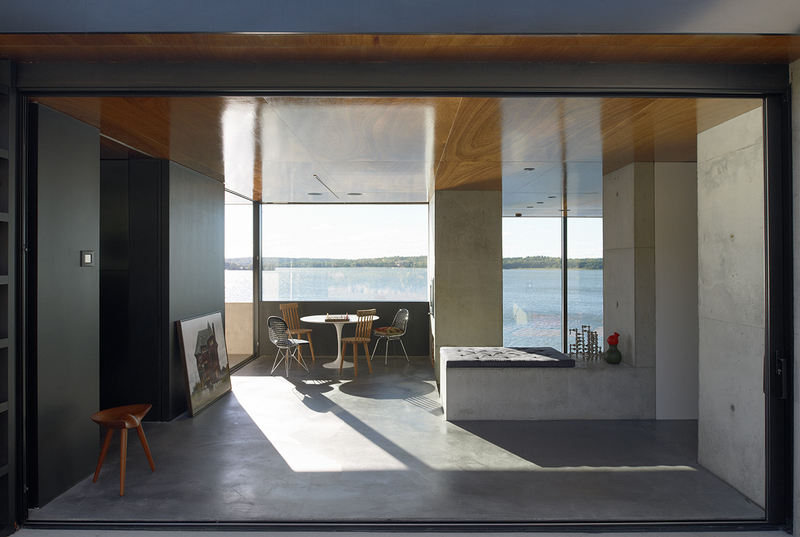 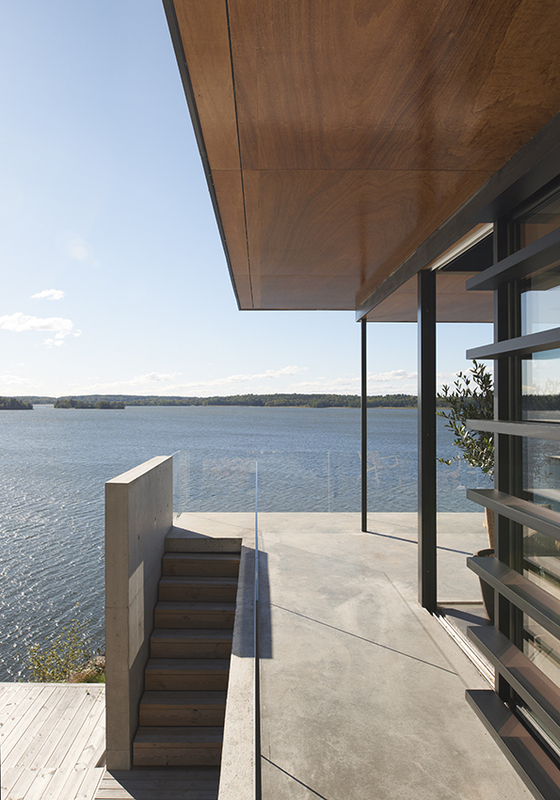 Next to the kitchen is the living area, which, from its elevated position, offers a view of the water, as well as the upper halves of two large oak trees. 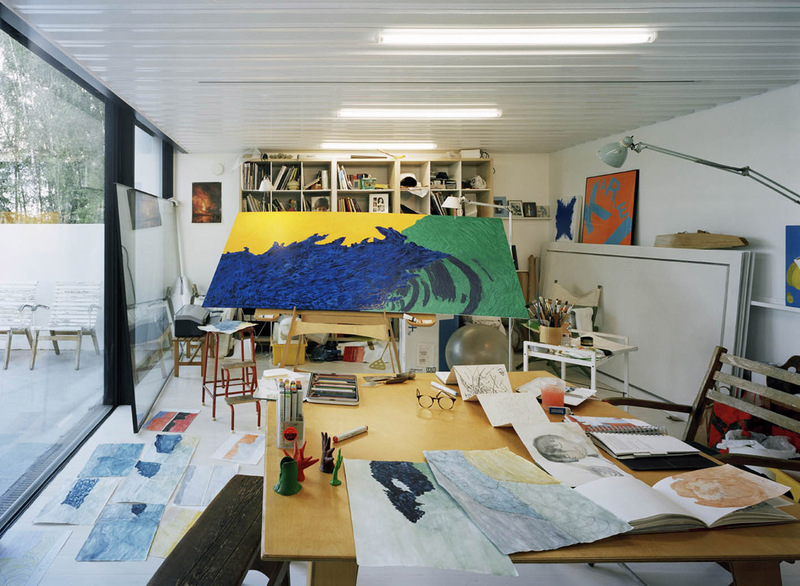 A place for inspiration and creation of precious art for this Italian painter and his Swedish wife, the studio makes an abrupt change to its traditional Swedish pitched-roof neighbours. 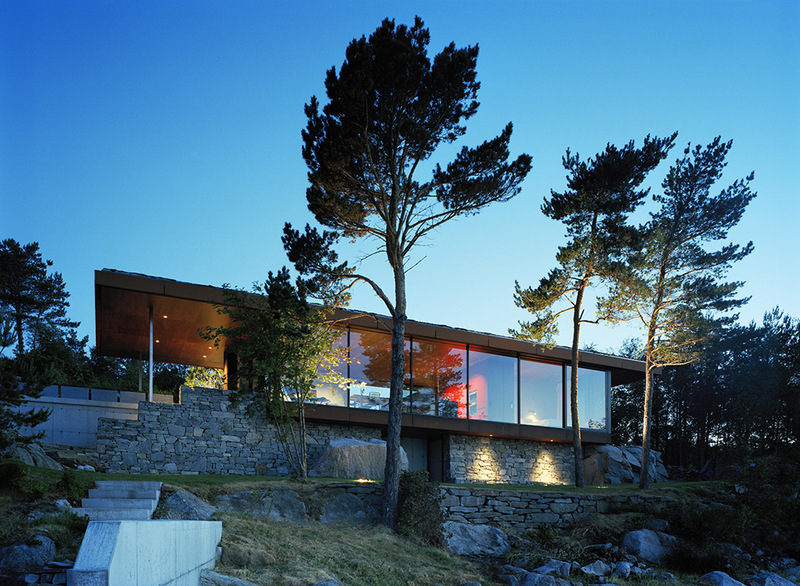 The building glitters as a golden shrine penetrated with large black windows, as it sits in the rocky slope among sculptural pine trees. 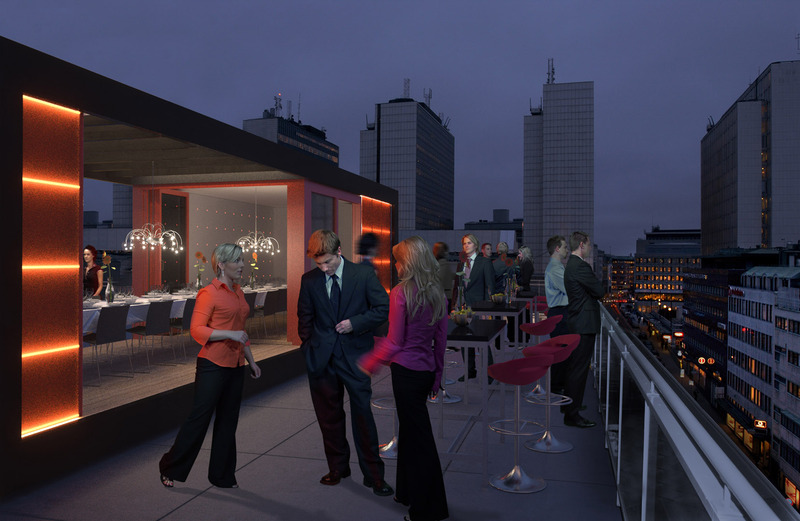 Additional design team members: This project was developed during the ’Arkitektstudio WRB’ era. 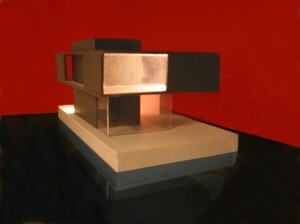 Type of project: Invited competition, second place. 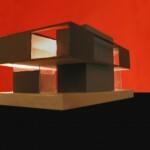 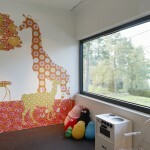 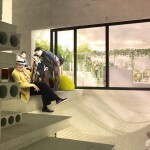 The competition was carried out in cooperation with the architectural office ’Happy Space’. 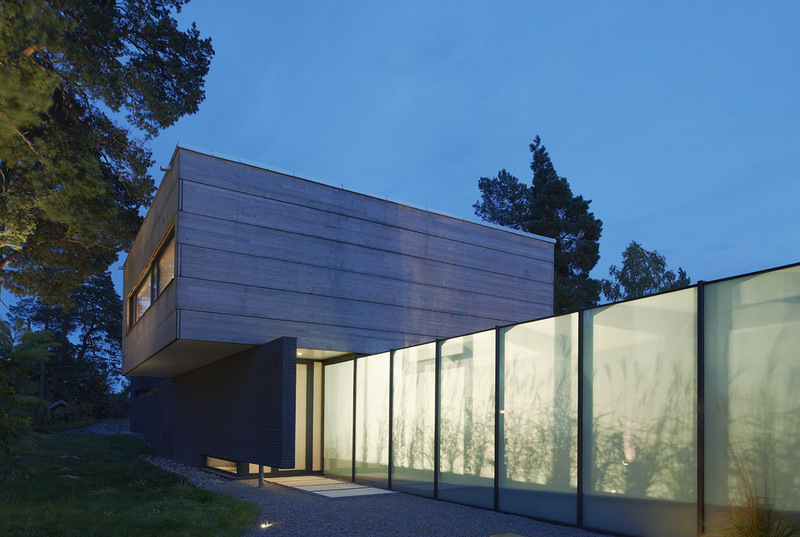 Location: A rich, swampy march landscape by Helge River, just outside the city walls of Kristianstad. 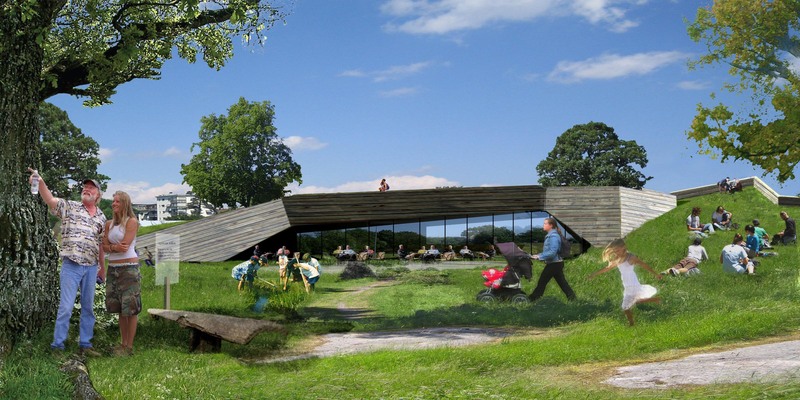 Type of building: This kind of visitors center is in Sweden called “Naturum” and is a patented name used by the Swedish Enviromental Protection Agency. 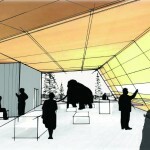 A ’Naturum’ can be described as a cross between a visitors centre and a nature museum. 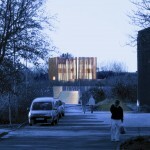 Included in the competition was a bridge leading to the building. 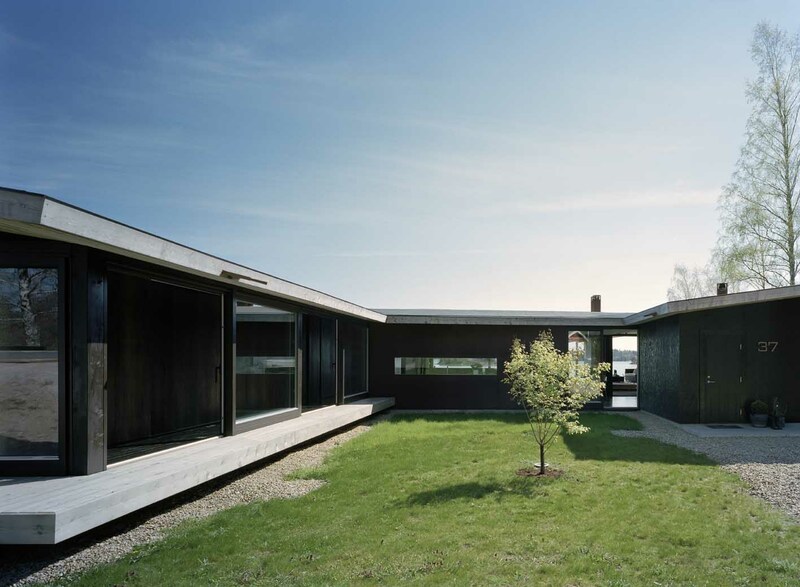 The town of Kristianstad has a long history of flooding. 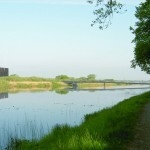 To protect the town from its hostile surroundings, it has been enclosed by a sturdy city wall. 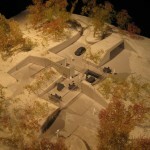 Today, much construction is taking place outside the original city walls. 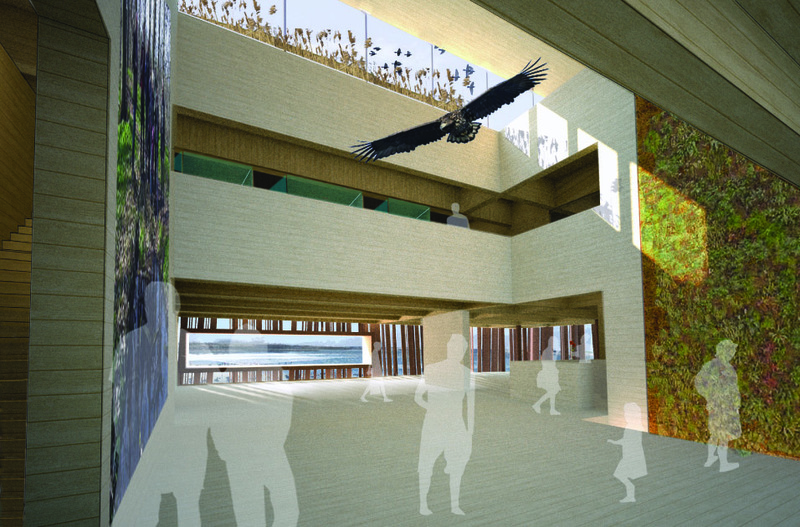 Therefore, one of the main objectives of the exhibition in the building is to replace the idea of the wetlands as an enemy with the understanding of what a biologically rich and fantastic ecosystem it is, in need of our attention and protection. 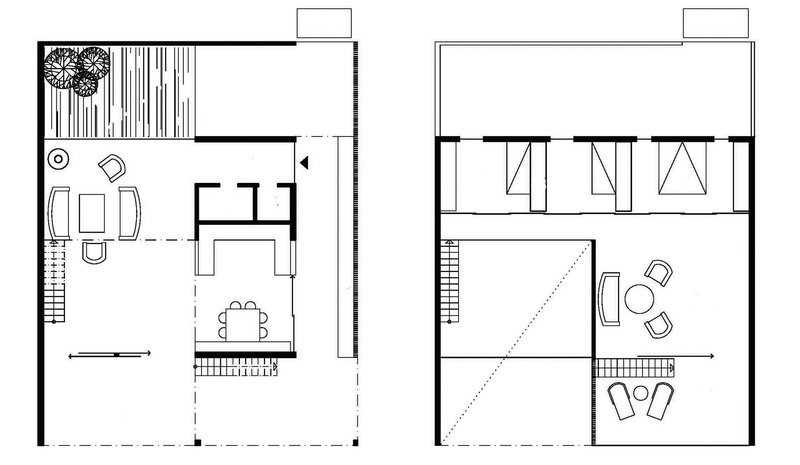 We divided the project into two parts. 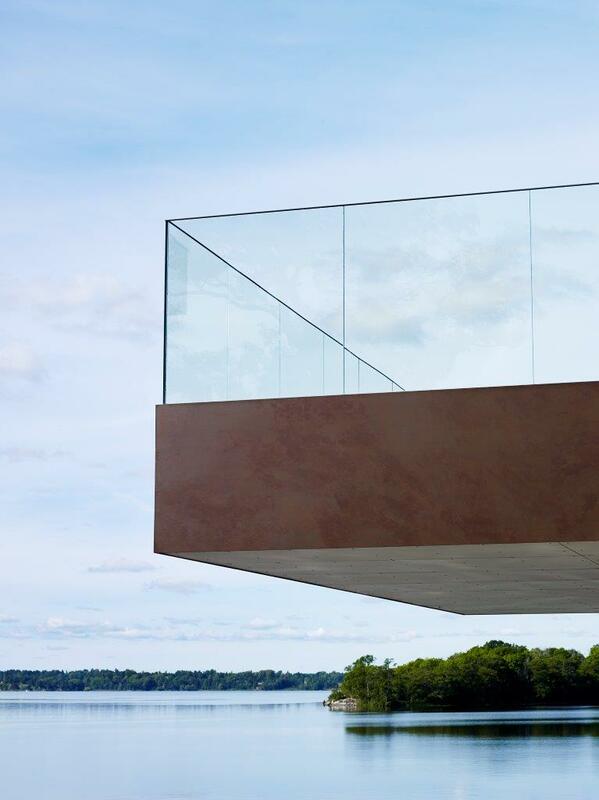 The bridge leading to the building presents the visitor to the area as it rises to give an overview, and then descends to enable a close encounter on floating platforms. 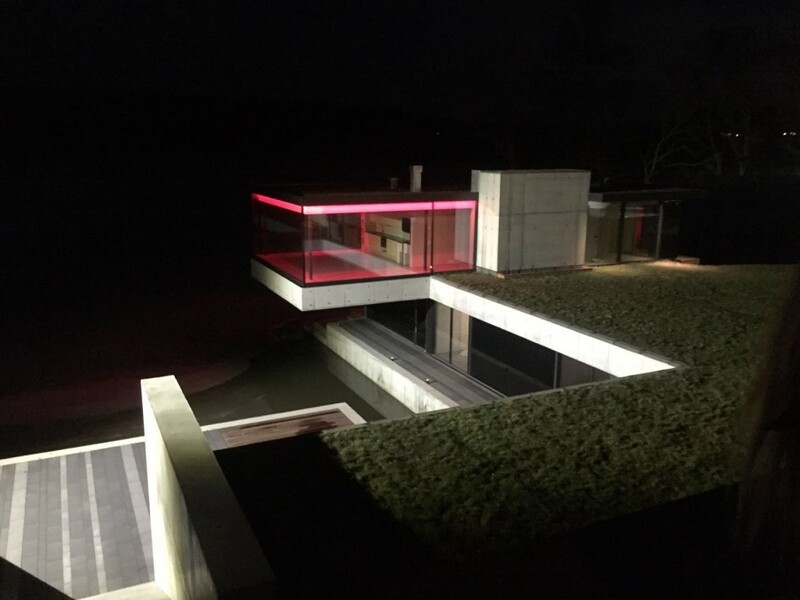 The building, on the other hand, has to withstand floods and is, therefore, elevated 3.5 metres above normal water level, keeping it clear during even the worst of global warming scenarios. 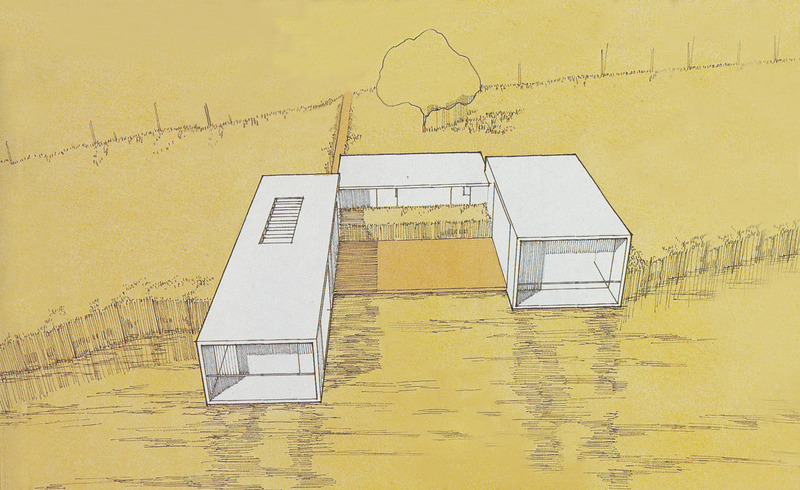 The idea of the building as an elevated outpost, cut loose from its surroundings, led to its simple geometric shape. 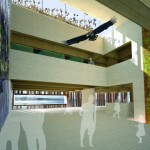 The facade is a reference to the reeds in which it is placed, and creates a transparent shield between the sensitive birdlife and the exhibition rooms inside. 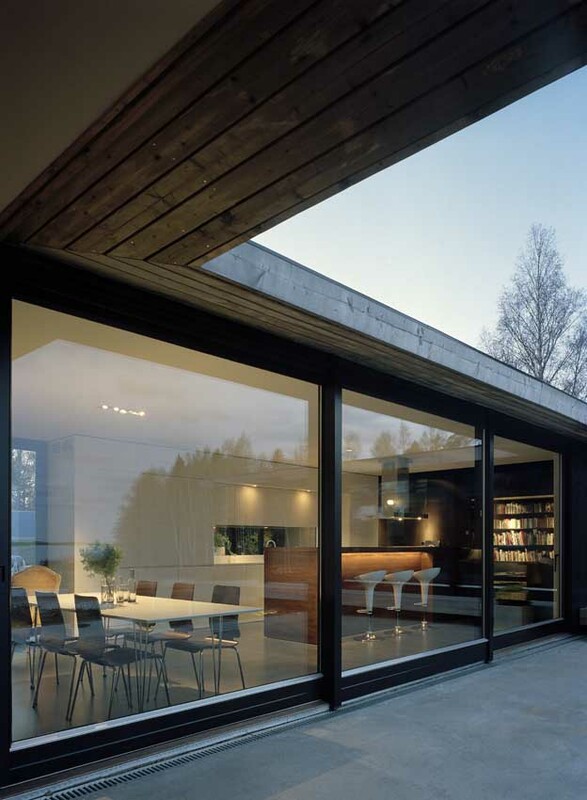 The roof forms an open platform from which one can watch migrating birds pass by. 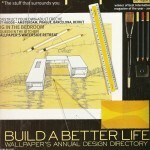 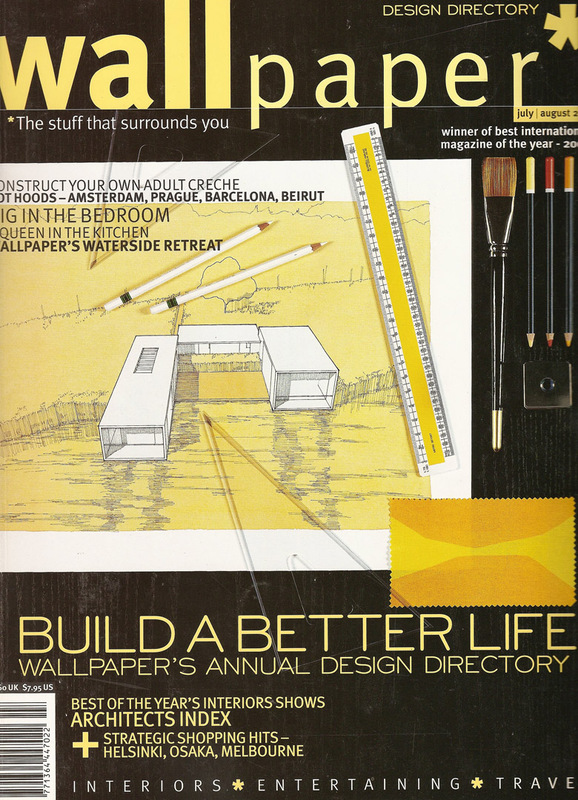 This competition was made during our ’Arkitektstudio WRB’ era. 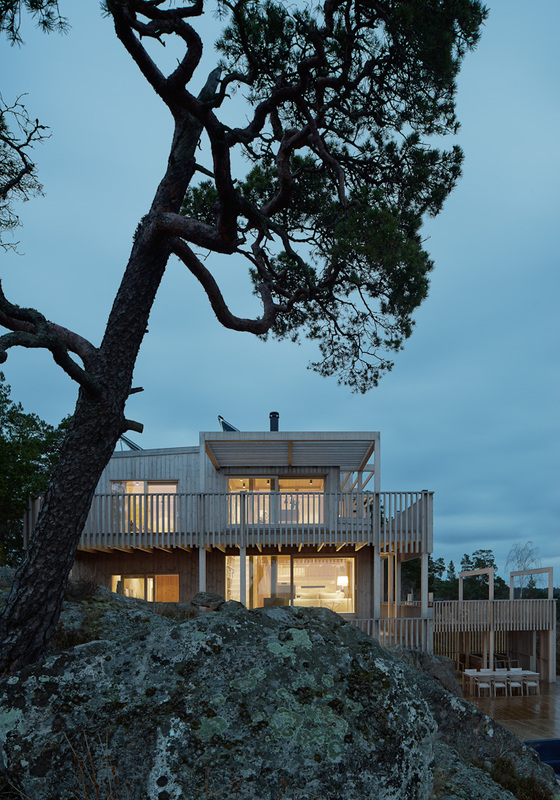 Location: The site was a natural forest setting at the foot of ’Skuleberget’, alongside the E4, halfway between the cities of Sundsvall and Örnssköldsvik. 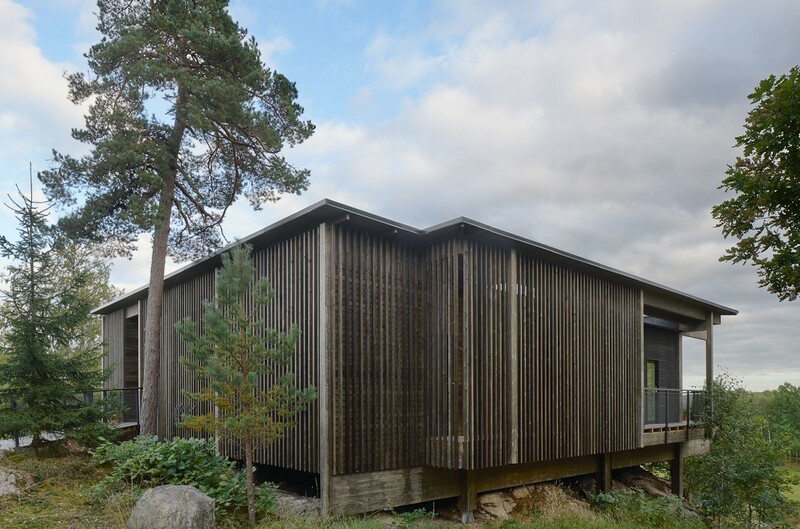 Type of building: This kind of visitors center is in Sweden called “Naturum”and is a patented name used by the Swedish Enviromental Protection Agency. 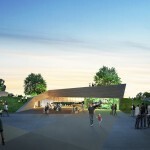 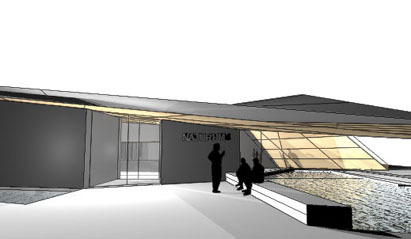 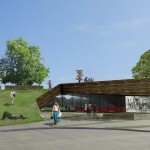 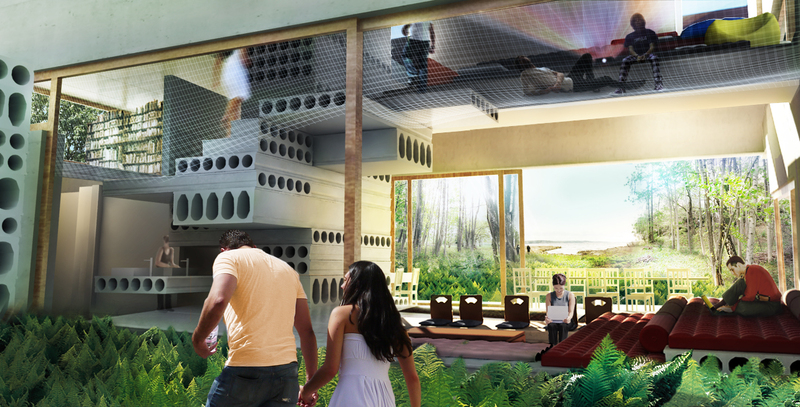 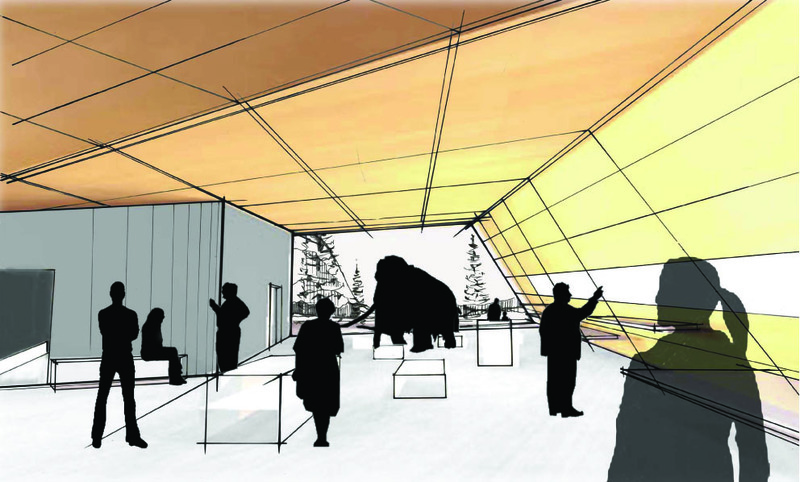 A ’Naturum* can be described as a cross between a visitors centre and a nature museum. 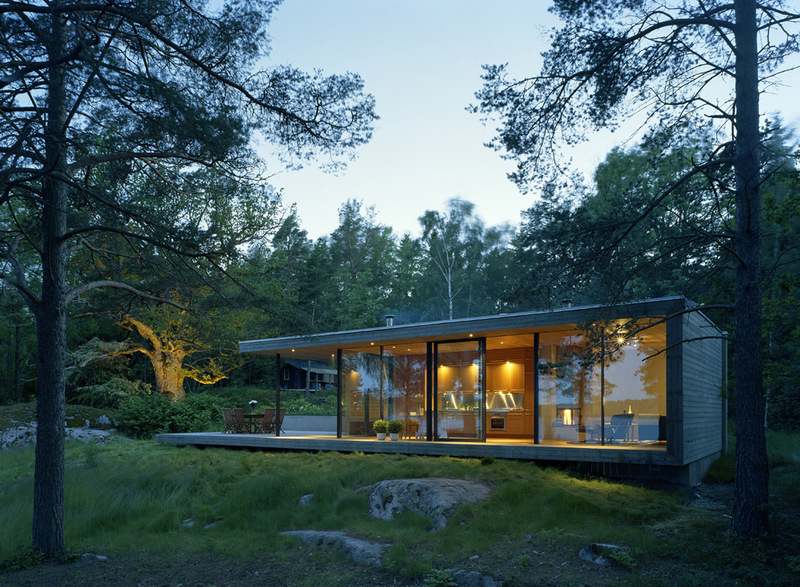 Often “Naturum” buildings sit in beautiful settings, places in nature that would be visited and appreciated even without any buildings. 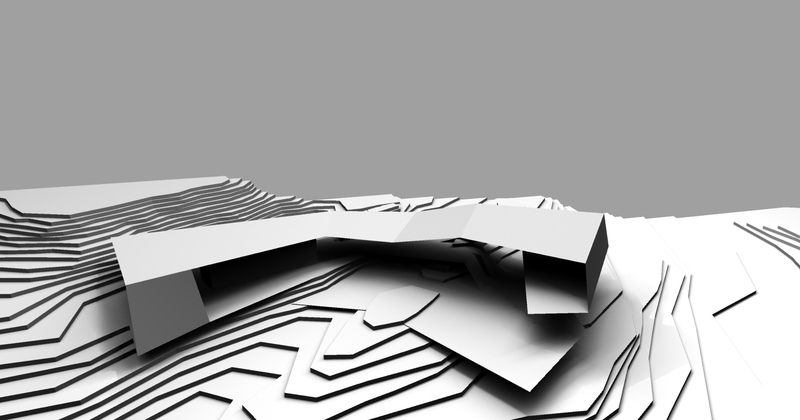 In this case, however, the dominating feature was the nearby highway. 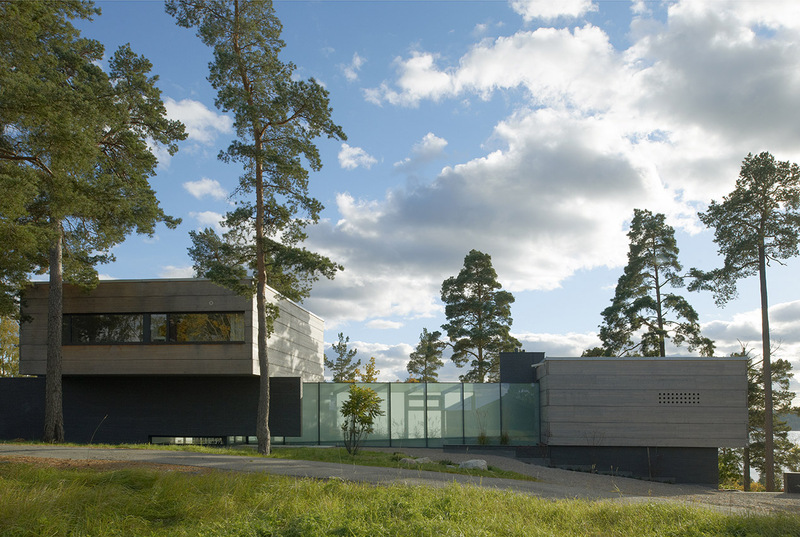 The purpose of the building was to be an exhibition and research centre for the world heritage area “Höga kusten”. 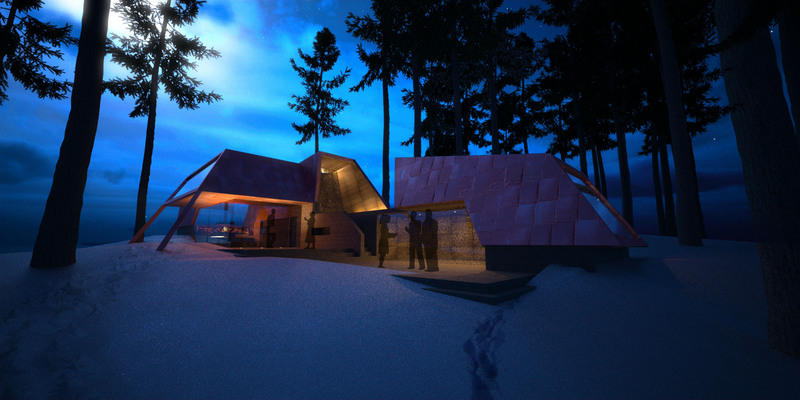 Our idea was to create the feeling of a “base camp” – a place from which you leave civilisation and go on to other activities in the area, such as hiking and climbing. 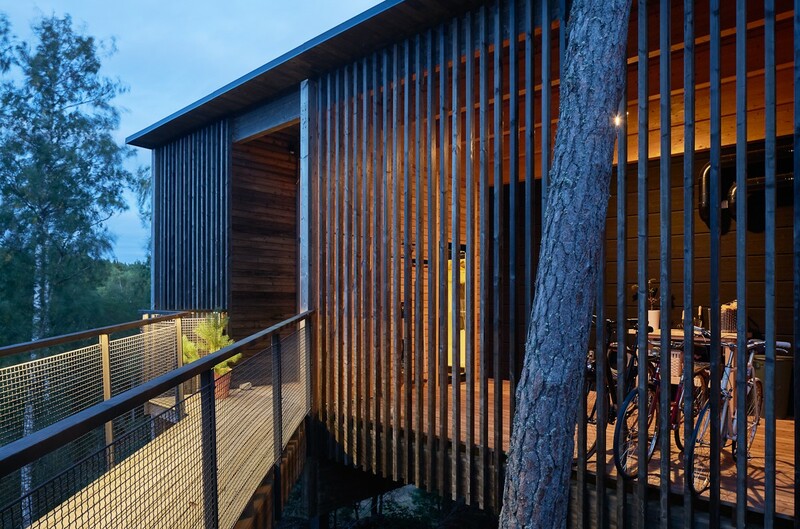 An open courtyard, a centre for outdoor activities and gatherings, and a starting point for different trails were created between the two buildings. 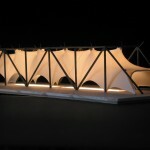 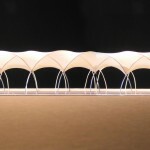 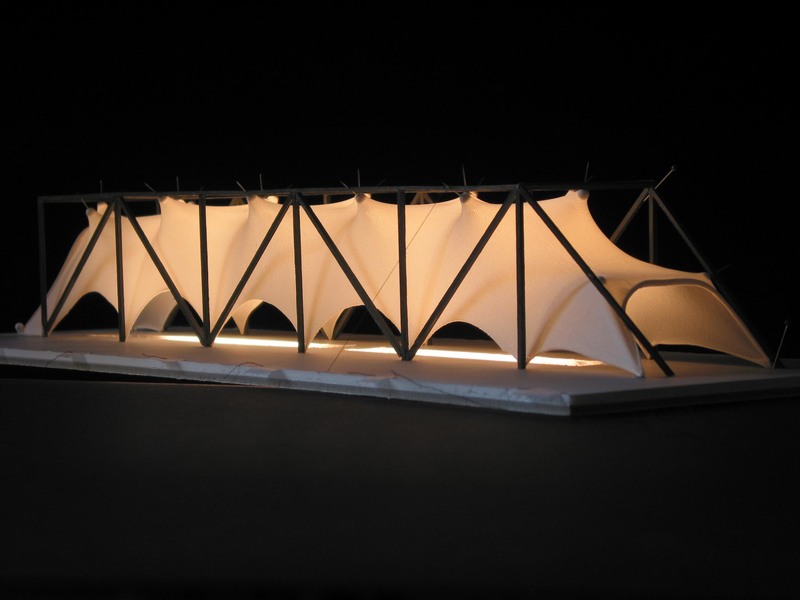 Inspiration from tent structures and simple shelters resulted in the idea of the buildings as large roofs, offering protection to both indoor and outdoor functions. 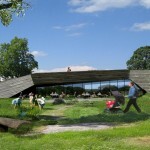 Towards the highway, the roof of the “Naturum” meets the ground to form a leaning protective wall. 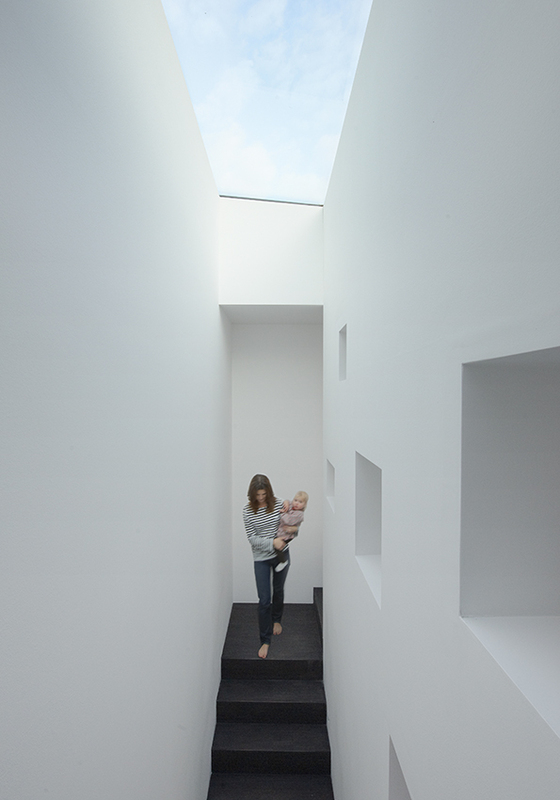 Closed volumes containing dark exhibition areas, as well as cloakrooms and utilities, help to support the roof. 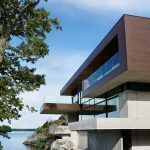 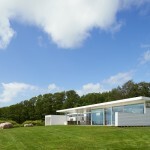 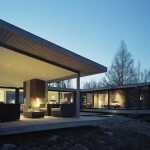 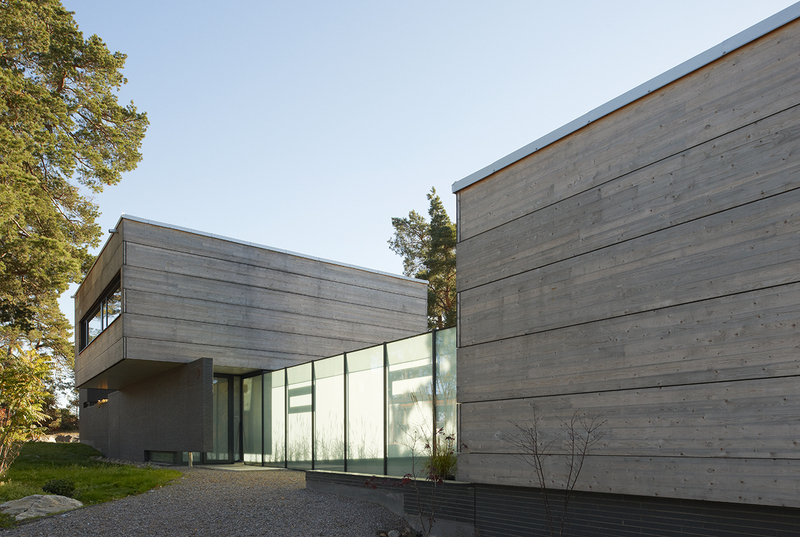 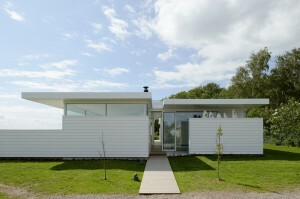 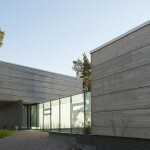 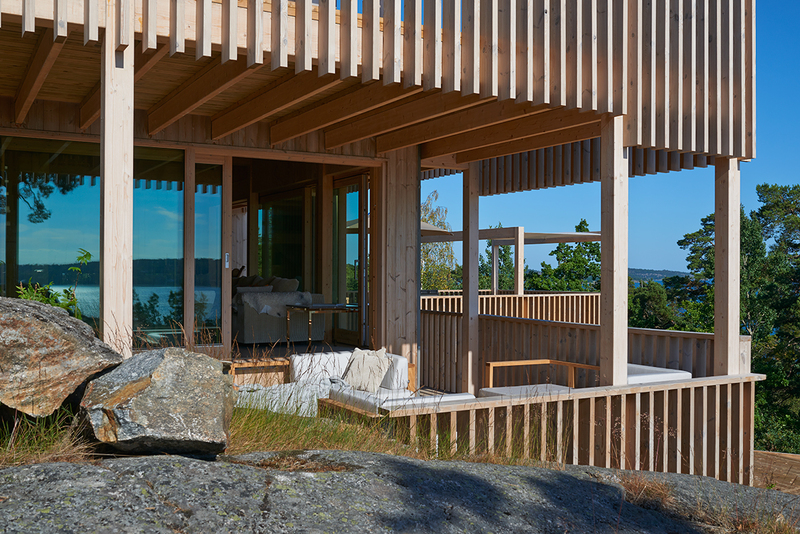 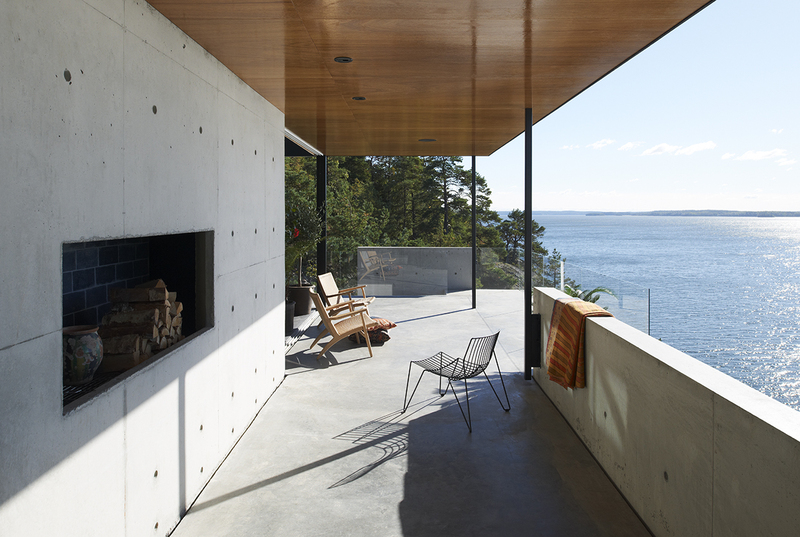 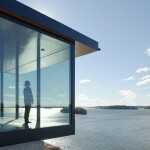 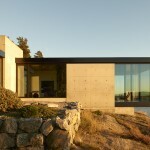 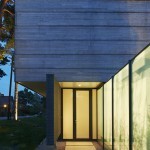 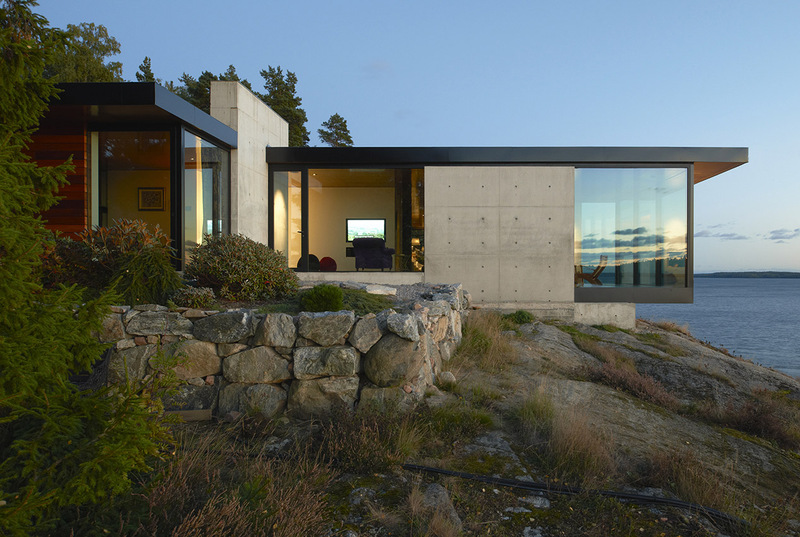 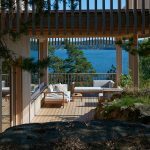 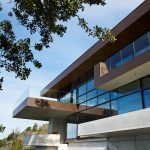 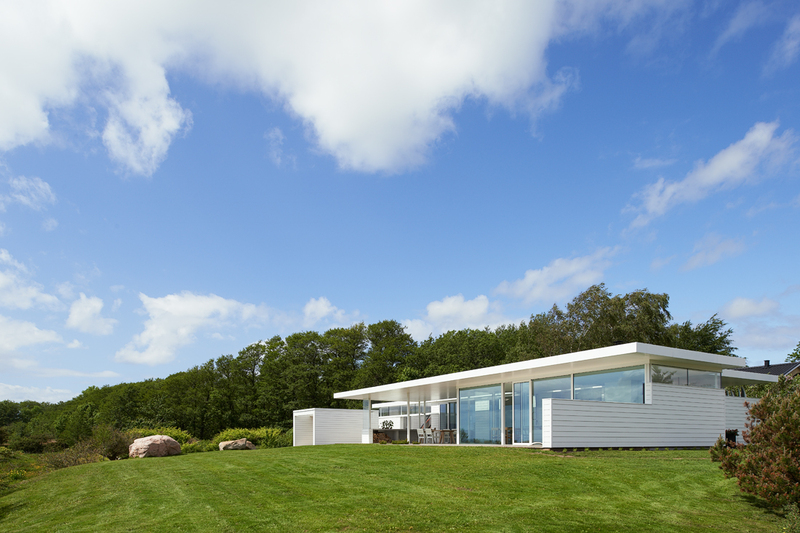 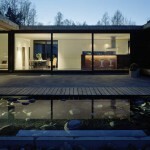 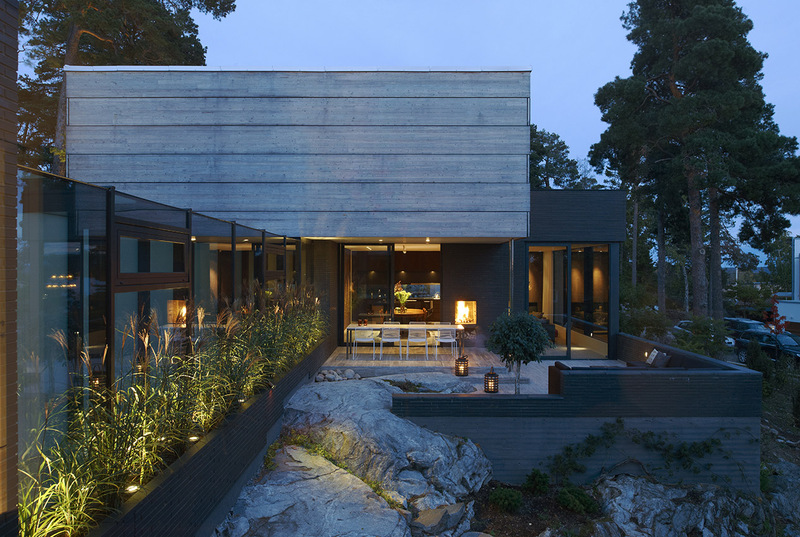 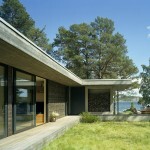 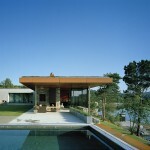 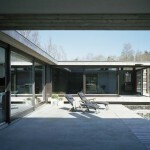 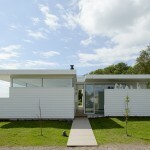 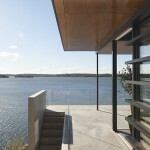 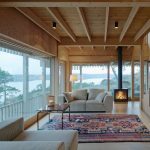 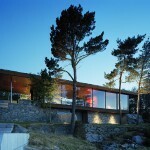 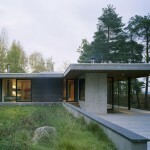 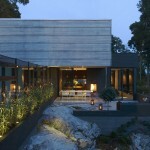 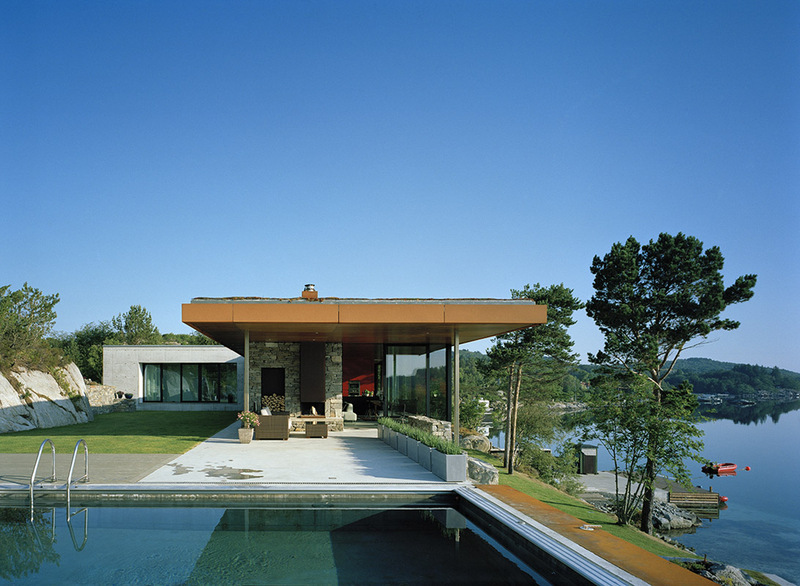 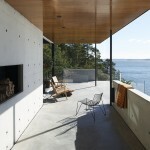 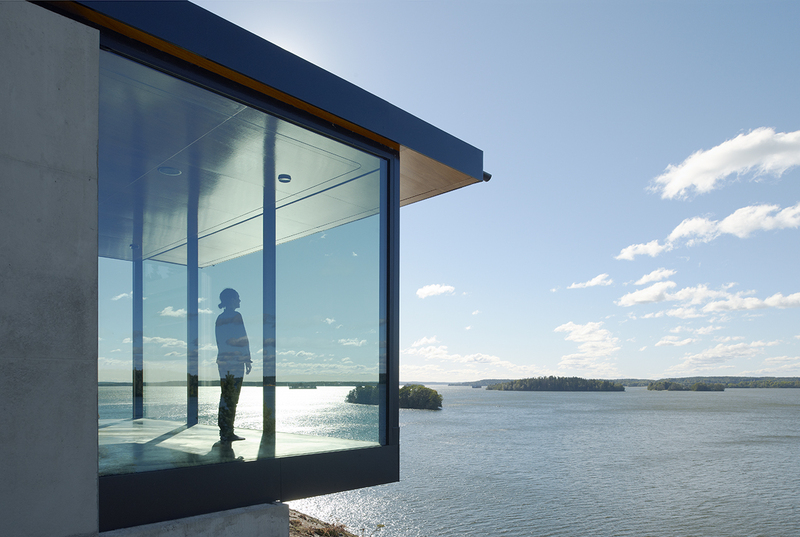 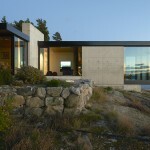 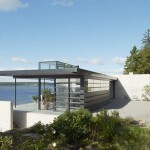 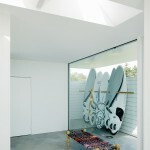 A private residence in the archipelago of tockholm situated on a beautiful site overlooking the sea. 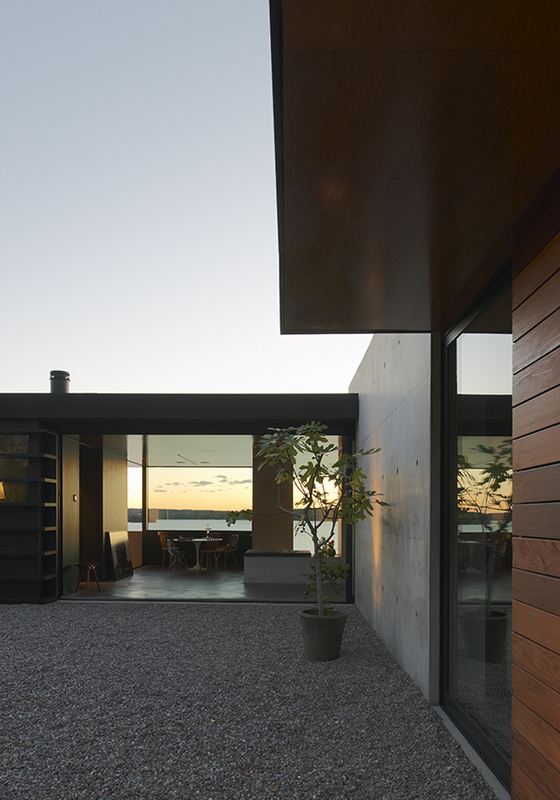 The setting is scenic but the climate is harsh. 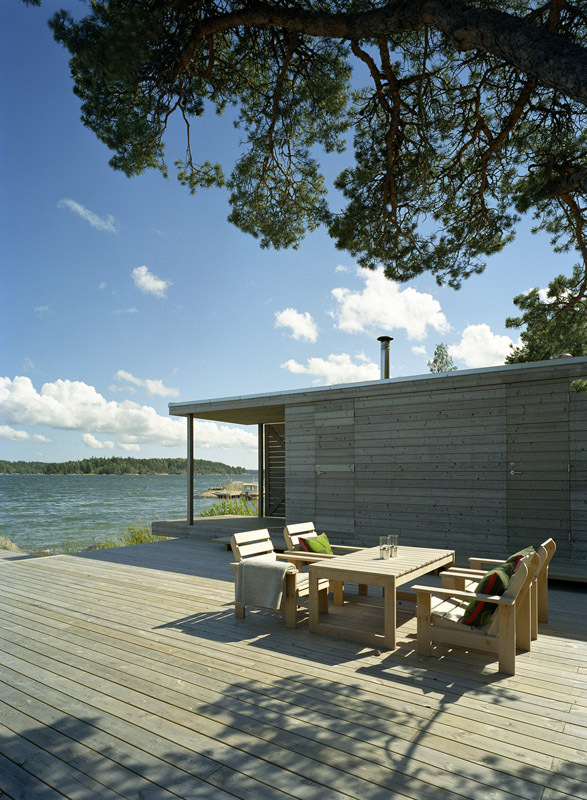 Summers are mild but short, and the wind can often be a problem in these coastal areas. 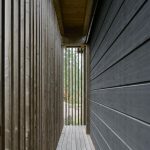 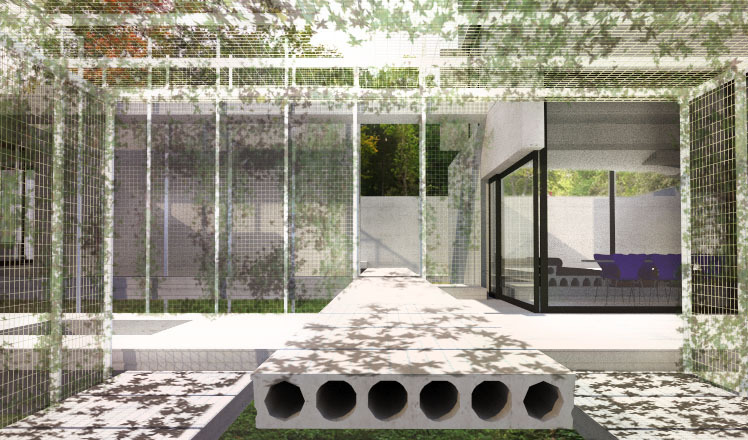 As in many of our projects, great emphasis is put on exploring the border between inside and outside – protected and exposed – building and nature. 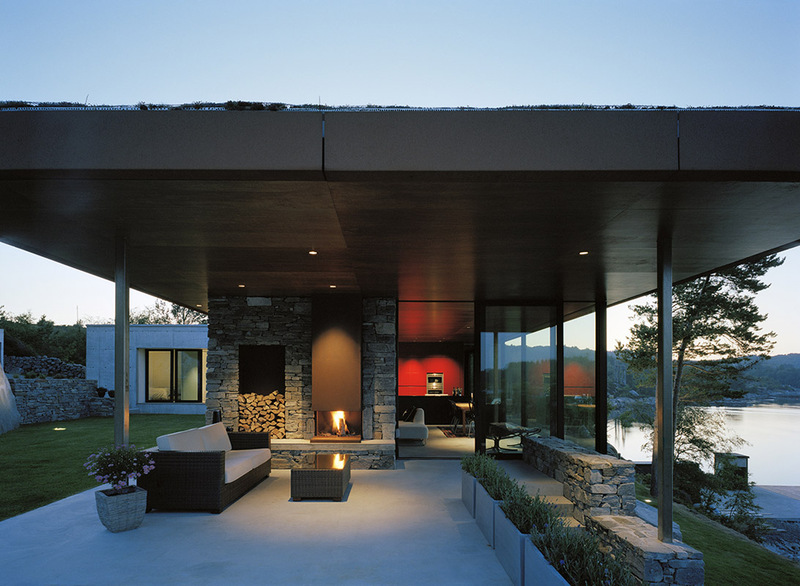 One-third of the built area consists of roof-covered outdoor areas. 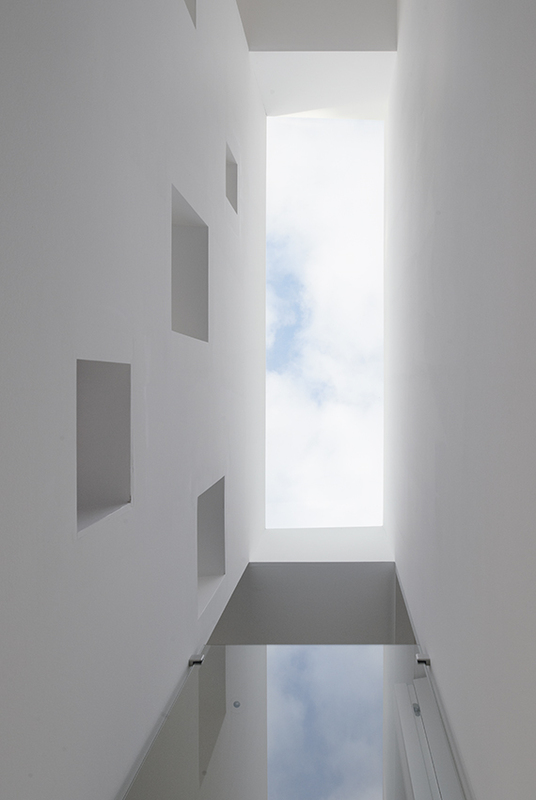 The H shape helps to create intimate and wind-protected courtyards that prolong the summer season. 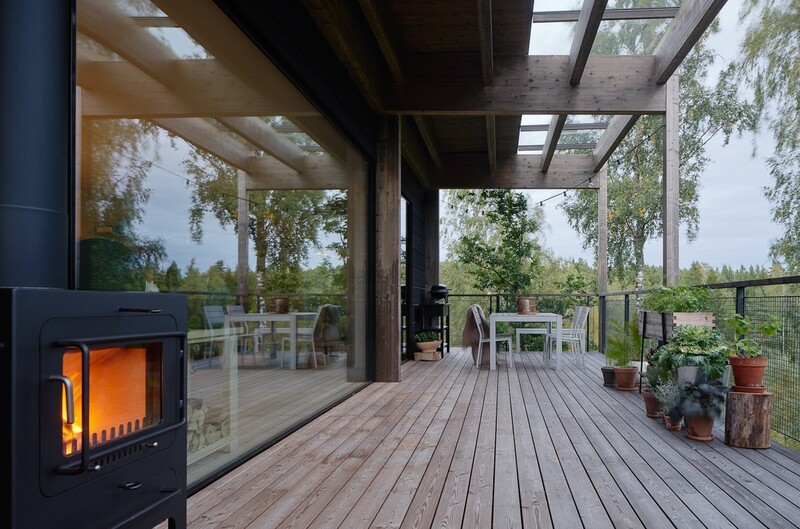 The main veranda is fully covered and an open fireplace keeps the temperature up during the spring and autumn. 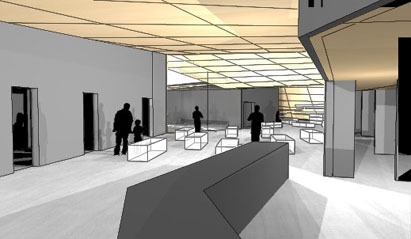 The social areas have concrete floors and are kept a bit rough. 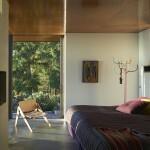 The private bedroom section is elevated from the concrete and less rough, with dark wooden floor and interiors. 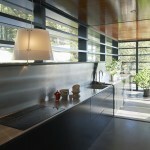 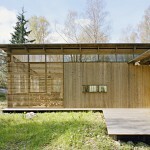 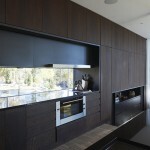 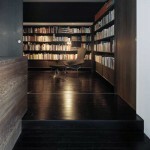 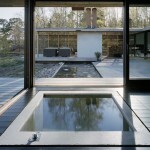 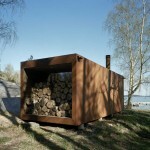 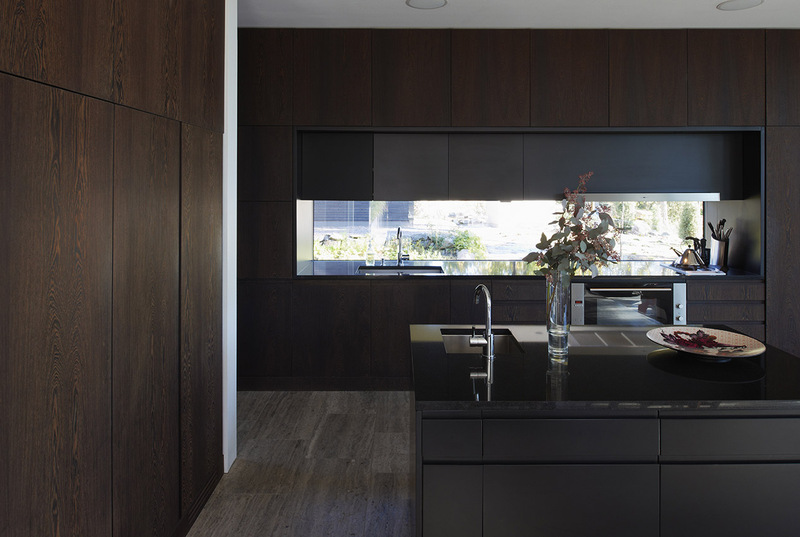 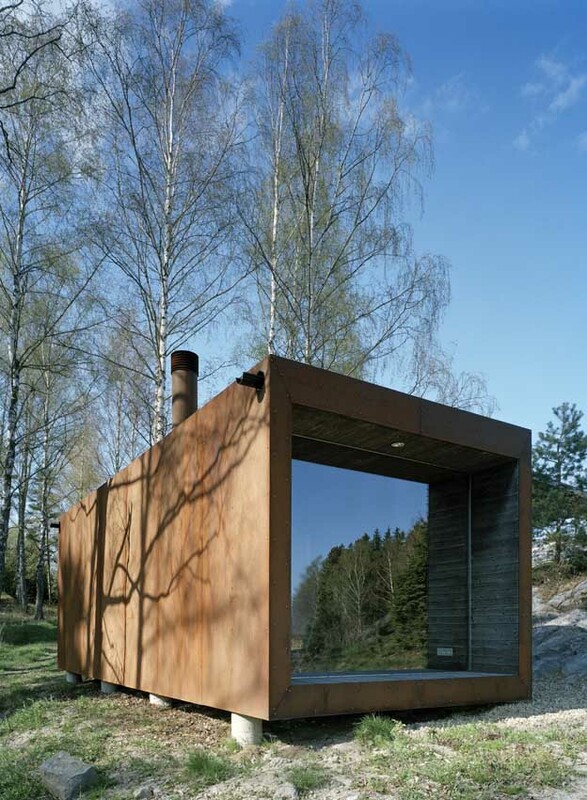 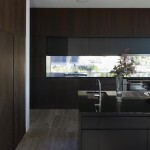 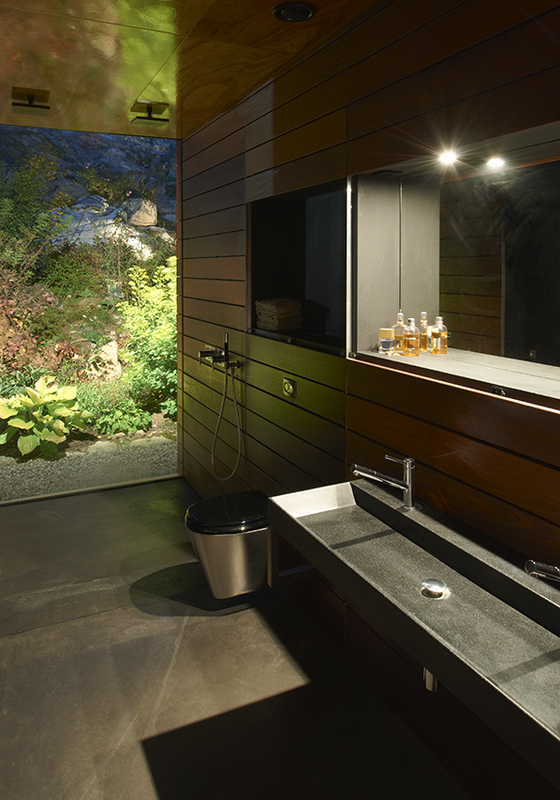 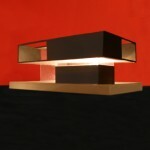 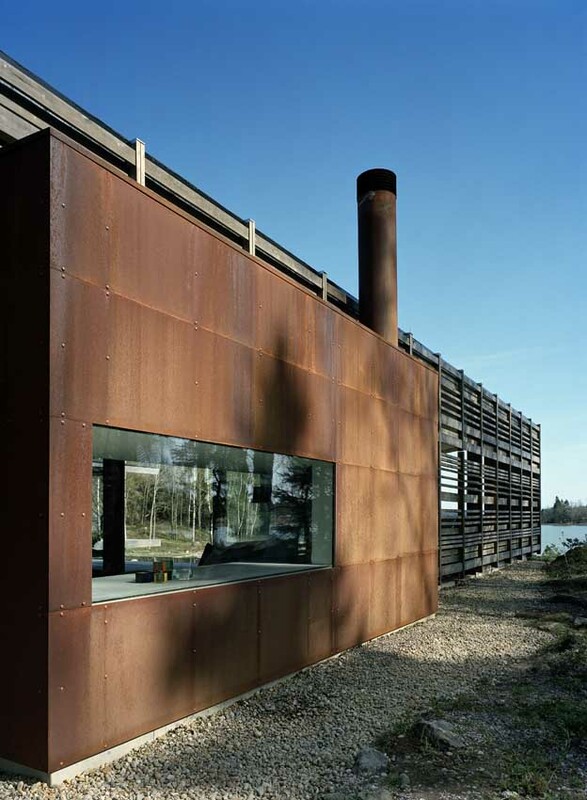 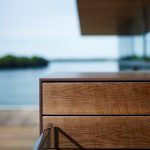 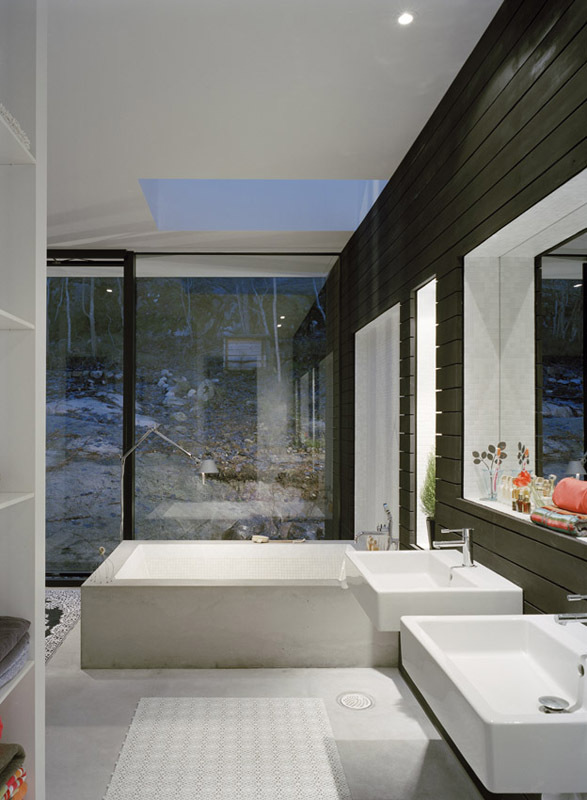 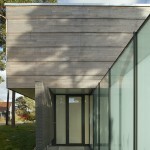 The main materials used are concrete, rusty steel, untreated pine wood, oiled wenge and water. 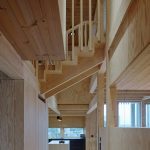 In this house, as in many of our projects, materials and their interplay with light, rather than form, gain focus and create atmosphere. 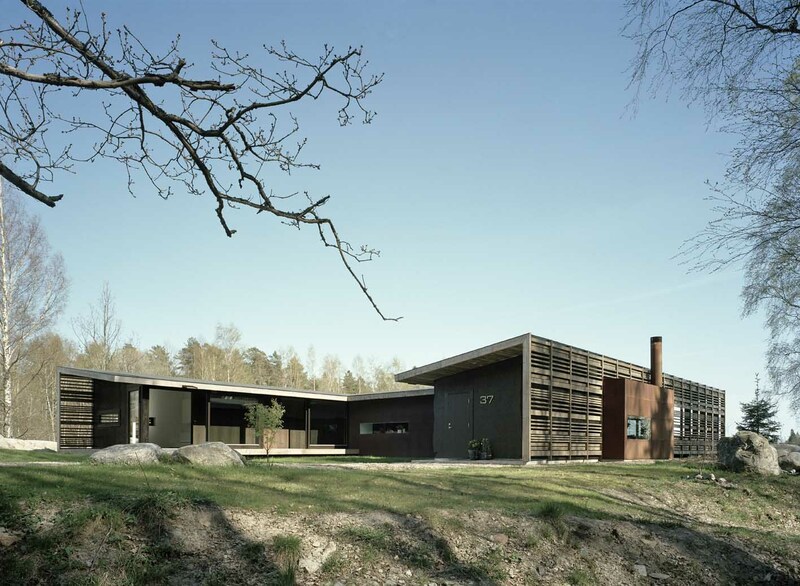 This project was developed during the ’Arkitektstudio WRB’ era. 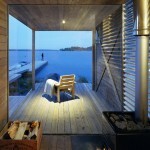 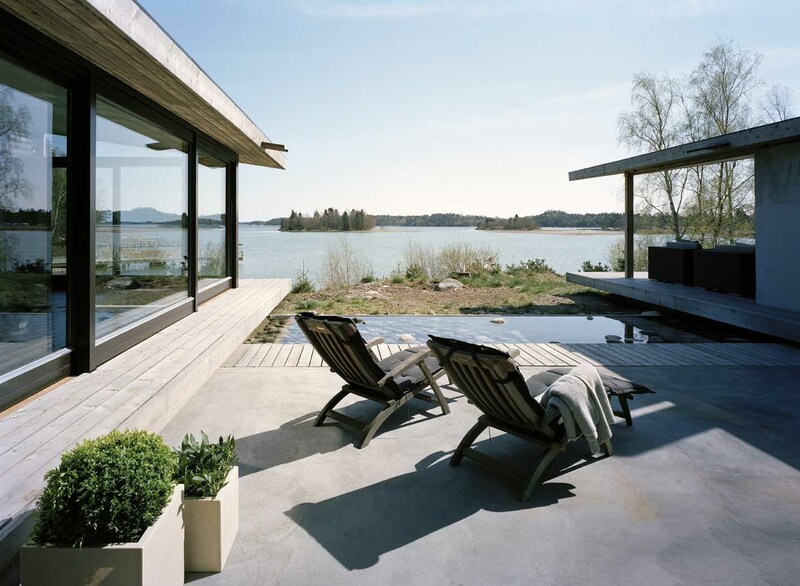 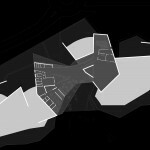 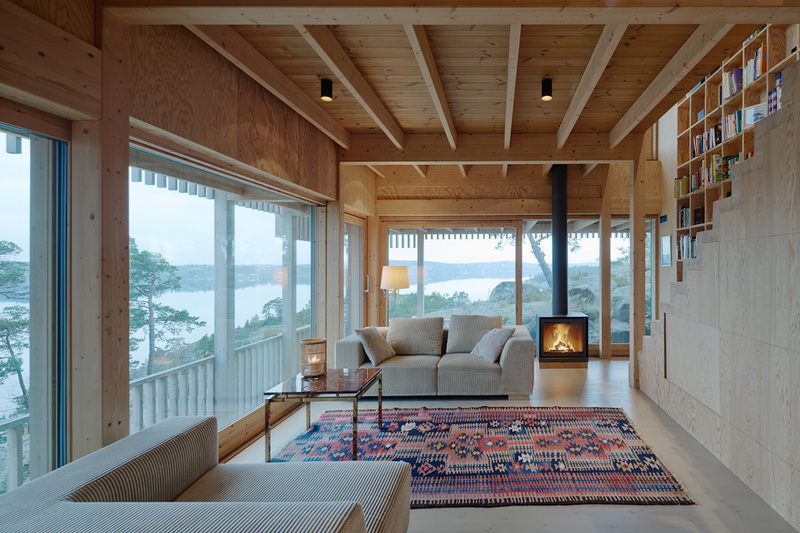 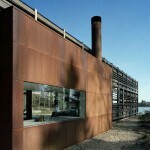 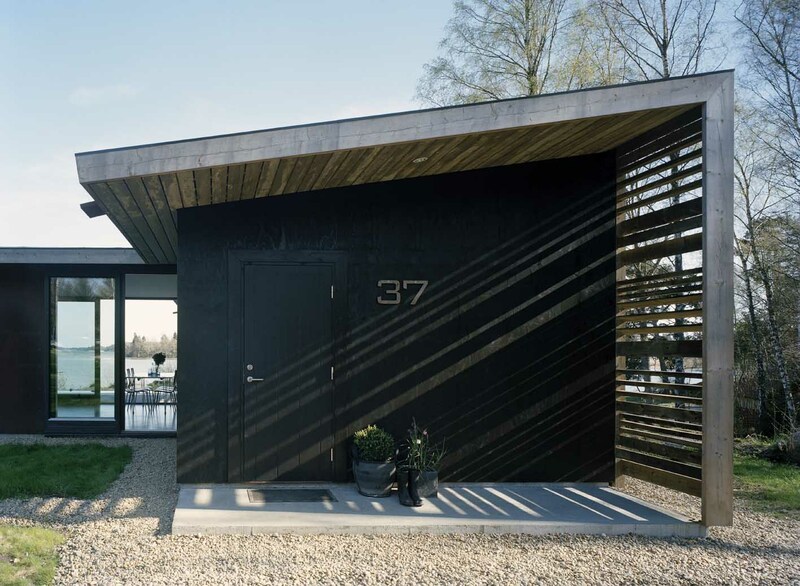 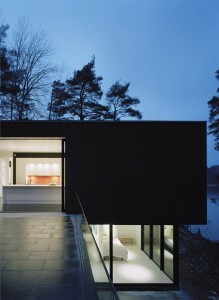 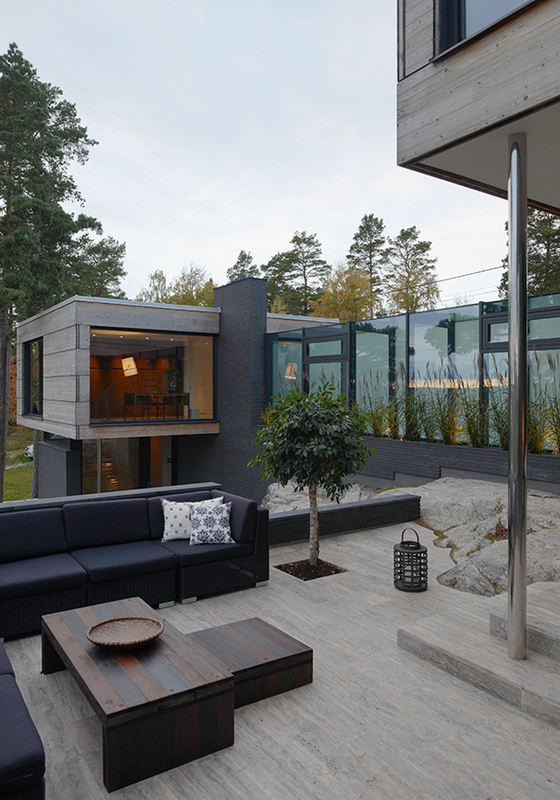 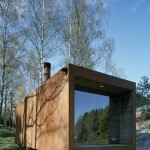 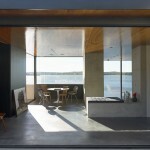 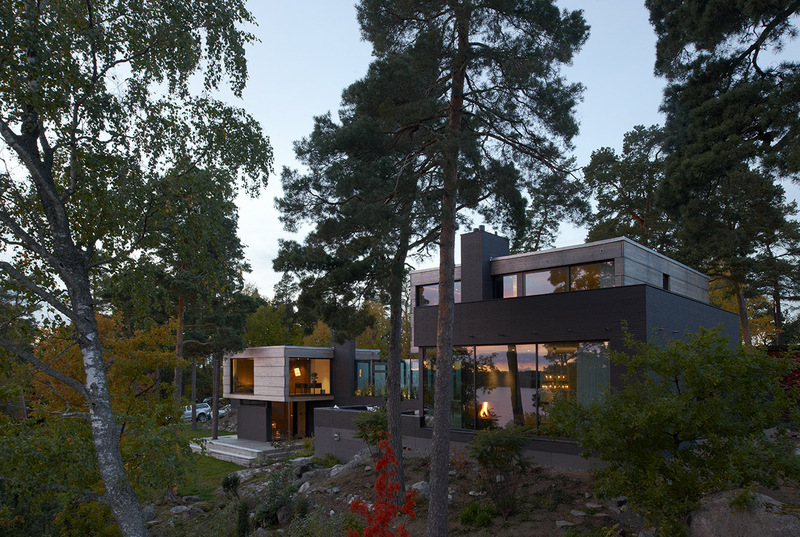 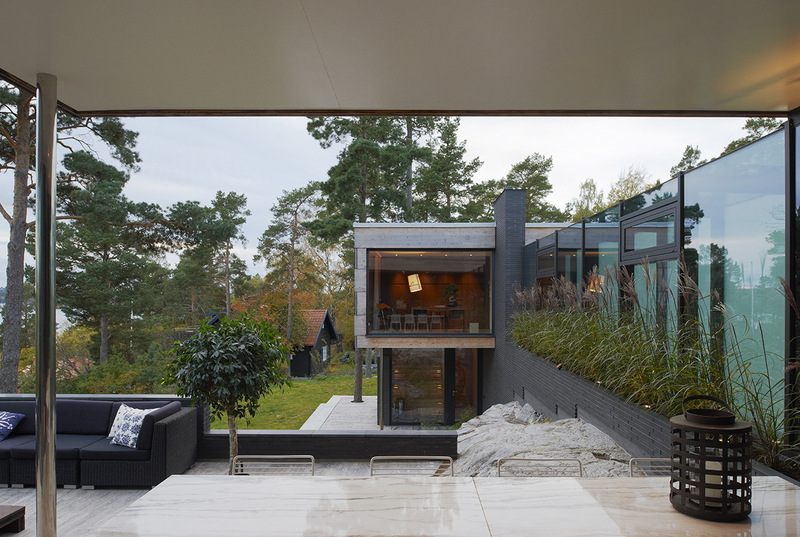 The site is a waterfront property located on an island in the archipelago of Stockholm. 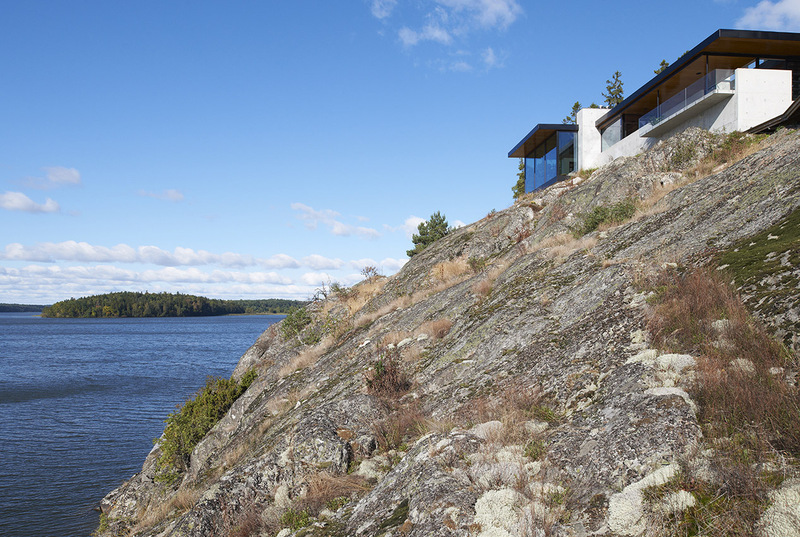 Oaks and pines living in meagre soil between sculptural rocks dominate the landscape. 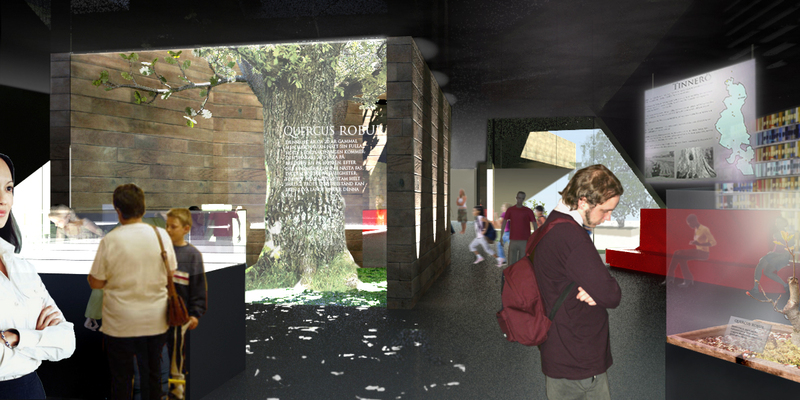 A big section of the site’s upper part is occupied by a large oak over 500 years old. 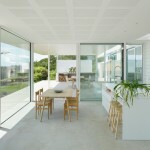 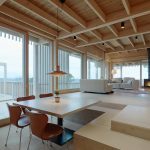 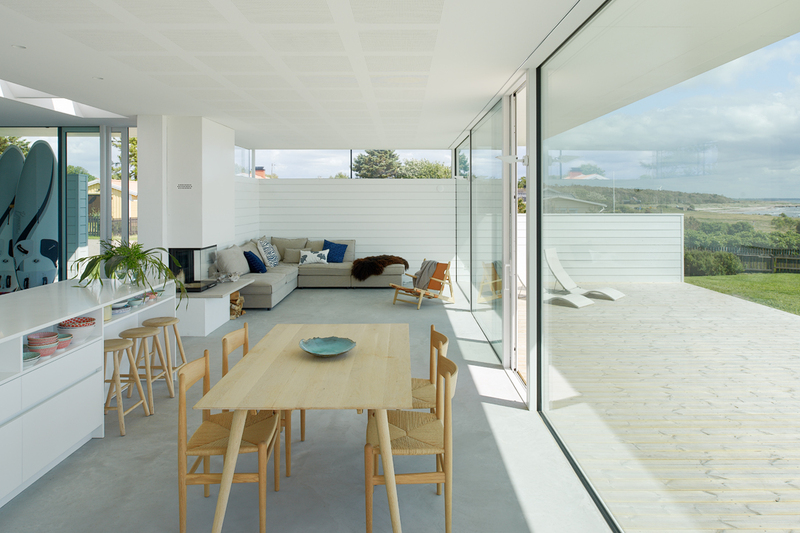 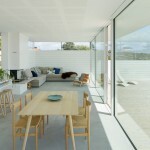 The clients, a young family with two children, wished for a house that would take full advantage of the scenic sea view without becoming a dominating feature on the coastline. 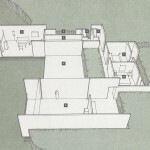 Important factors were also the demand to create a house for leisure, with a feeling of comfort and relaxation; a house to socialise in; a house to feel pampered by, as opposed to one to take care of. 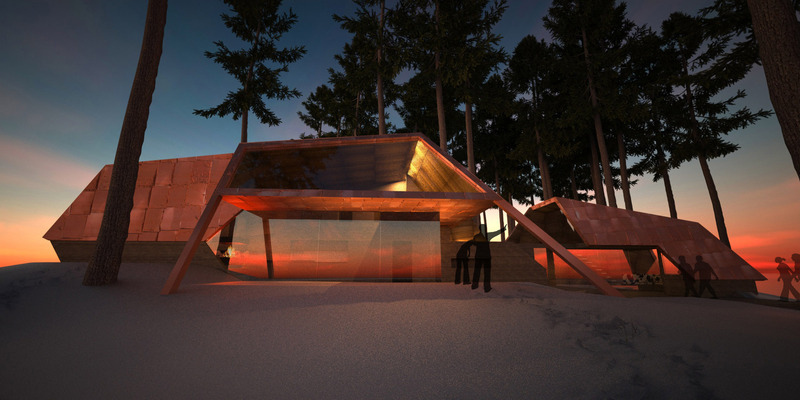 Our concept for this project is a building that sits slightly back and elevated from the waterfront, half-hidden behind the knotty pine trees. 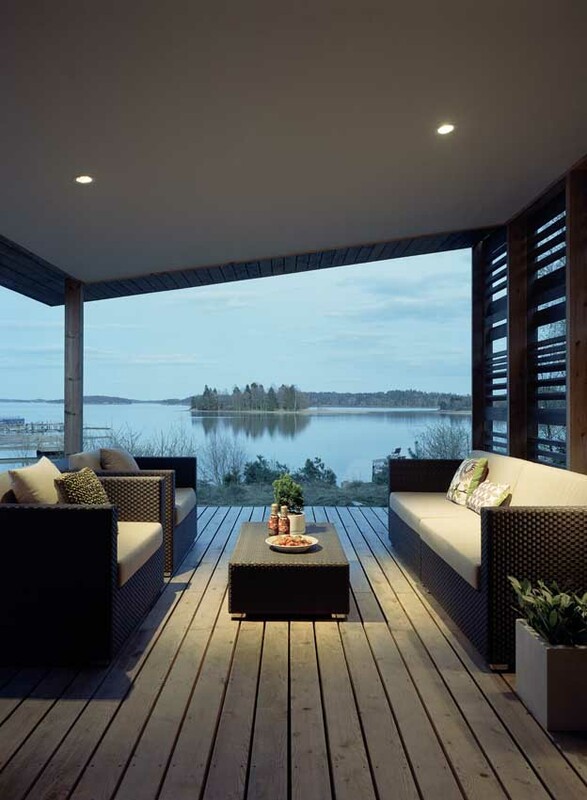 Facing the sea is a large area for socialising. 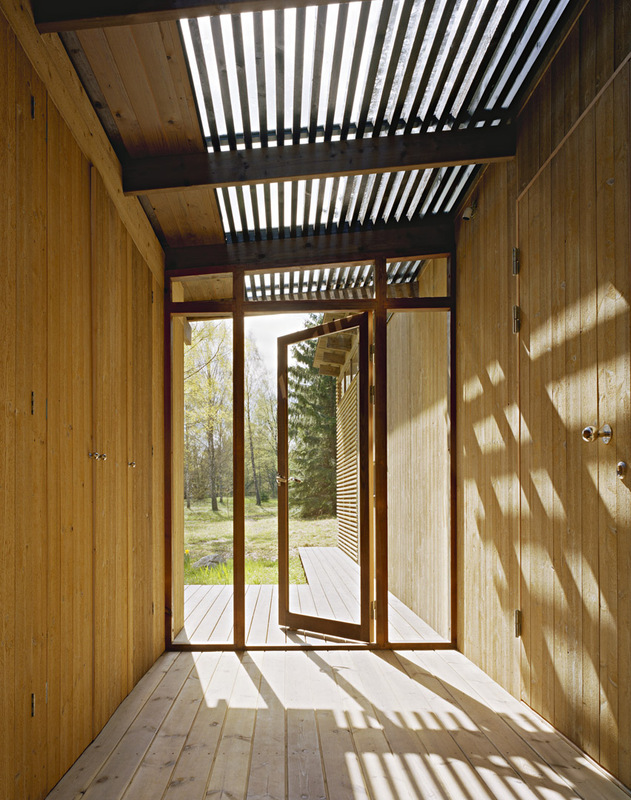 A floor, a roof and a free-standing core for utilities make up this part of the building. 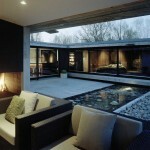 It has an indoor part and an outdoor part, separated only by a sliding glass wall. 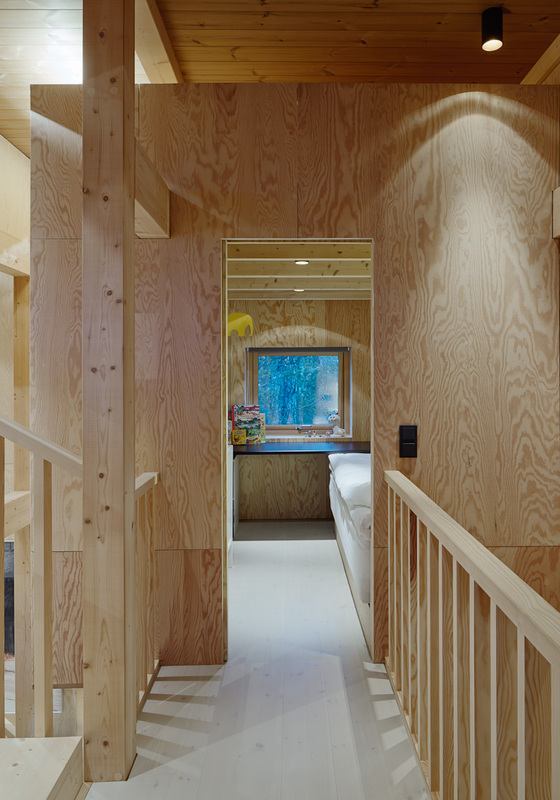 The bedrooms, storage and bathroom are gathered in a more closed structure behind the core. 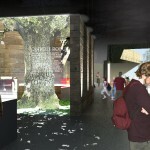 They face a secluded courtyard framed by rock formations and the old oak tree. 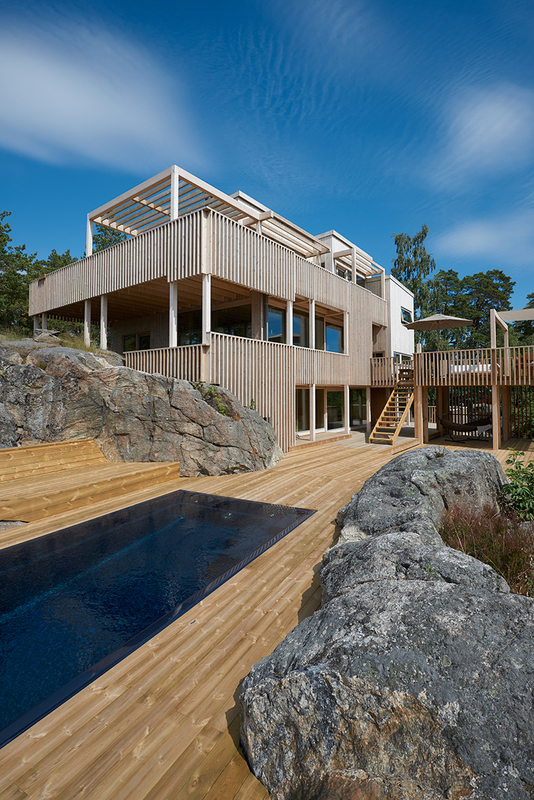 Location: Island of Storholmen, close to downtown Stockholm. 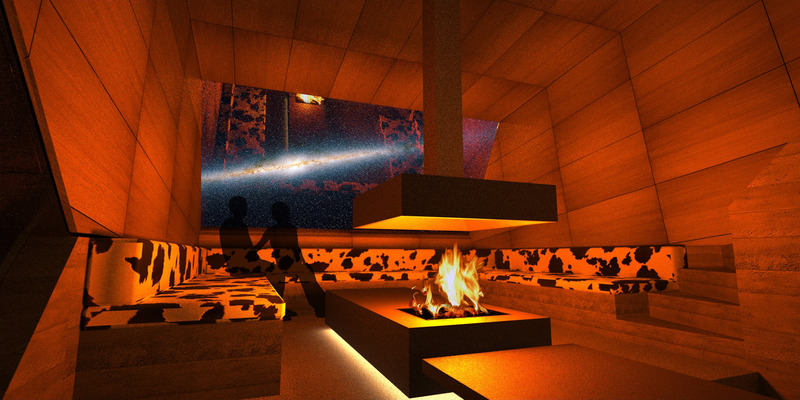 Description: “What would Goldfinger have done?” we asked ourselves, in response to a client’s request for a retro-futuristic retreat. 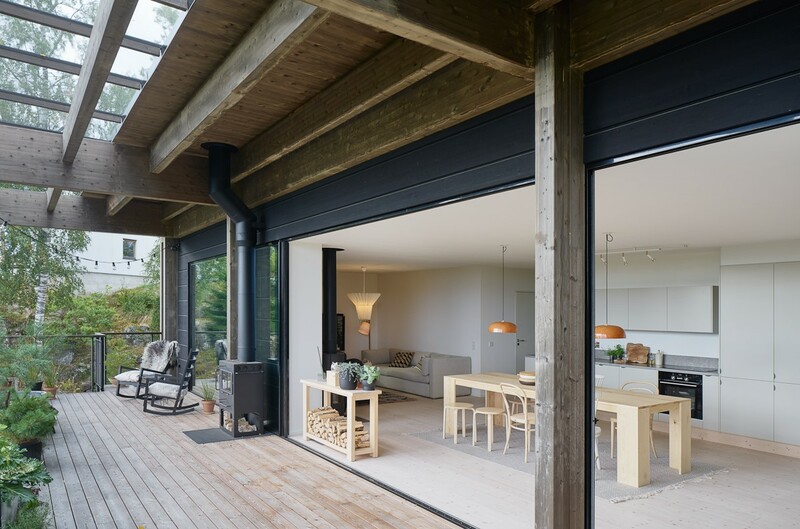 A generous place to socialise with family and throw big parties for friends was to be combined with strict building regulations prescribing traditional pitched-roof houses with a maximum building size of 60 + 30 m2. 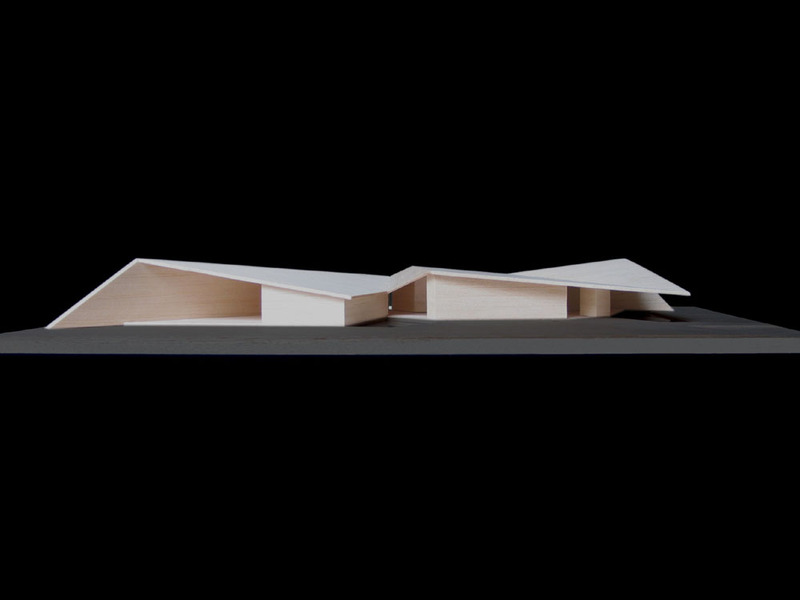 Goldfinger would probably have changed the rules, but we decided to try to find a solution with the pitched roof as a starting point. 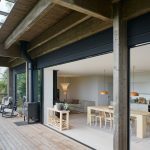 A large kitchen area, which expands out onto the terrace as folding doors are opened, functions as the centre for daytime activities. 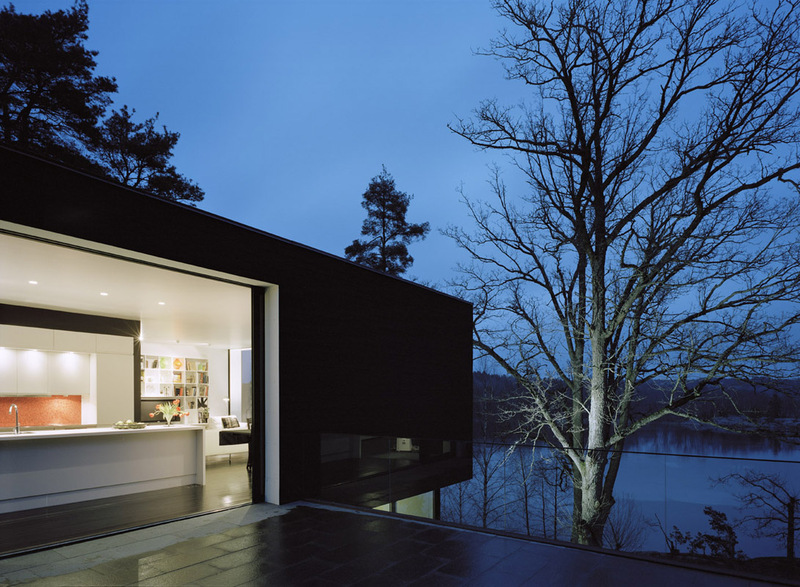 The overhanging roof provides extra protection during bad weather. 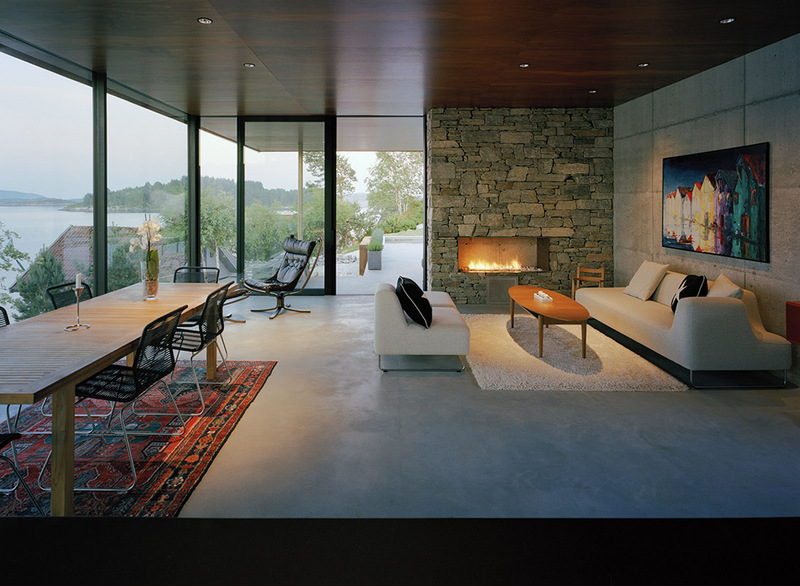 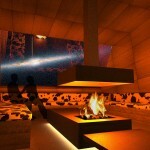 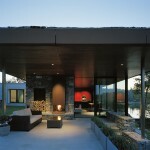 At night-time, an elevated fixed sofa around an open indoor fireplace is the main focus. 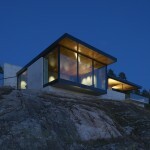 A large leaning window presents a panoramic view of the sea and the night sky. 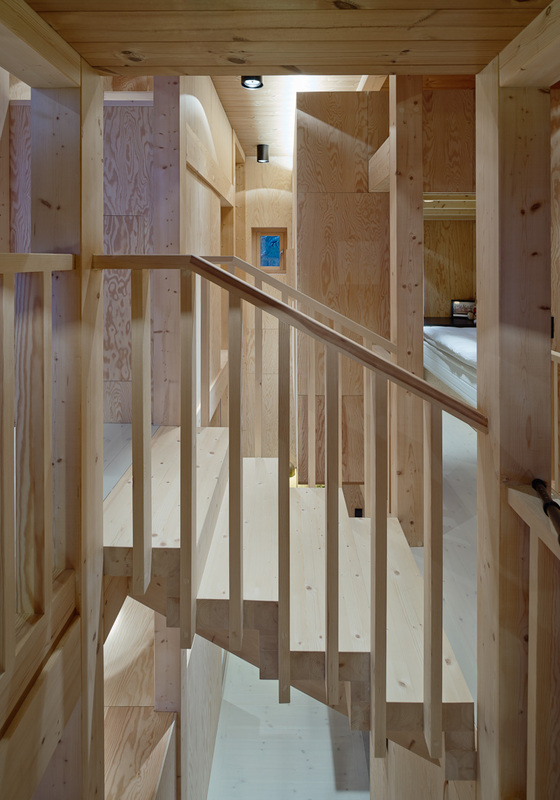 The sofa and the loft above the kitchen area serve as extra sleeping accommodation for overnight guests. 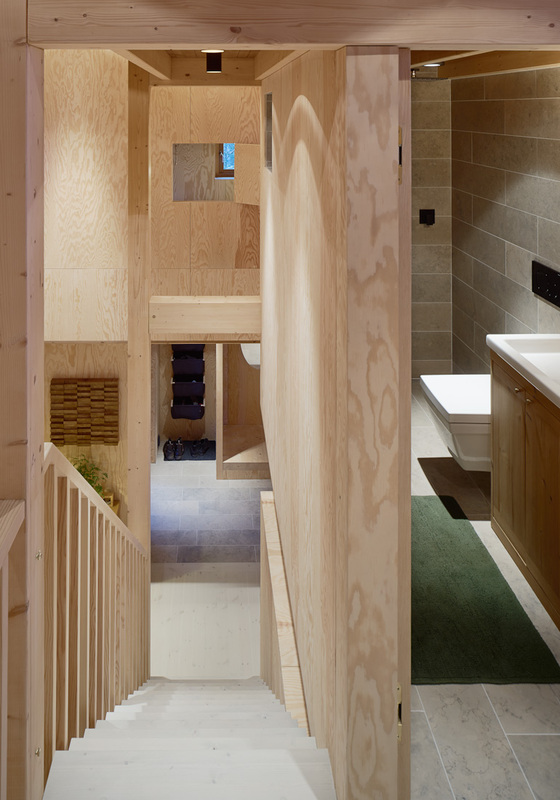 Storage, sleeping and washing functions are packed tightly together to leave maximum space for socialising. 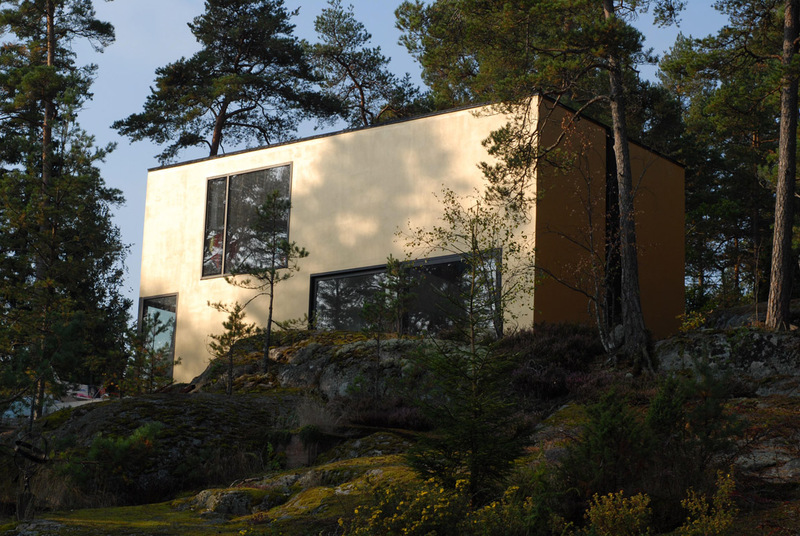 In the autumn of 2002, FSV, the Swedish National Property Board, organised a competition in two stages open to architects under 40. 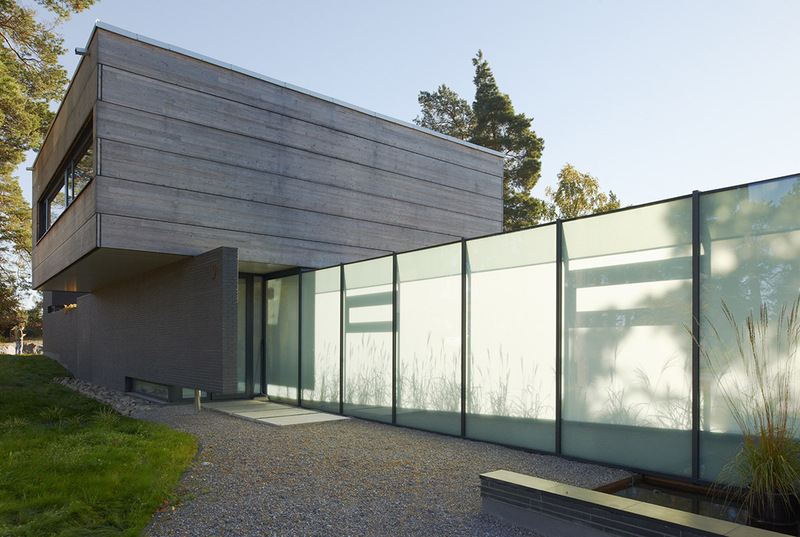 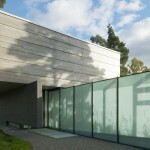 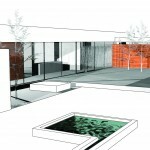 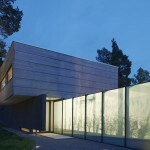 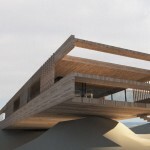 The task was to design a new residence for the Swedish ambassador in Chile. 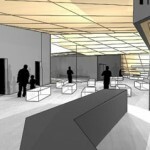 Ninety-nine offices applied to participate. 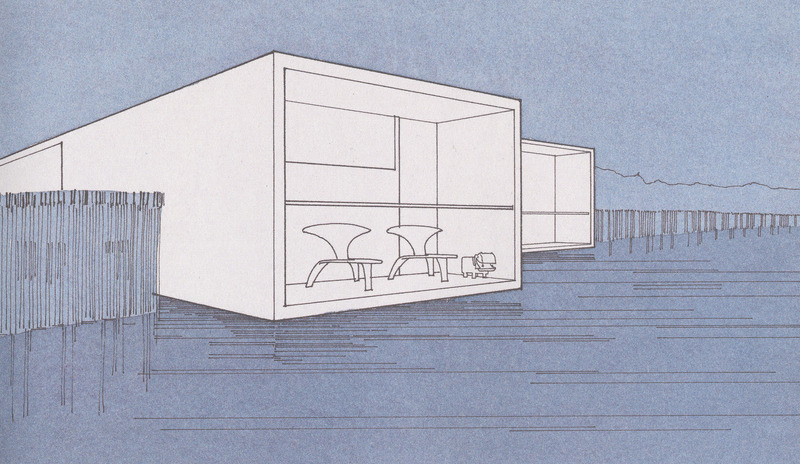 Ten offices were chosen to do a first sketch. 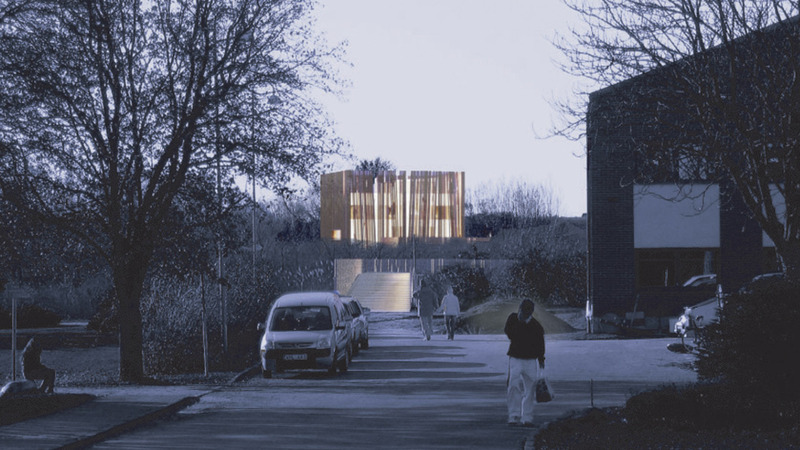 As a second phase, three offices were chosen to join FSV on a trip to the site to discuss conditions of programme and site on location and to refine their proposals. 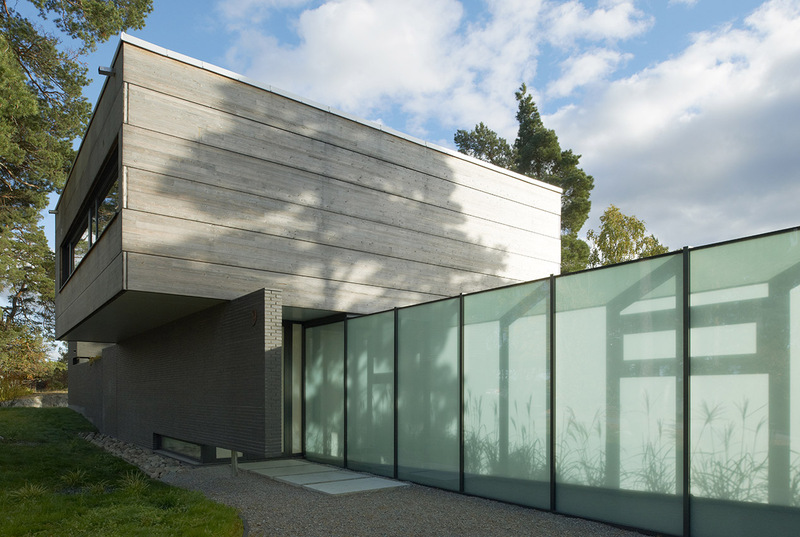 The programme for the residence consisted of three parts: the private housing for the ambassador, the representation areas for the embassy and the service section for the staff. 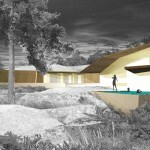 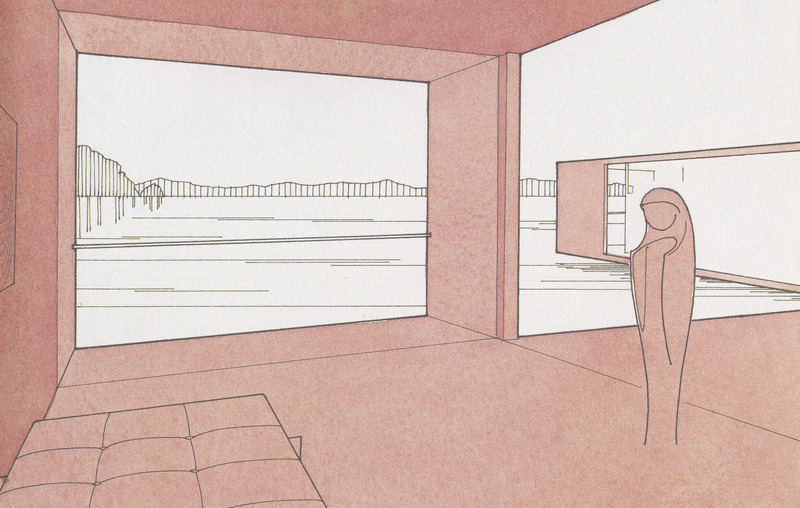 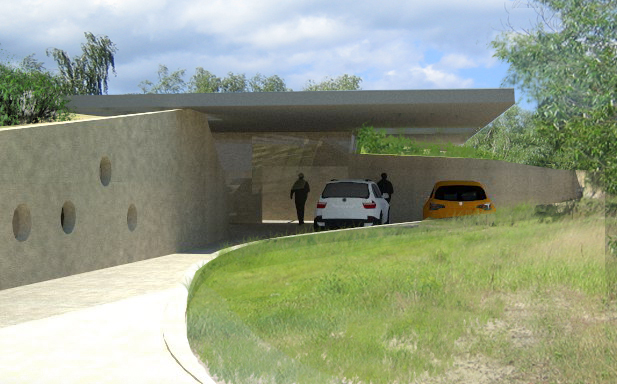 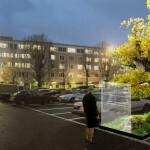 We proposed a one-story building that integrates with the landscape. 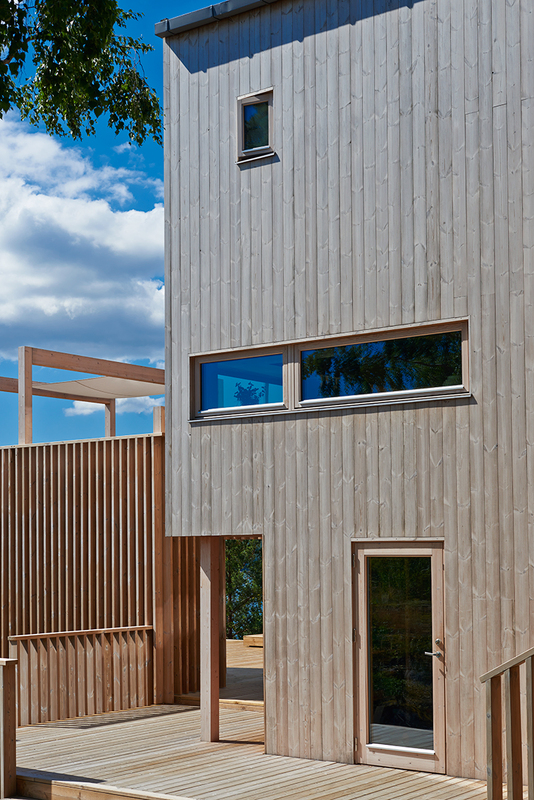 The shape of the building helps to form private yards for the different parts of the programme. 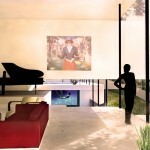 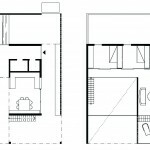 Each part is given its own character to nuance the movement through the residence. 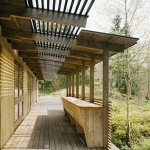 The vegetation is integrated into the building and plays an important role in creating atmosphere as well as blocking the problematic sun from the west. 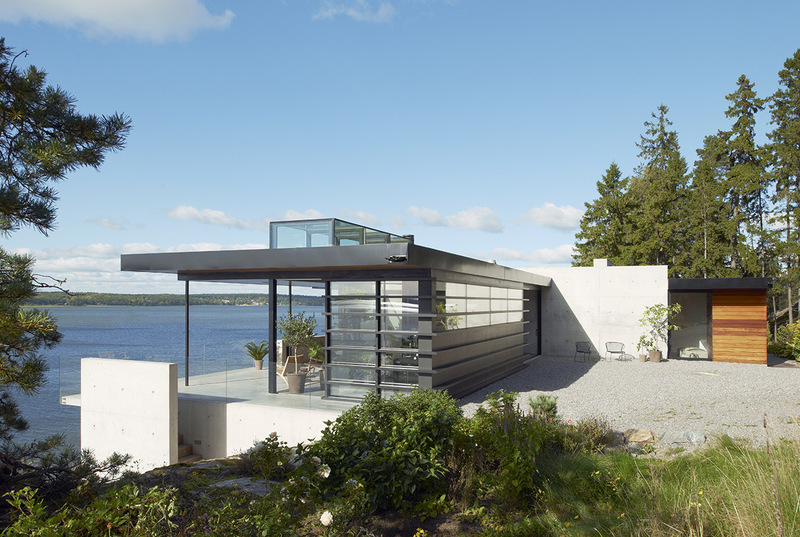 Location: Almost anywhere on water near the coast. 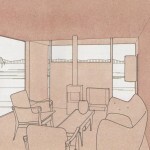 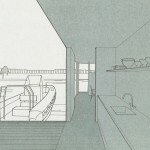 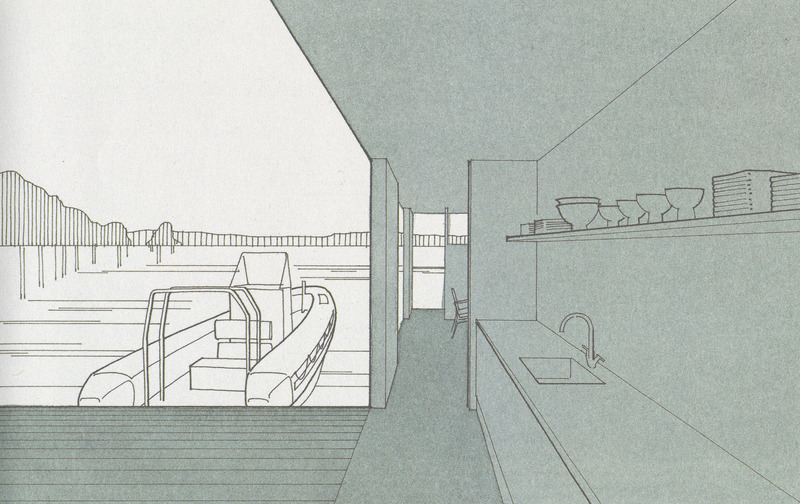 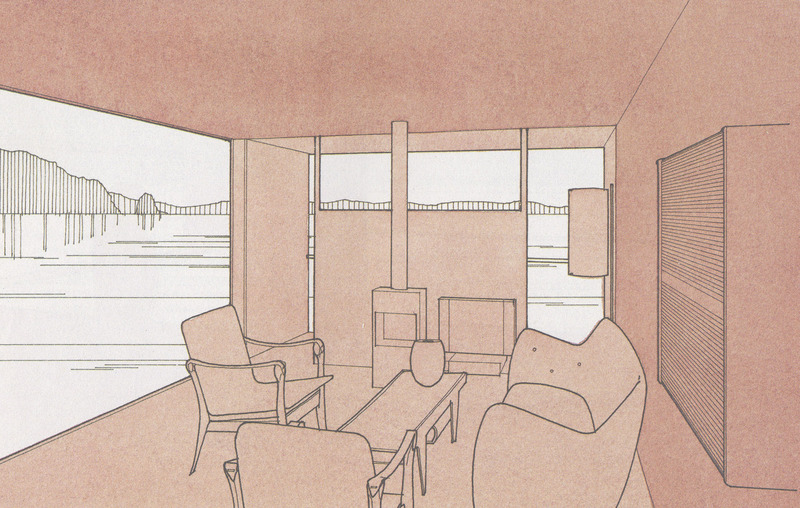 This sketch was done as a concept sketch for floating villas in Ryssviken in central Stockholm, where a village of floating houses was planned. 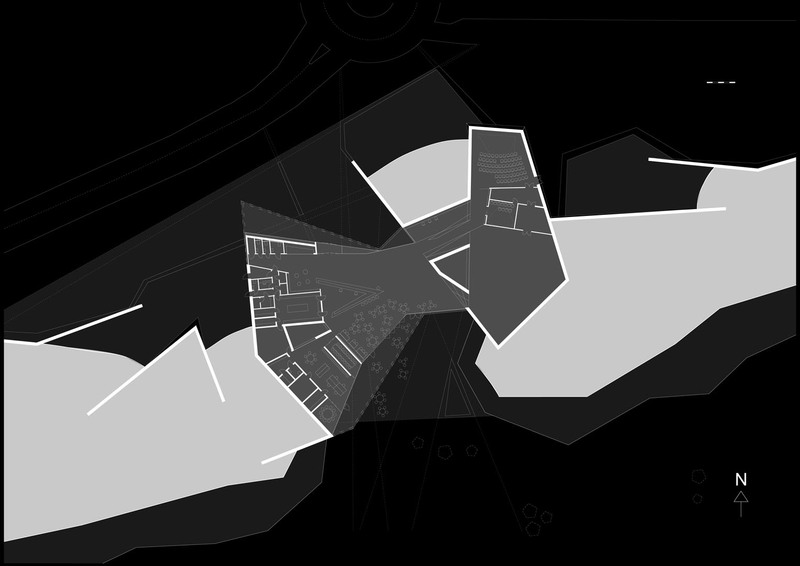 Since we had no control over where these houses were to be placed and in what relationship to each other we decided to design a building that could apply and adjust to various situations. 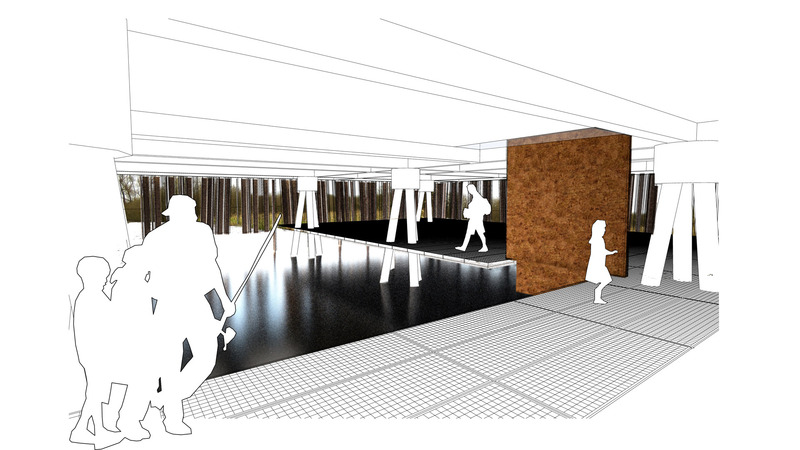 The floating platforms were fixed in measure and we suggested a smaller building mass in water level to free outdoor space. 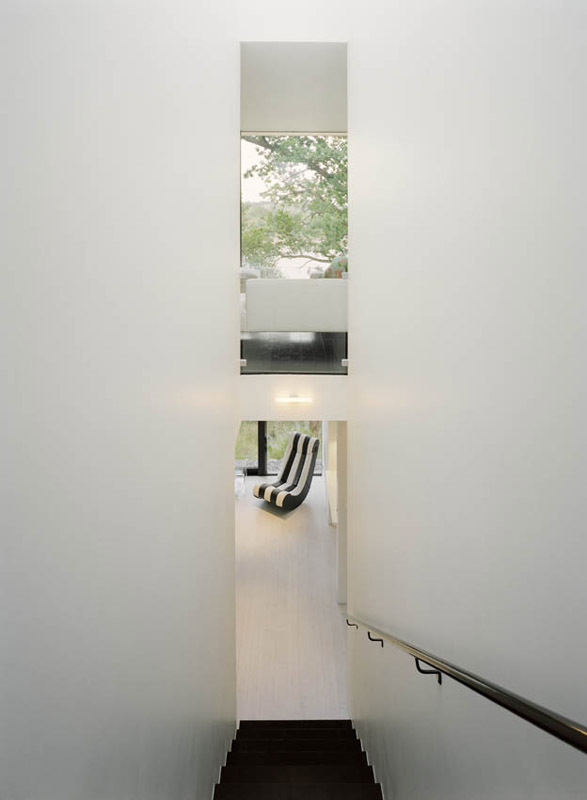 On the upper floor private rooms were given private verandas that could be sealed off with sliding doors to protect from wind or raster walls to give privacy from neighbors. 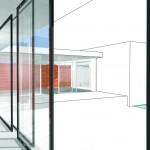 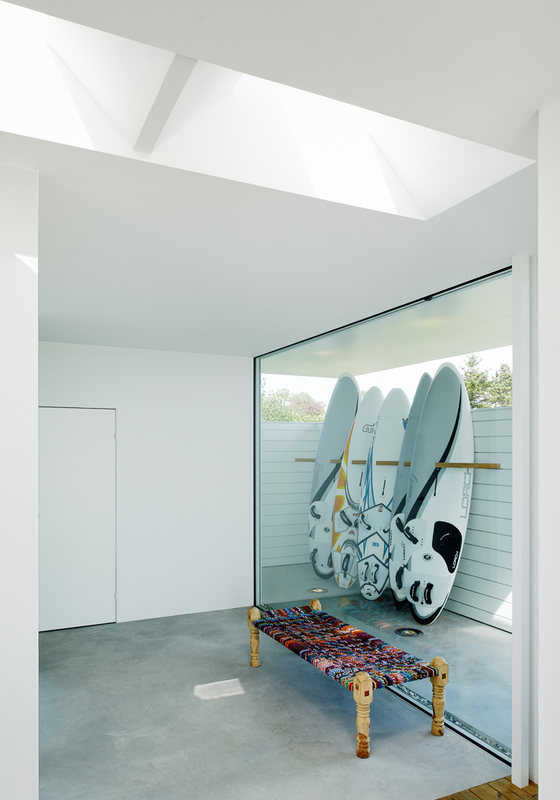 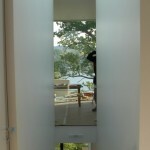 The same system of exterior sliding doors was used to open or close the glassed facades of the bedrooms. 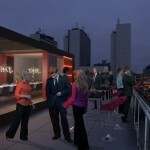 On the very top was an open lookout terrace with a fixed barbeque setup. 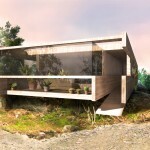 The private retreat is a concept house designed for Wallpaper Magazine. 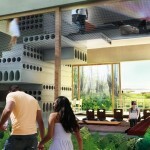 The idea was to design a place far away from the hectic urban city – a small world of your own – a world to be isolated in. 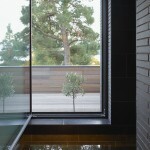 For this project, we had no particular client or location in mind. 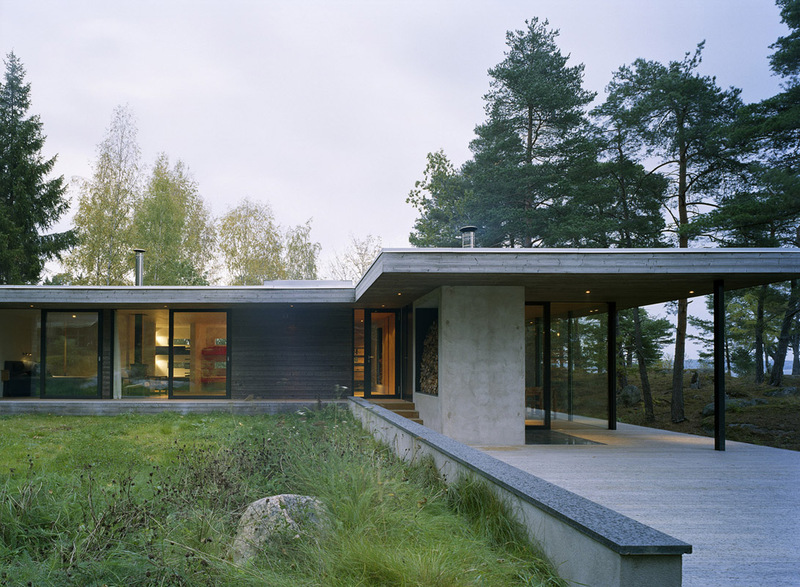 We found the seclusion we were looking for in the extensive weed and marsh areas one finds in many water systems inSweden and elsewhere. 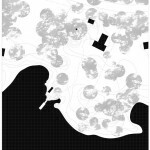 These areas often stand unused and are thought of as having little or no value to the landowners. 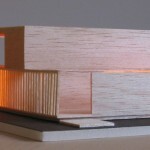 We wanted to show that they could be transformed into housing properties with great architectural value. 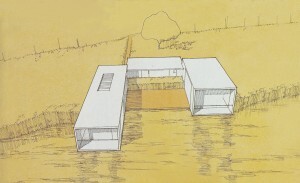 The retreat is a complex made up of three volumes connected by decks. 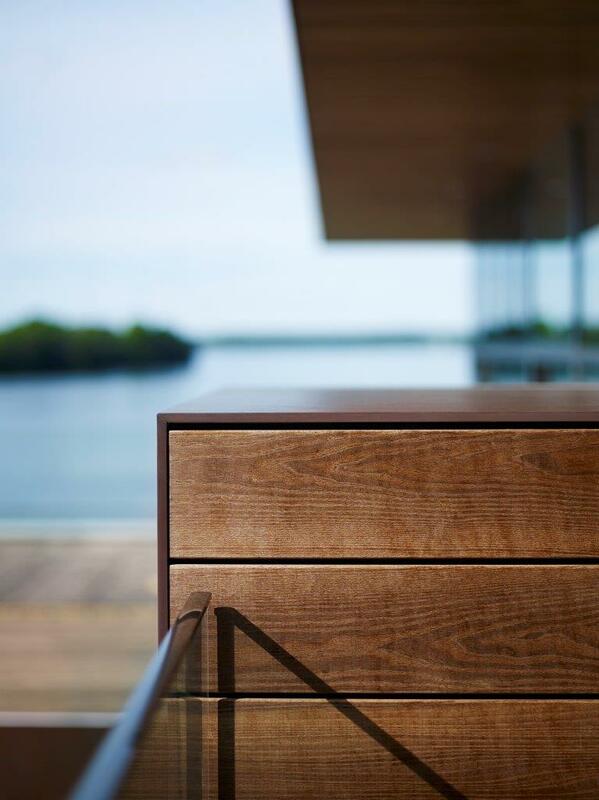 One volume stands for creating, one for resting, and one for eating, washing and dressing. 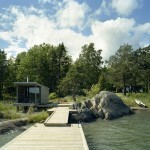 The latter includes a generous sauna and pool section facing only weeds. 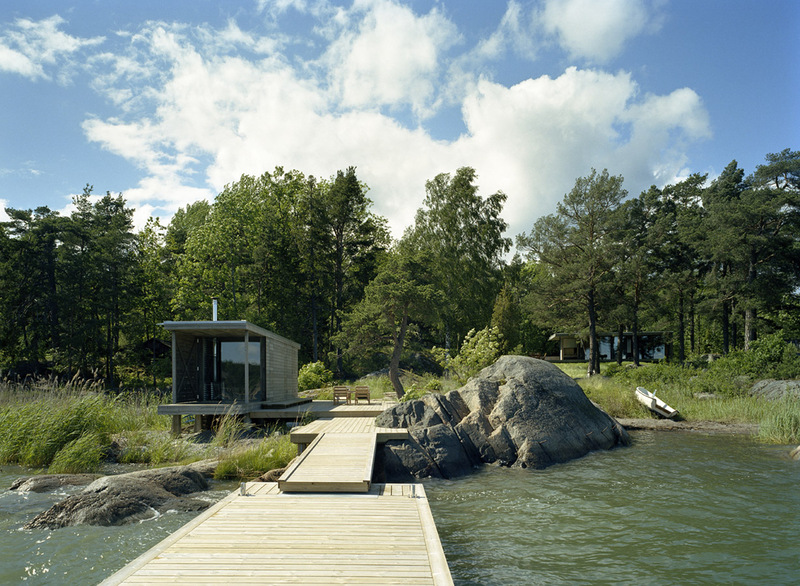 The volume for resting is also hidden in weeds to create privacy, while the other two volumes meet open water. 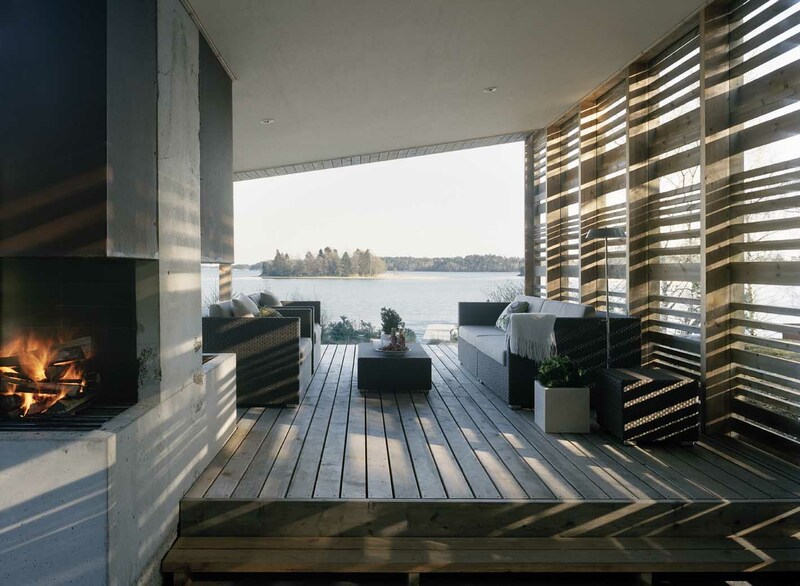 They connect with the outdoor deck to form one giant open living area when the folding walls are open. 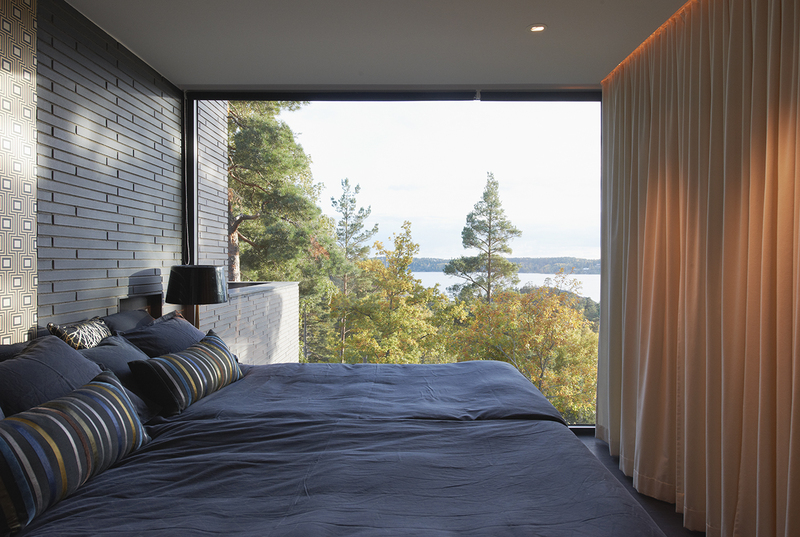 This automatically gives the resting volume an extra level of privacy. 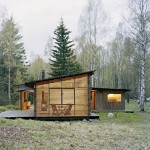 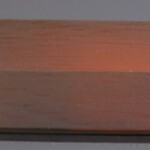 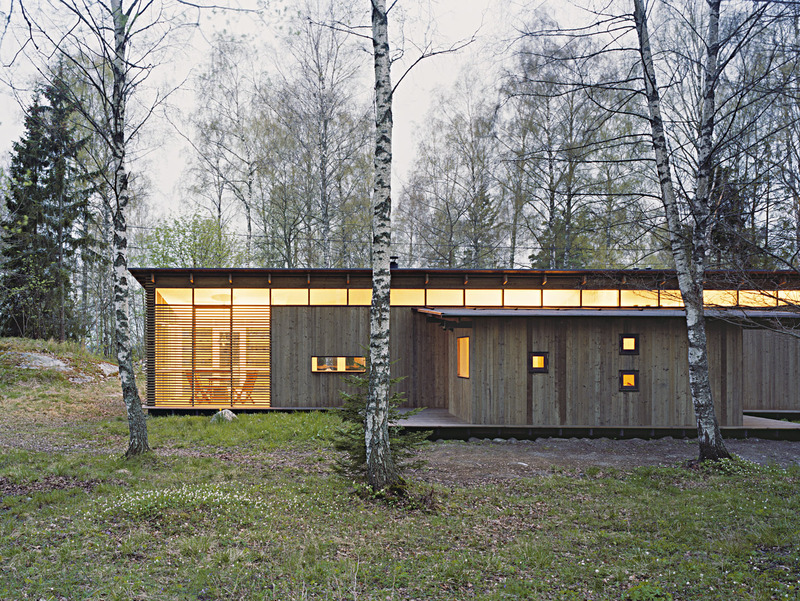 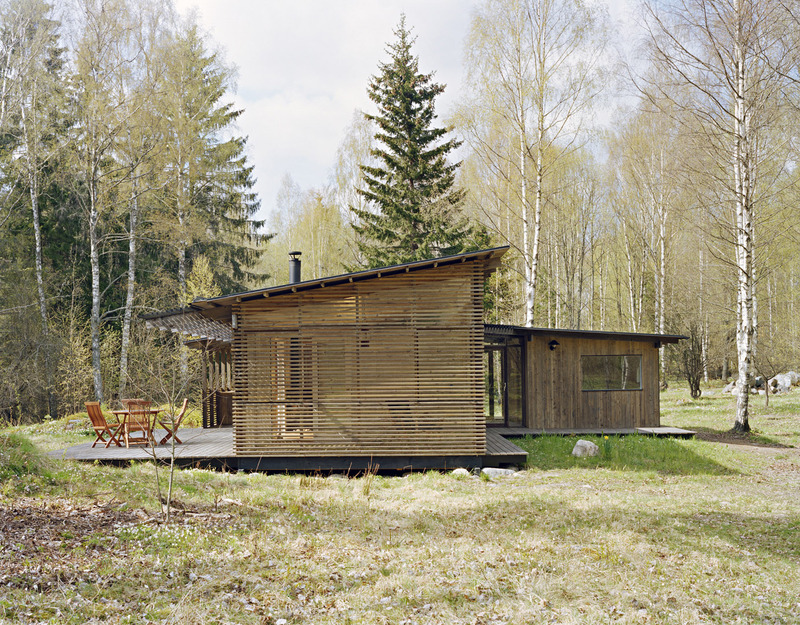 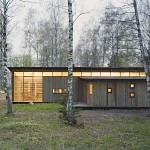 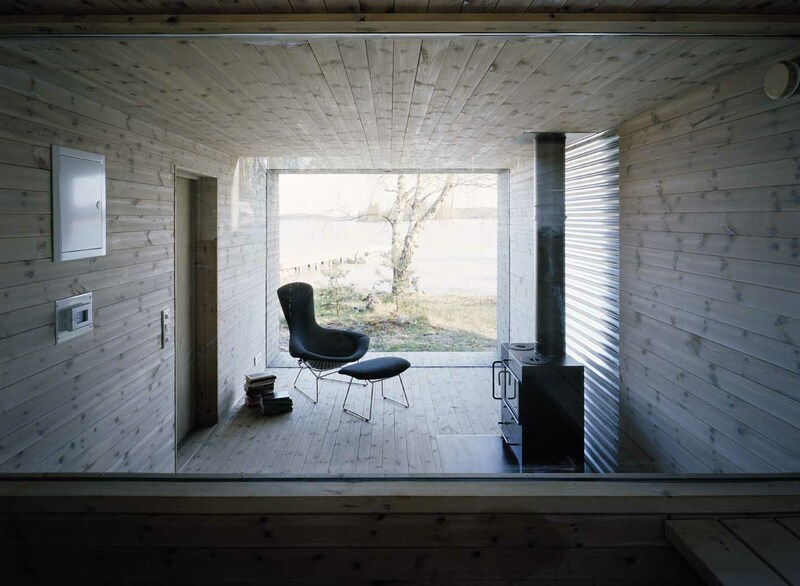 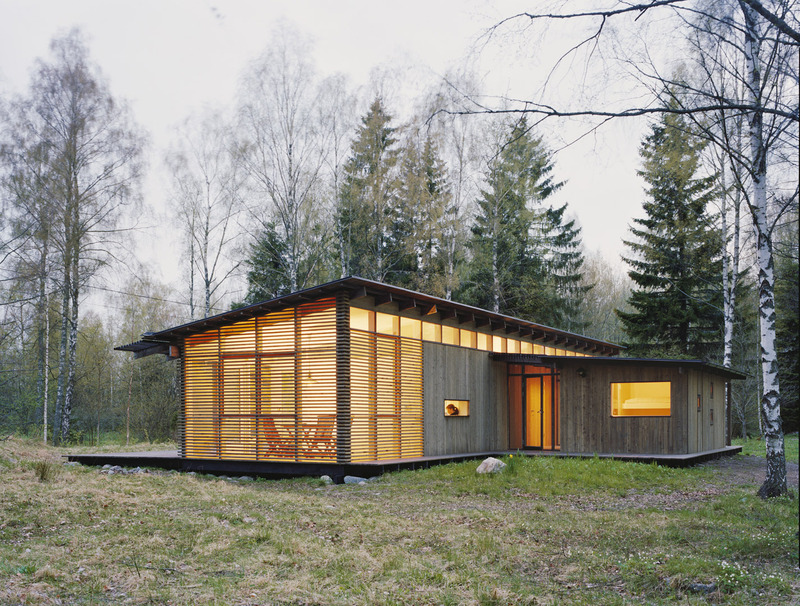 The winner of Swedish Wood Award 2000. 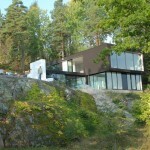 This house was the first project completed by the studio. 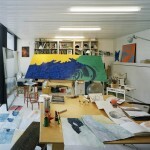 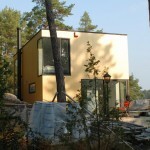 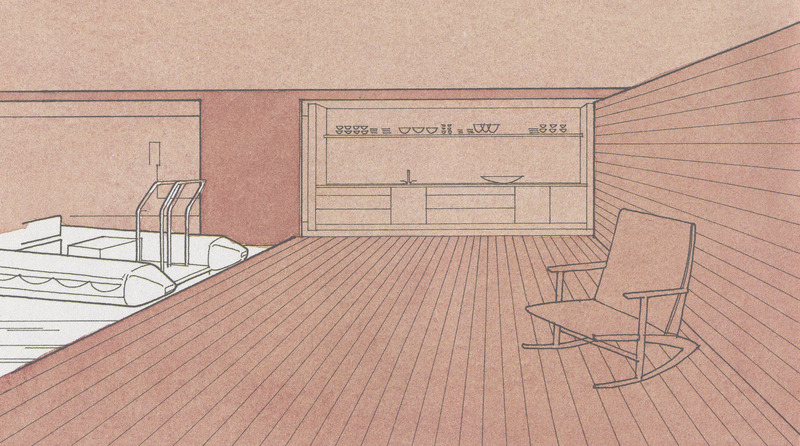 The studio (at that time Håkan and Natasha) carried out both the design and the construction work. 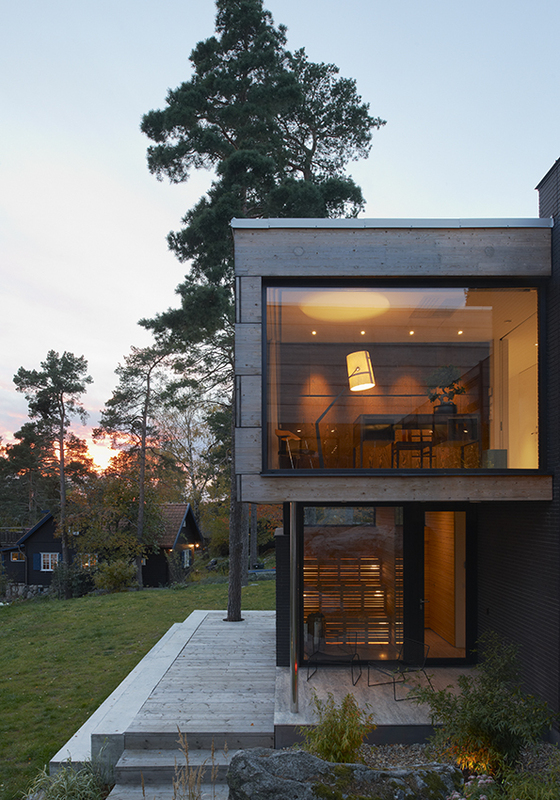 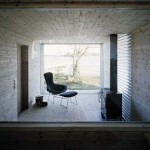 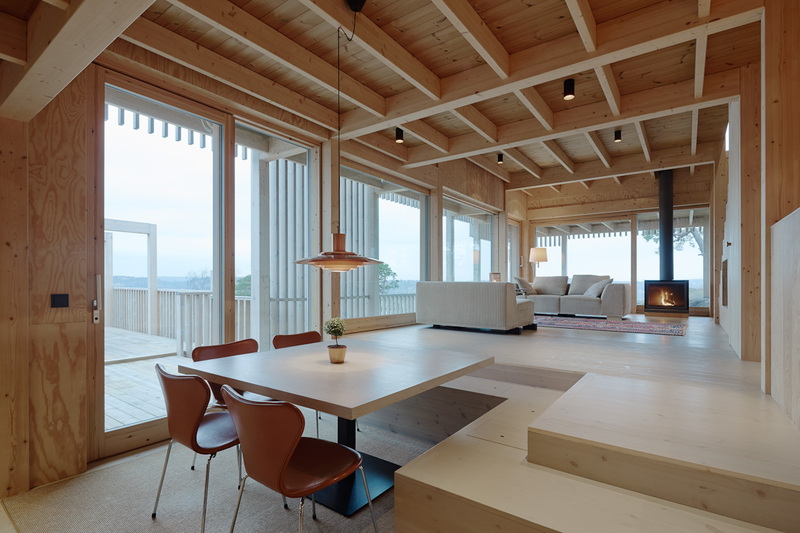 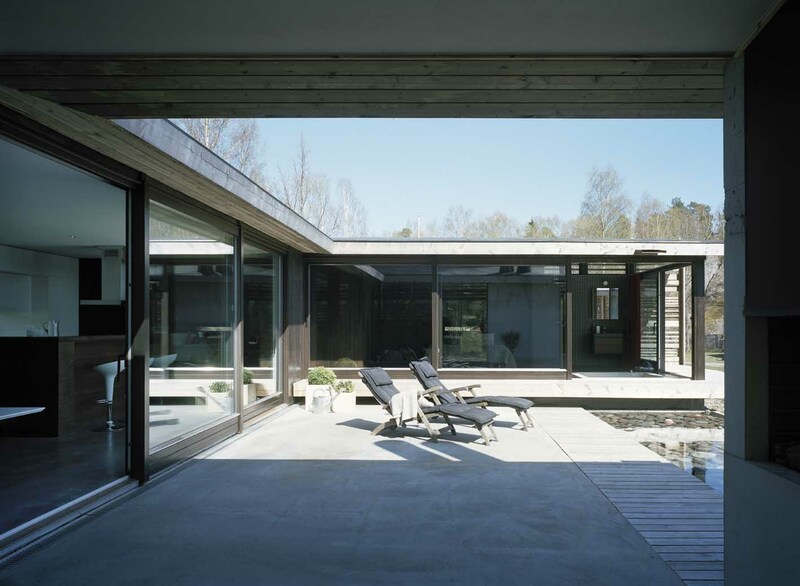 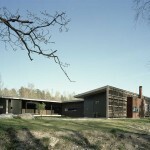 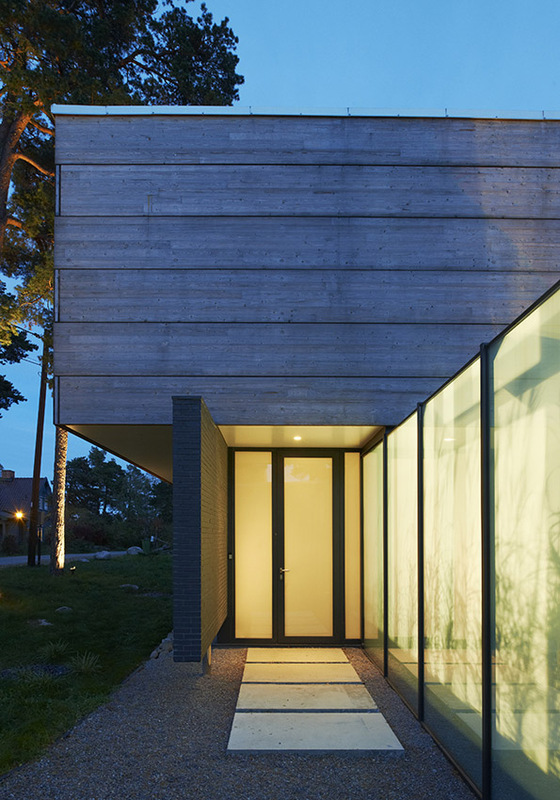 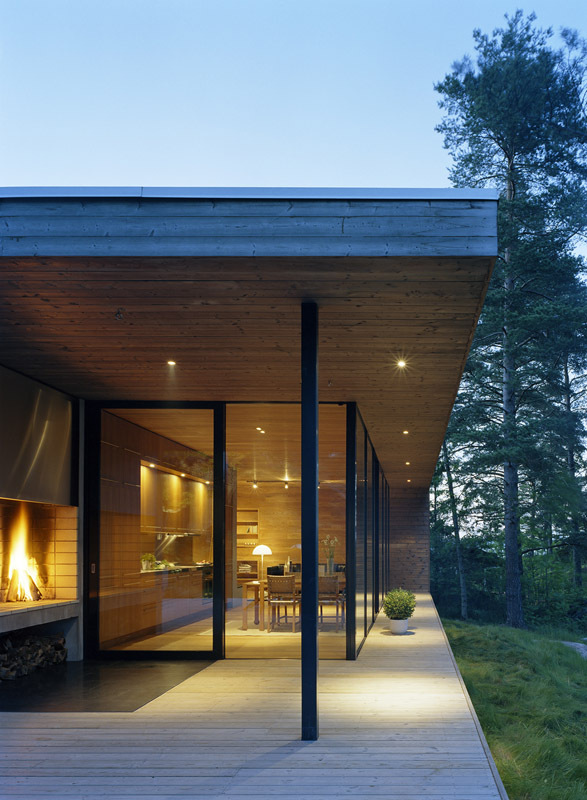 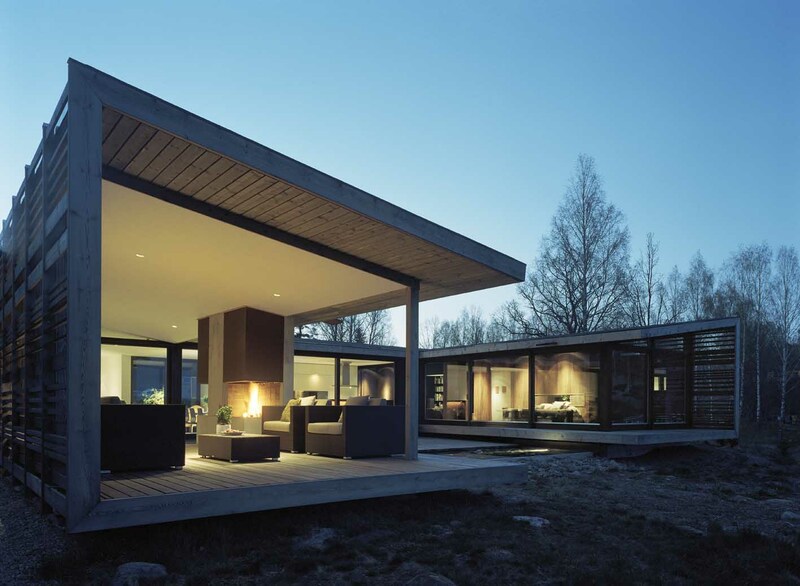 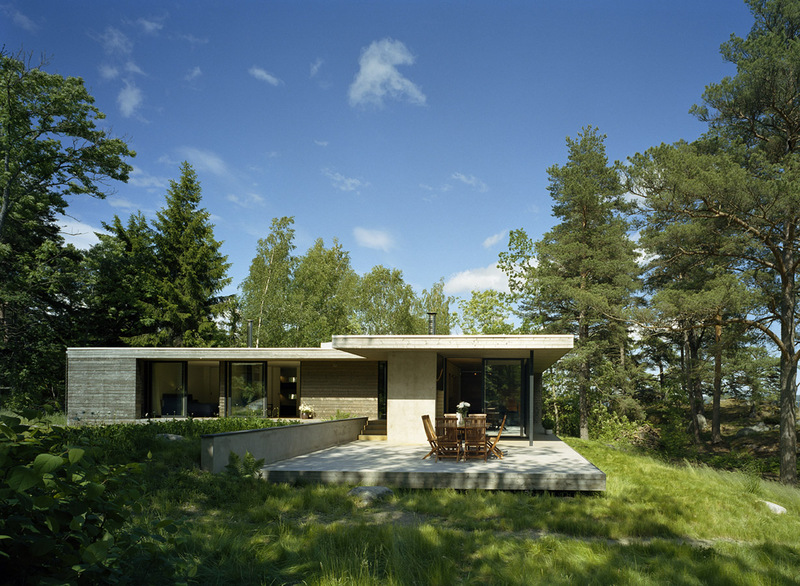 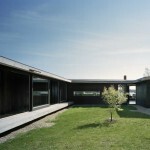 The house has gained a lot of attention and received a number of awards, including the Swedish Wood Award for the year 2000. 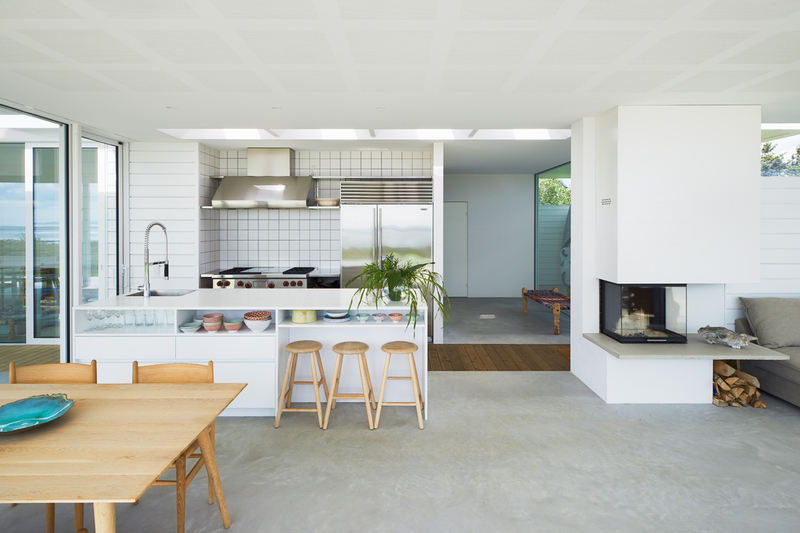 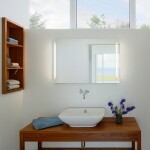 The house is a leisure house for a couple in their sixties and was built for year-around use. 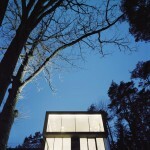 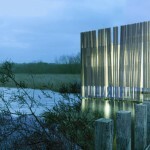 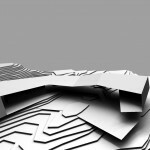 The building was thought of as a tool to help explore the qualities and sensations of the site and surrounding nature. 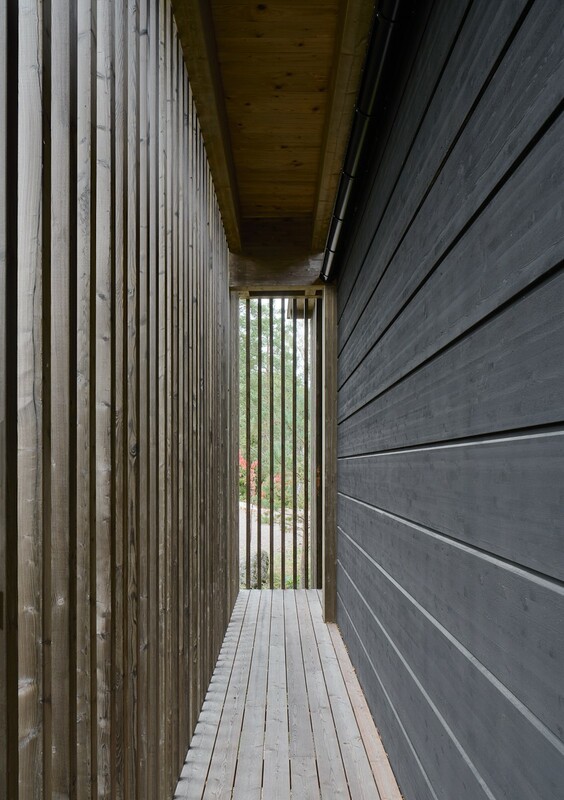 Through conscious handling of the daylight on naked surfaces and shading laths, the mode of climate and weather outside always becomes present inside. 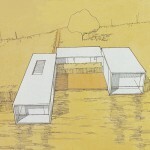 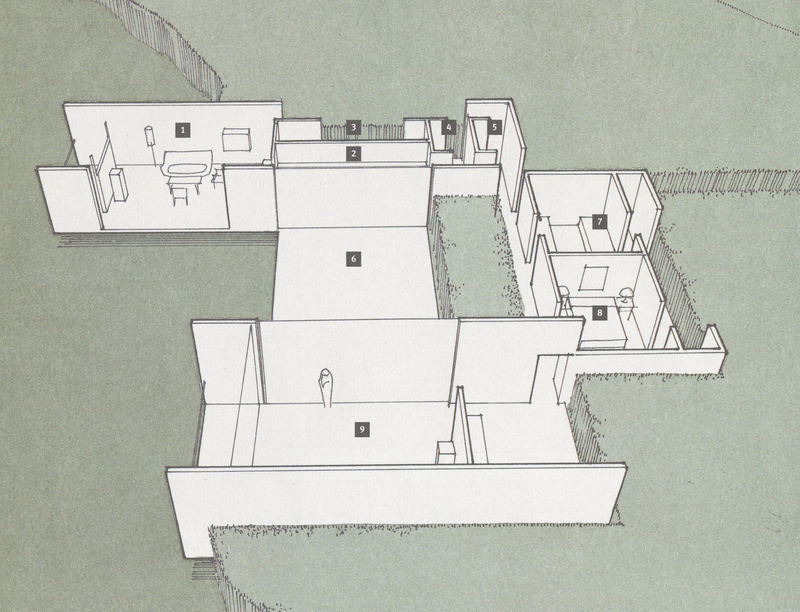 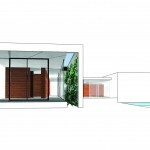 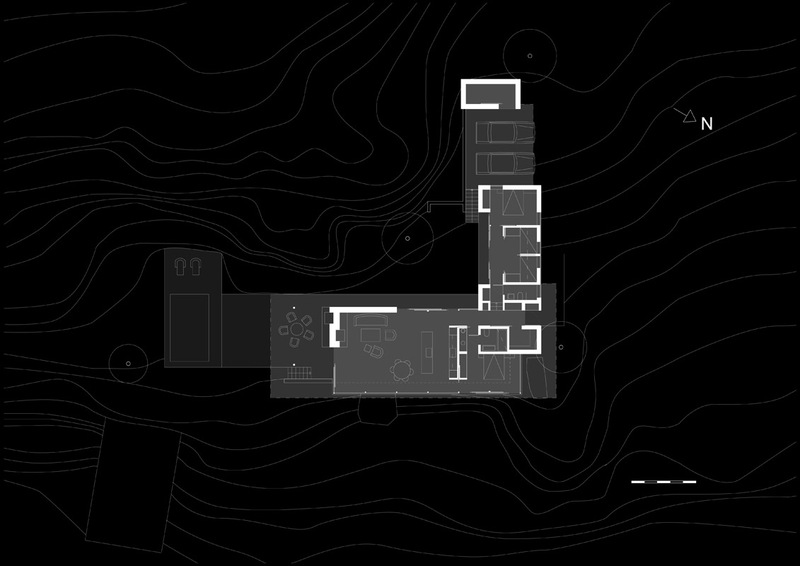 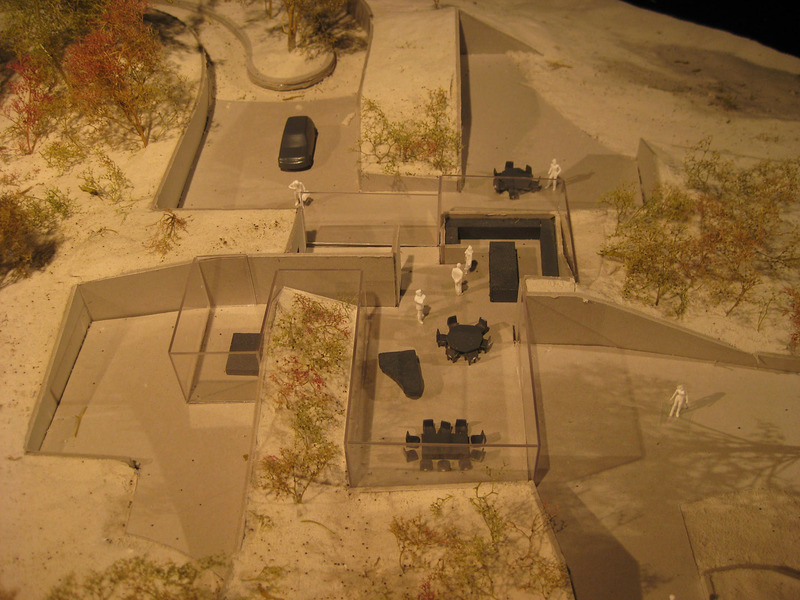 The theme for the plan was to divide the house into different zones, the use of which would depend on the climate and the conditions of the weather. 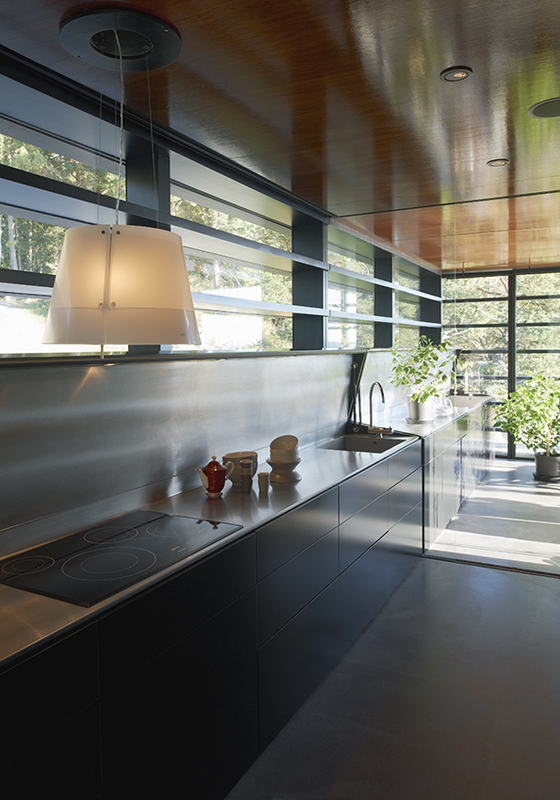 The main functions are concentrated in a core area, which is well insulated and can be heated in winter. 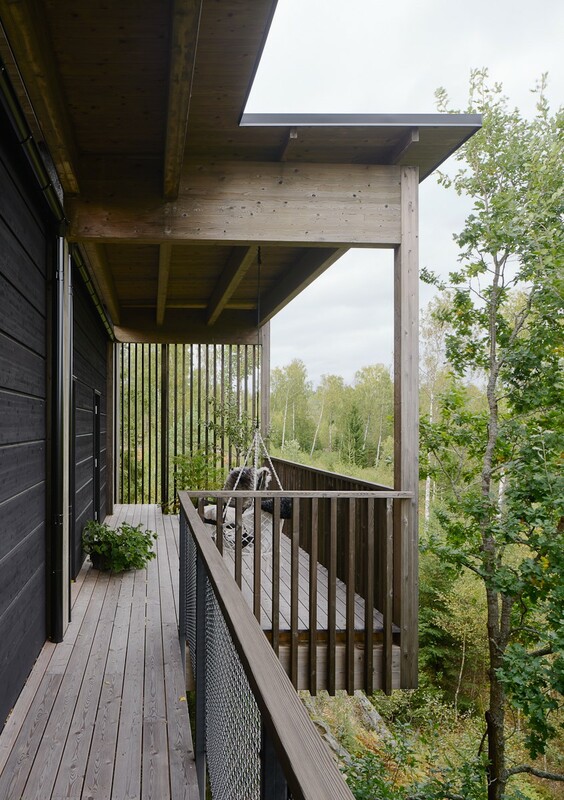 During warmer periods, the habitable area can be extended to the adjoining veranda and hallway, which are heated only by solar radiation. 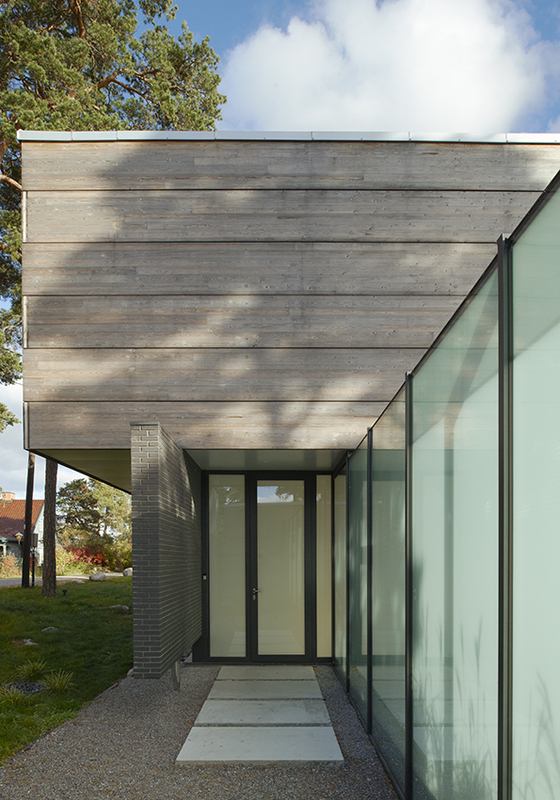 A glazed canopy on horizontal laths provides yet another sheltered zone along the facade.